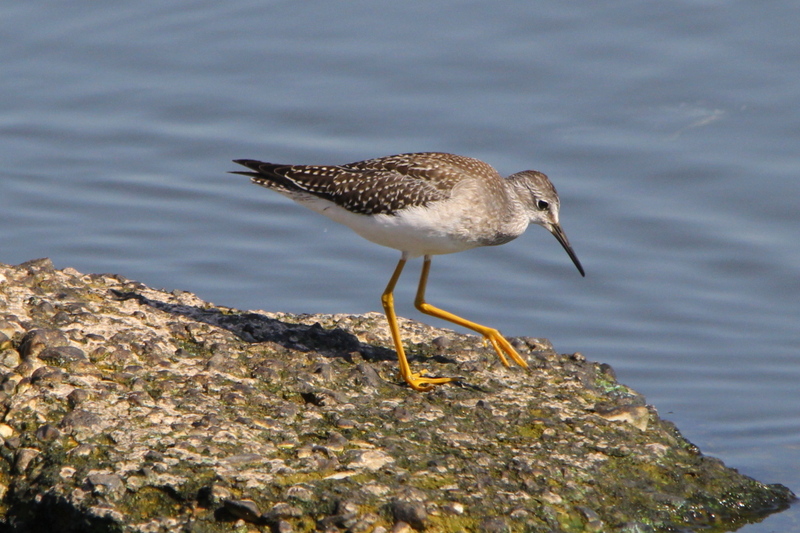 The Lesser Yellowlegs is a medium-sized shorebird similar in appearance to the larger Greater Yellowlegs. 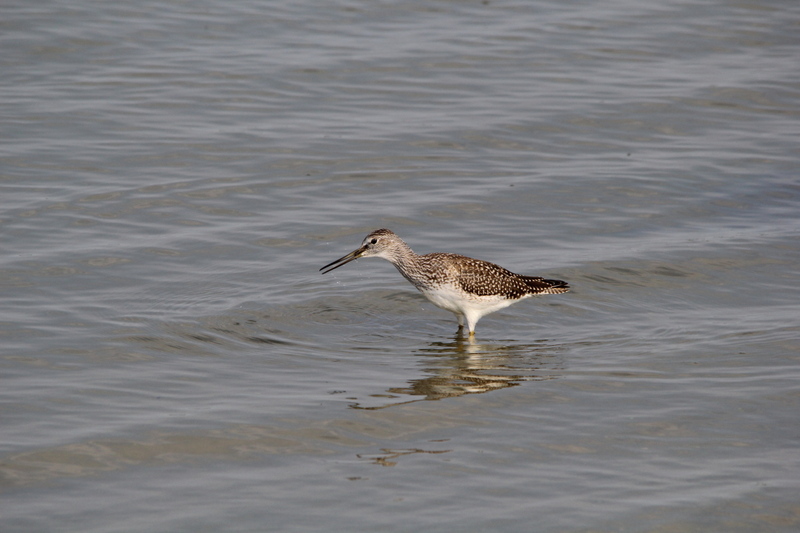 It is not closely related to this bird, however, but instead to the much larger and quite dissimilar Willet, merely the fine, clear and dense pattern of the neck shown in breeding plumage indicates these species’ actual relationships. 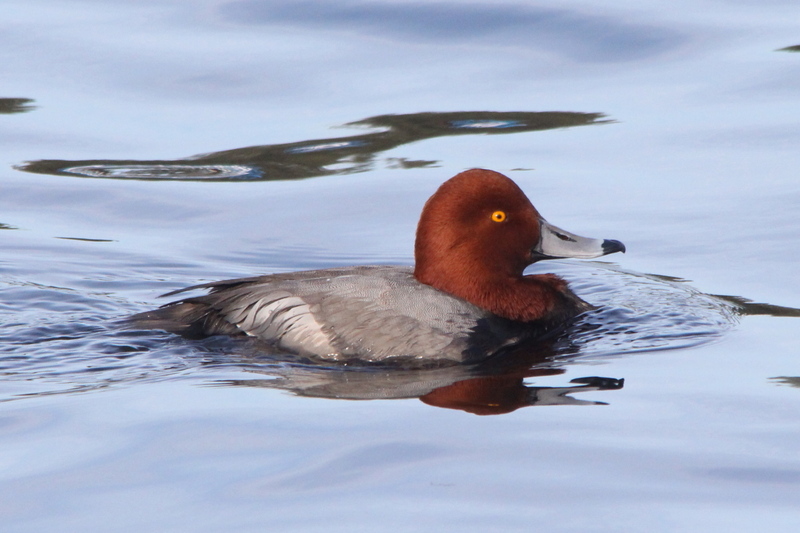 Their breeding habitat is clearings near ponds in the boreal forest region from Alaska to Quebec. They nest on the ground, usually in open dry locations. 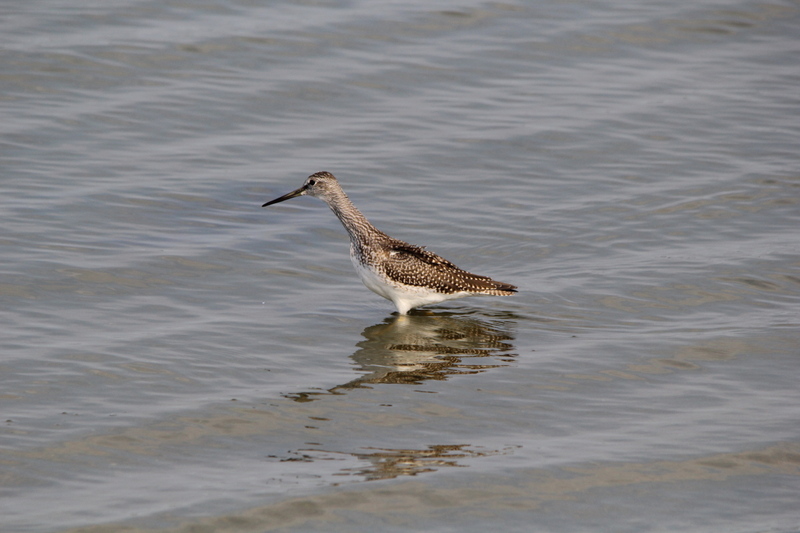 They migrate to the Gulf coast of the United States and south to South America. 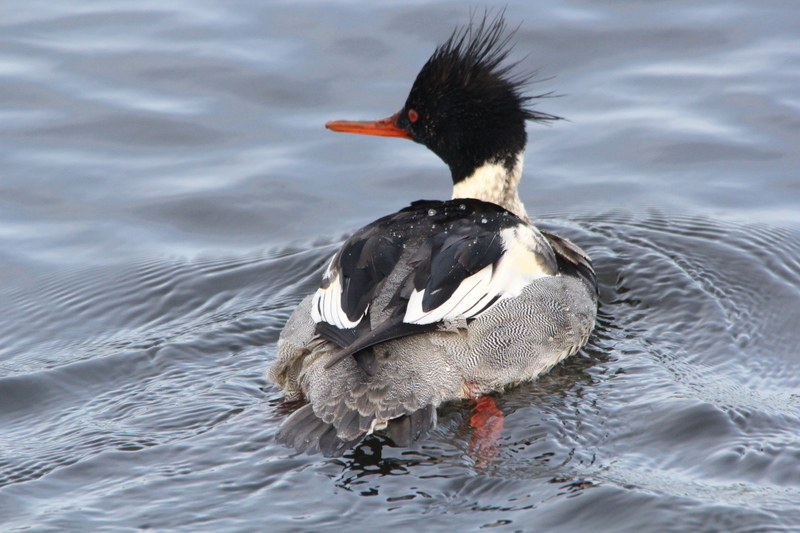 This species is a regular vagrant to western Europe, and the odd bird has wintered in Great Britain. 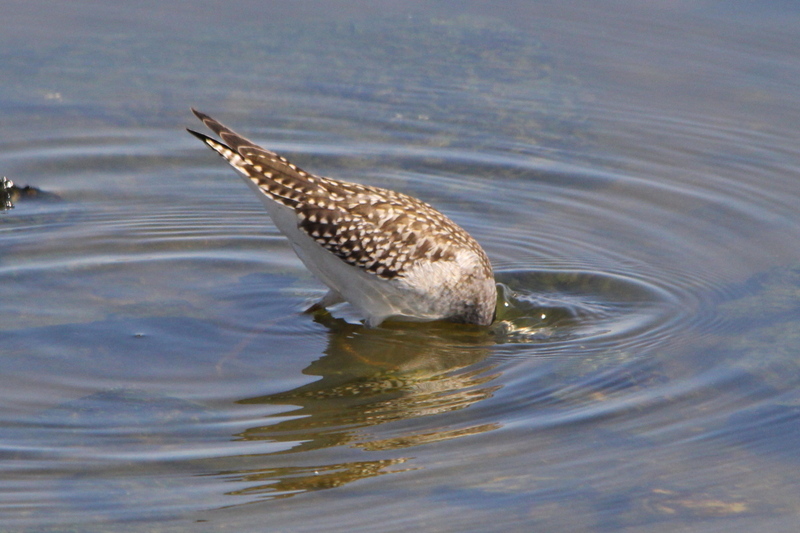 These birds forage in shallow water, sometimes using their bill to stir up the water. They mainly eat insects, small fish and crustaceans. 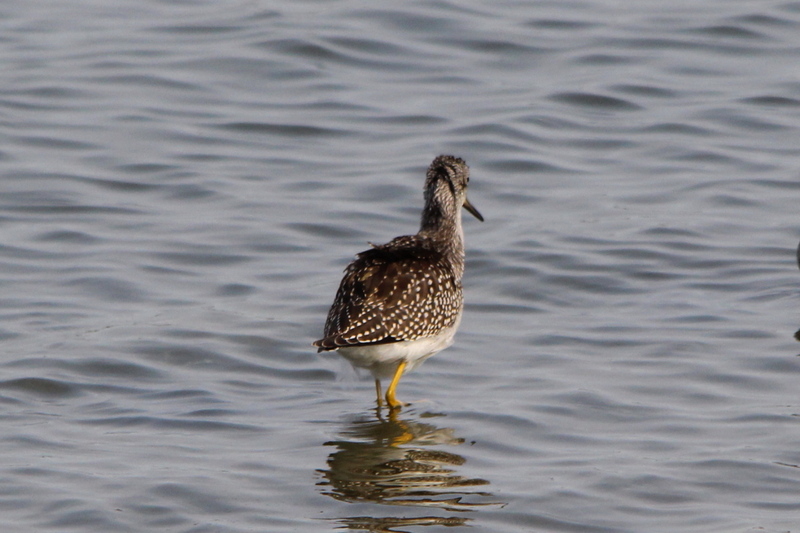 The call of this bird is softer than that of the Greater Yellowlegs. 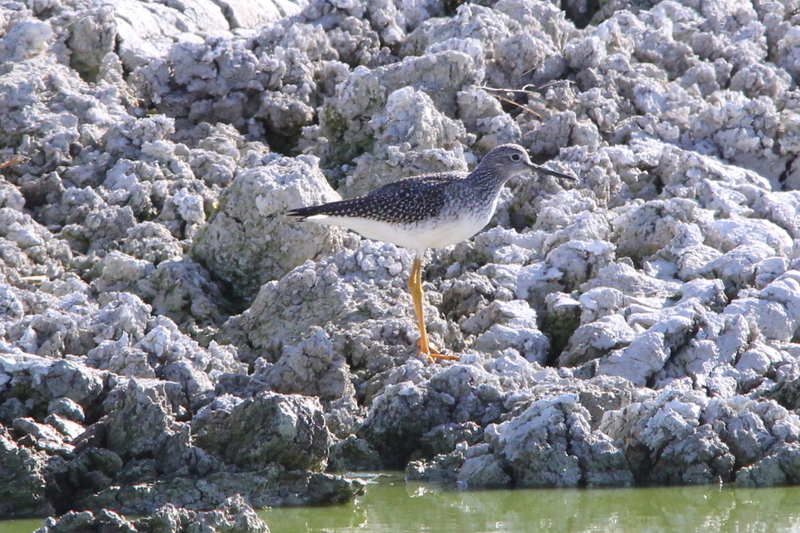 To show the slight difference between the greater and lesser yellowlegs, here are two photos with one of each species. 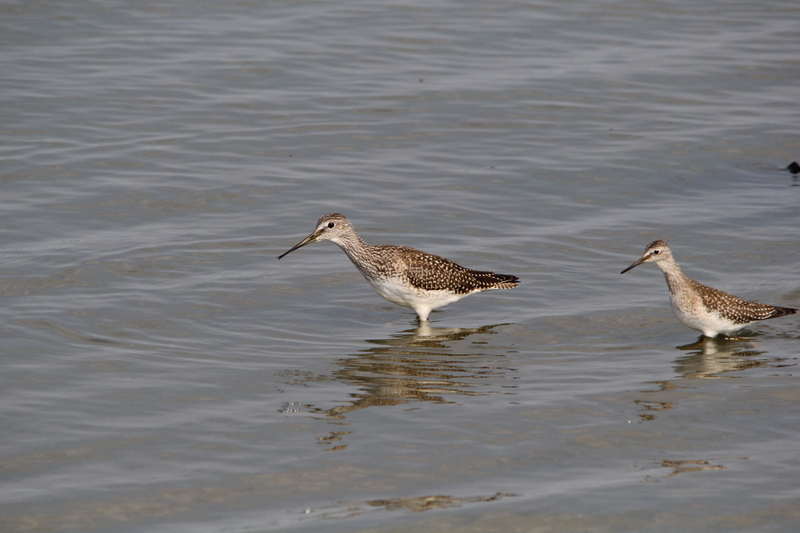 The only real difference that you can see is size, the surest way to tell the two species apart is by their call. This is number 143 in my photo life list, only 207 to go! I ended last week as it was sinking into my thick skull that I am actually getting good at digital photography. I don’t quite know yet why that was so difficult for me to accept, but it was. Now, I’d like nothing more than to build on that, and get even better. Here I am all fired up to go out and get some great photos, and the weather refuses to cooperate! There’s a front passing through the area, it’s gloomy, windy, and of course snowing once again, with harder snow headed this direction. For the record, we’ve now topped 5 feet of snowfall for the season, and we’ll add to that just about every day for who knows how long. The lake effect snow that falls doesn’t usually amount to very much, just an inch or two a day, but it has been a near constant thing this winter so far. I don’t mind trudging through a snowstorm now and then, but when that becomes my daily routine, it gets old after a while. I’m even tired of taking photos of the snow as it falls for the record here. I was going to go to Aman Park today, as it is the most sheltered from the wind of all the places that I go on a regular basis, but I’m asking myself why I should bother to drive that far today. The weather is too bad for me to carry the Beast (Sigma 150-500 mm lens), so even if I saw birds, I doubt that I would get good photos of them. 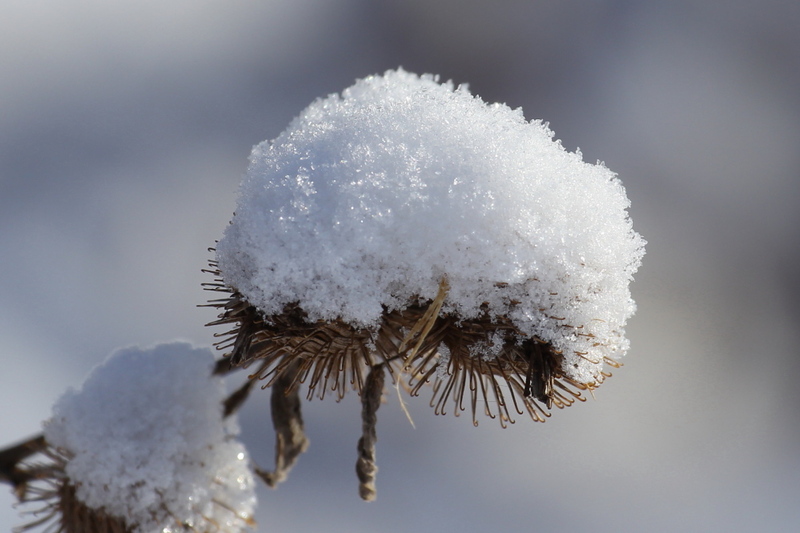 Just about everything else worth photographing will either be swaying in the wind, or buried under the snow. I can trudge through a snowstorm and not take photos here just as well as I can there. I wish that the camera store that I shop at was open on Sunday. Today would be a good day to shop for the odds and ends that I would like to add to my camera gear. Since I have decided to postpone my quest for the perfect lens for birding, and not purchase a 400 mm prime telephoto for a year or two, that will allow me to purchase some of the other things that I need and will probably make more of an improvement in my photos anyway. One of those items is a light source. The built-in flash unit on my, or any camera that I know of, just doesn’t cut it for nature photography. I’m leaning towards an LED panel light, rather than a flash unit. I know that my brother has tried many different methods for lighting while doing macro photography, up to and including one of the ring lights that attach to the front of a macro lens. He gets his best results using a flash unit, and holding it in his hand, with a cord running to the camera to control the flash, rather than mounting the flash on the hotshoe of his camera. I like the idea of an LED panel light, as I can have it on to see how the light will play on the subject that I’m shooting, and, it doesn’t have to be connected or attached to the camera. The other area I need to work on is holding the camera steady. I would say a tripod, but I am looking for more than just a tripod. I have an inexpensive tripod already, it works, sort of. It isn’t very steady, when I used it the last time I could see camera motion from my pulse as I rested my finger on the shutter release to check the exposure settings. That’s not good. I also have a good Manfrotto monopod, but I seldom use it, as it simply screws onto the camera. As large and heavy as the monopod is, that has always seemed like a recipe to ruin the threads on the stud, or in the threaded insert of my cameras. I would also have to remove the quick release plates that fit my tripod from my camera bodies before I could use the monopod as well. That increases the chance of damaging the threads on the various items, as well as the chance of my losing a quick release plate. A good tripod suitable for my needs is quite expensive, more than I can afford to purchase right now, it would cost nearly as much as the 400 mm prime lens, but I think that I can come up with a system in piecemeal fashion. So, this is what I’m thinking. I can purchase a good tripod head fairly soon, and I’ll be able to attach it to the legs of the tripod that I already have, or the monopod that I have, depending on which of those would work the best at the time I need something to steady the camera. It would take only a few seconds to switch the head from the tripod legs to the monopod. I think that I could also attach the head to a window clamp so that I could use it for birding from my vehicle in places like Muskegon, where I shoot many photos from inside my Subaru. Then, once my bank account has recovered, I can purchase a better set of legs to use. I think that all the pieces have ways of attaching together to make what I have in mind feasible, but I’d like to check that fist to see if it will work. I would like to put together a list of the items that will work together, along with prices, so that I can plan everything out. Well, I’m back from my walk, and I think that it’s just as well that I didn’t bother going anyplace today, other than around here. It was sure cold and windy today! I know that there are windchill charts that you can use to calculate how cold it feels like outside in the wind scientifically, but I have one of my own. When it’s so cold that my eyeballs begin to ache, it’s really cold! You have to really feel for the wildlife stuck outside in this kind of weather, I spent two hours out there, and that was enough for me! I shot a couple of photos today, they’re fair, so I’ll start this post with an older one first. 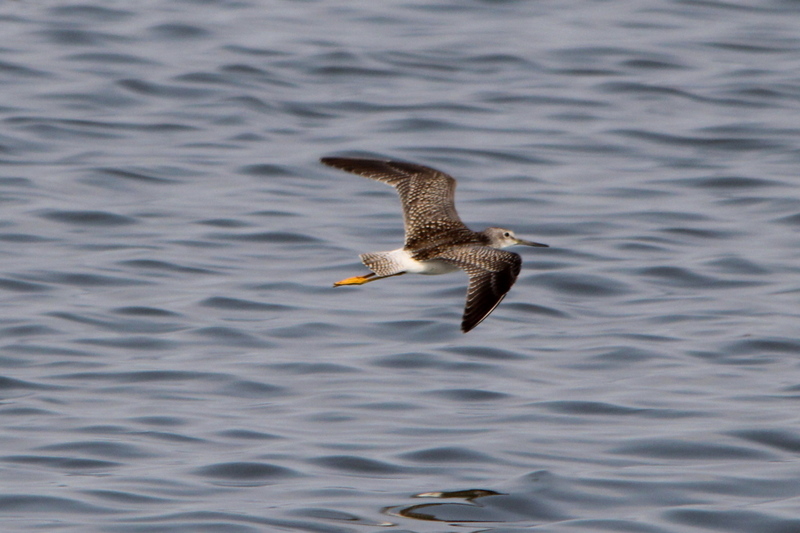 That one was shot last weekend in Muskegon, handheld using the Beast and the Tamron extender for a 700 mm focal length. Hey, at least I got a photo today, that was more than I expected. The photo of the jay, and for that matter, the first photo of the gull, bring up something that I have been forgetting to say. Since the spot where there’s a footbridge across the creek in the park that I walk in everyday was somewhat sheltered from the wind, I stood there for a while so that my eyeballs would stop aching. I was just standing there, not trying to hide at all. 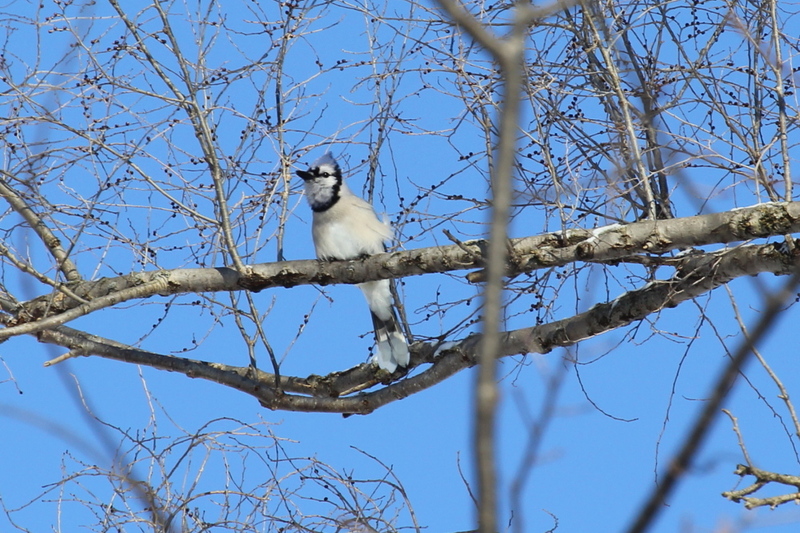 At first, there wasn’t anything around for me to even try to photograph but as I stood there for a while, birds and a fox squirrel emerged from their hiding places, and that’s when I got the photo of the blue jay. The squirrel got quite close to me, the end of the bridge in fact, then it stood there looking at me as if trying to figure out what I was. So I talked to it, and it was off like a shot. I was wearing my usual parka, which is orange and grey, hardly what I would call camouflage of any sort. 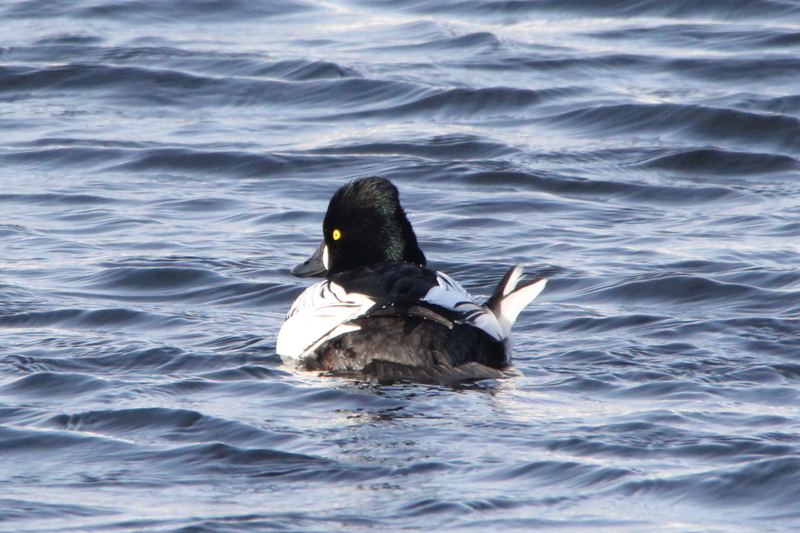 Last Sunday at Muskegon, most of the waterfowl were on the south side of the channel when I pulled into the parking lot, which was good, since I was on the south side of the channel. I hadn’t taken more than a few steps from my vehicle before all the waterfowl began swimming to the other side of the channel, out of range of the Beast even with the extender. I did get close to a couple of ducks that had been underwater when I started walking down the channel, but the rest had all crossed the channel. Once I had gone as far as I could, there is a bench there, so I sat down to see if the ducks would return, and they did. That kind of surprised me, as I was still out in the open, and they could see me just as well as when I had been walking. The only difference was that I was sitting still, rather than moving. 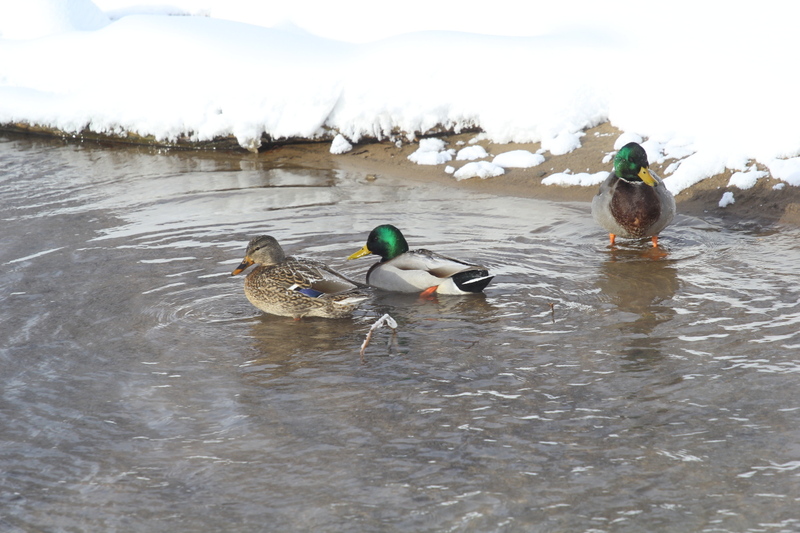 Even though I moved around a little on the bench to get in position to shoot photos, the ducks didn’t seem to mind. My point is, as long as you’re quiet and not moving, wildlife doesn’t seem to mind the presence of humans no matter what you wear. Completely off subject, my brother just sent me what is close to the perfect photo of a chickadee. 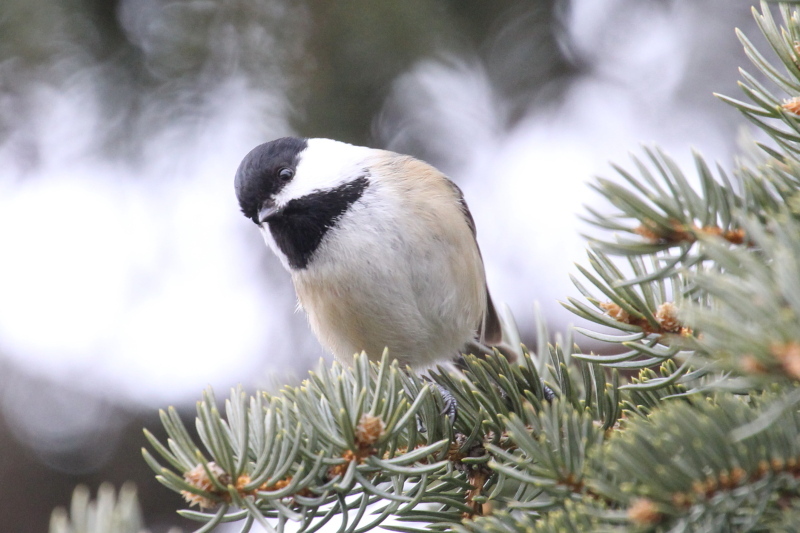 It’s a head shot so sharp that you can see the chickadee’s nostril and little pink tongue. The really cold air is settling in from the north, we’ll be below zero fahrenheit several nights this week, and only in the low teens, if that, for high temperatures. If there’s a bright side to the cold, it could be that it will be a little brighter around here. The wind is out of the north, which means less lake effect cloudiness, if we’re lucky. There’s no sunshine in the forecast for the next eight days, but I think that the forecast may be incorrect on that. Since I had some time on my hands yesterday, I did some playing around with macro photos using my tripod. I also saved the basic settings that I used for those photos to the custom mode of the landscape body, just as I have saved bird in flight settings as the custom mode of the wildlife body. It now takes me less than a second to be ready to shoot macro or landscape photos correctly using the tripod, which makes it much more likely that I’ll use the tripod. As it was, I had to fumble my way through half a dozen pages in the menu to make the changes needed from shooting handheld. Just as when I shot the really good landscape and waterfall photos during my UP trip, my tripod doesn’t do that poorly when the camera is set up correctly. There’s some slop in some of the adjustments which shouldn’t be there when everything is locked down, but when I use the mirror lockup and a two second delay with the self timer, I was able to get some very sharp close ups. That, by the way, is as close as I can get, and the most magnification, using the Tokina 100 mm macro lens and the Tamron extender. That photo was not cropped at all. Another thing that I learned is that a good light source of some kind is an absolute must! That photo required a 30 second exposure time. Of course it was taken indoors using the ambient coming through the window of my apartment, but exposure times that long aren’t going to work well outdoors, and the light inside was about the same as I would find outdoors in a shaded spot. 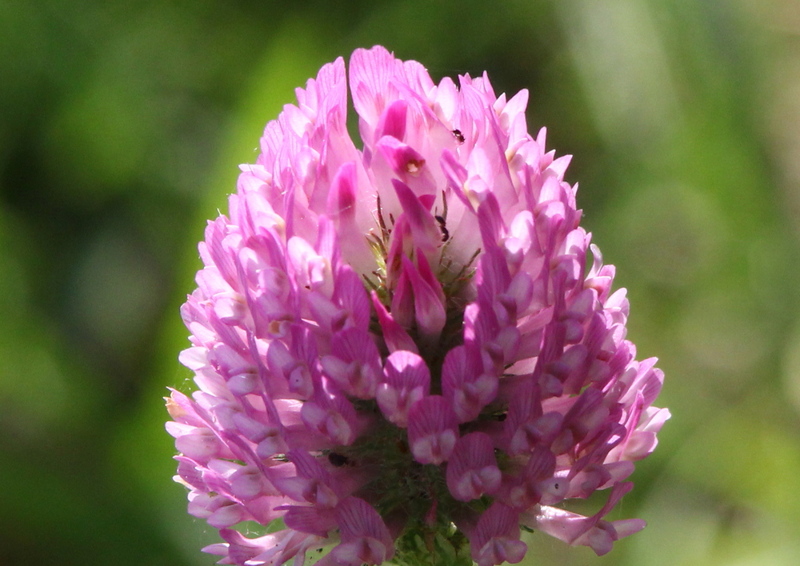 If there’s a hint of breeze in the air, it would be enough to ruin any close ups of flowers or insects on plants which could move with exposure times that long. So, to sum up my testing from yesterday, the camera, lens, and extender are fantastic! My tripod may not be the world’s finest, but I can make do with it for the time being. However, I do have to purchase a light source. I can see how tricky lighting for macro photography is going to be. 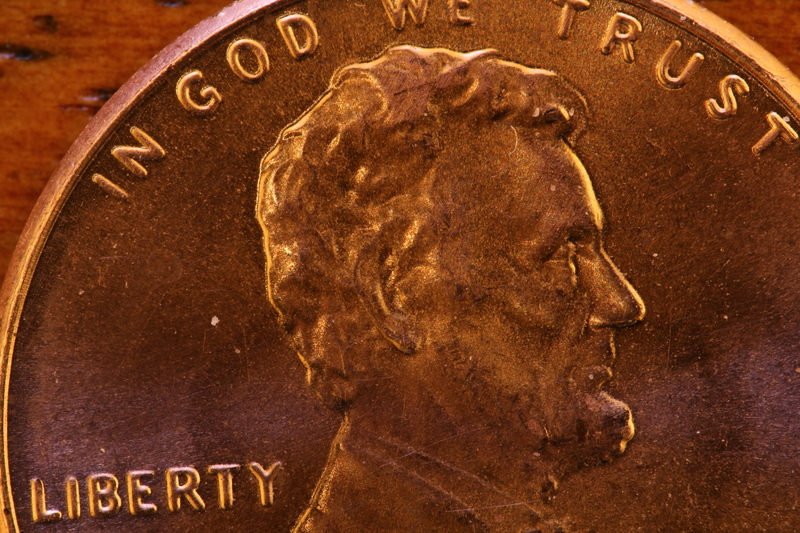 The front edge of the lens hood was about four inches above the tabletop for the photo of the coin. There’s no way to get light from a light source mounted on the camera’s hotshoe on the subject being photographed. Anyway, I am leaning towards taking my time in replacing my tripod, just as I have postponed purchasing a long prime telephoto lens. I want to have some money this year to go out and use the equipment that I already have. Last year, just about every extra dollar I could squeeze out of my budget went to cameras and lenses, and that left me very little to use on excursions to places other than those close to home. I could easily put myself into the same situation this year, but I’d rather not. I have my new tent/cot, or cot/tent, whichever you prefer, which will make camping a lot easier than dealing with a full size tent. I have also learned that I can sleep well in the back of my Forester if need be, which is even easier yet. Somewhere during typing this, I went for my daily walk, and didn’t bring back a single photo. So, I’m going back to August of last year for this one. I don’t have much else to say today, since it’s the day I visit my mom in the nursing home. Sunshine! It’s very cold, but the sky is almost clear as I sit here typing this and drinking my coffee. We deserve it. 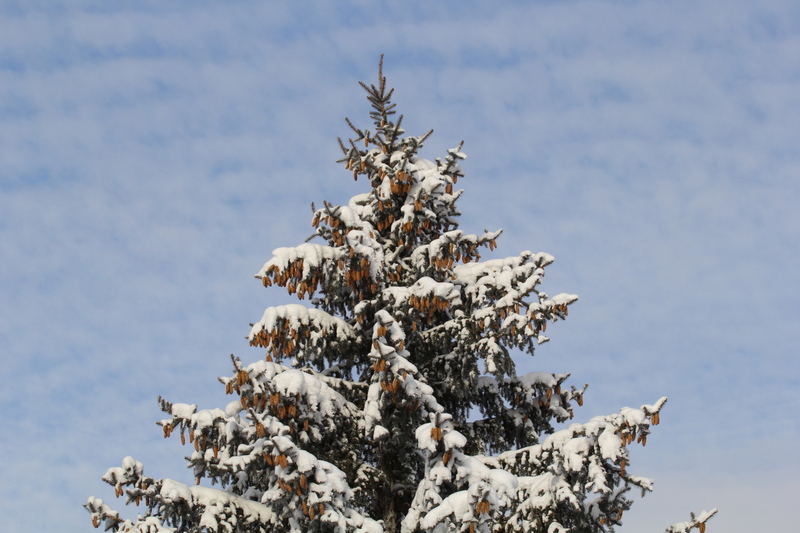 Since Dec. 1, Grand Rapids has had just 15.8% of possible sunshine. That compares to an average of 23%. The most sun we have seen on any single day this month was 57% on the 3rd. We’ve didn’t officially have a single minute of sunshine from the 16th through the 20th. I did a silly thing and stopped at the camera store on my way to visit my mom yesterday, but that story will have to wait until I get back from my walk. I want to get out there and enjoy the sunshine, even if it is only 5 degrees F outside! I may have been out there too early, I don’t think that it really mattered. It was very cold, bitterly cold in fact. It felt colder today than any other day so far this winter, even though there have been days when the temperature was lower, or the wind higher. I also had equipment problems, some how the diopter of the wildlife body was way off today. I wasn’t sure what the problem was, so I waited until I was back inside before fixing it. I used the L series lens and Tamron extender today, the L series lens is a very sharp lens, but it doesn’t auto-focus accurately all the time on the wildlife body, I often have to tweak the focus manually. Since everything in the viewfinder was blurry today because of the diopter being out of adjustment, I had to take what the lens and camera came up with. 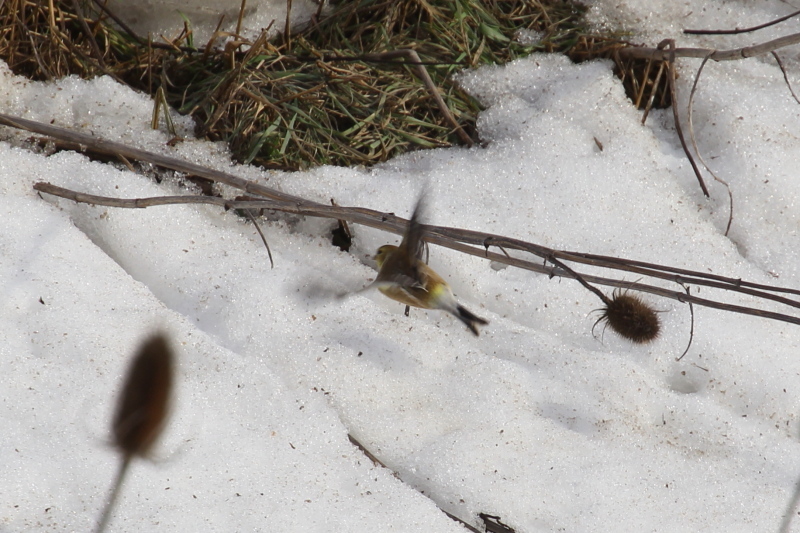 So, I ended up with a mixed bag, with many photos completely out of focus. Here’s the best of the lot. With the sunshine, I was hoping for more, and better photos, but that was all I could come up with today. 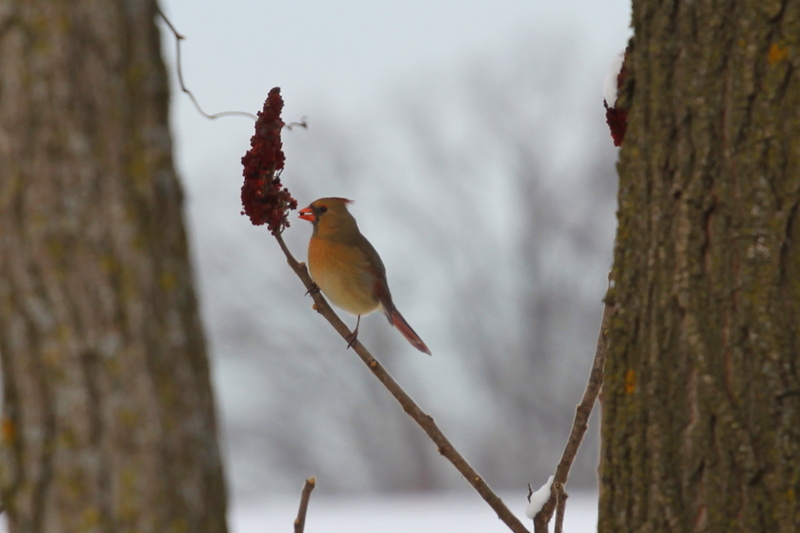 I thought that the sun would bring more birds out, but the cold cancelled out the sunshine. The wind was really rather light, but any wind when it’s as cold as it was is enough to overcome the sunshine as well. I stopped in areas sheltered from the wind a couple of times, hoping that the sunshine would feel good, but it didn’t. In fact, when I got to the lowest point as far as elevation in the park, it was sheltered from the wind, but it felt even colder there because of the cold air pooling there. 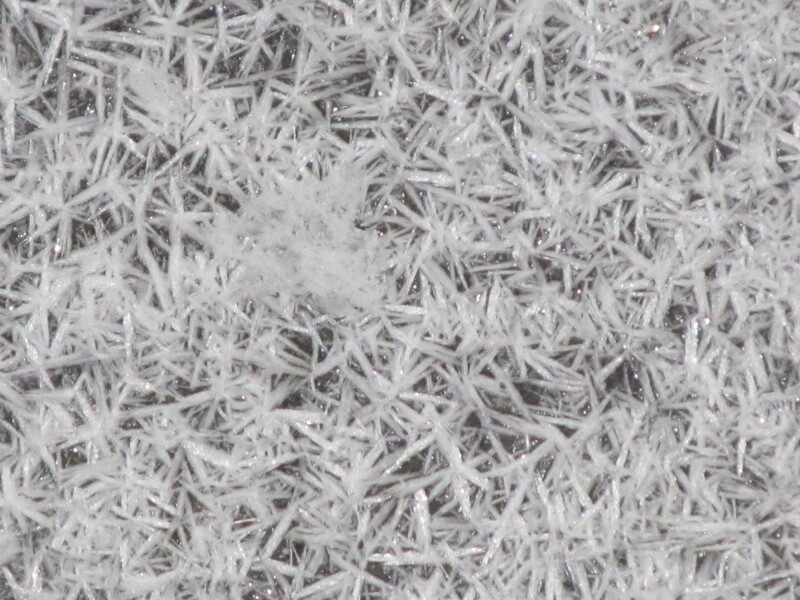 So, before I whine any longer about the cold, I’ll change the subject to my visit to the camera store yesterday. First of all, I ended up talking to the two least knowledgeable of the sales staff there. That’s one reason that I do as much research online as I can, in fact, I’m thinking about making purchases online as well. I do try to buy local if I can, and part of the reason for that has been because of the knowledge of the sales staff as far as knowing the product line and being able to make recommendations. However, the two people I dealt with yesterday had no knowledge of the products that I was asking about, LED light panels and tripods. This could turn into a very long rant if I’m not careful, I’ll only say that I asked if they had a geared tripod head that I could look at, and neither knew what I was talking about. The best part of the trip there was when the store got very busy, and I had the chance to play with the display models on my own, and figure out all the features, because not only didn’t the sales staff know the features, they had told me the opposite of how the things I was looking at actually function. I went there in the first place to pick up an LED light panel. Since I’m planning to go to Meijer Gardens this weekend for the orchid show, and other things indoors, I thought a good light source would be handy to have. The LED panel that I bought is less than half the size and weight of a speedlight, which is a good thing. The output seems very good, as the LED panels are meant for use while shooting video. I haven’t tried it for any photos yet, I will today or tomorrow indoors, so I doubt if I will post any of the test photos. I also picked up a Joby Gorillapod to hold the LED panel in place if I don’t attach it to the camera. Like I said, I haven’t tried it out yet, but this looks like a winning idea so far. I can use the Gorillapod as a tripod for subjects close to the ground, or attach it to the tripod, a convenient branch, maybe even wrap the legs around the barrel of the camera lens if needed. I will post a photo or two sometime if this set up does work the way that I think that it will. I’m almost positive that I’ll be able to get the light where I need it. I had talked myself out of purchasing a tripod for my camera, thinking that I could get by with the one that I have. But, I looked over a carbon fiber Manfrotto tripod that has changed my mind back again. In the first place, it is much more reasonably priced than I thought that a carbon fiber tripod would be, and in the second place, it looks like it was designed for macro photography. It is also less than half the weight of my current tripod, even though it is much steadier than the one that I have now. If I had listened to what the store clerk told me, I would have thought that it was one of the worst engineered items of all times, and I would not be thinking of buying it. I even asked how you were supposed to use it for macro photography close to the ground, and the clerk’s reply was that I would need another tripod. Yeah, right, I’m not about to purchase several tripods to cover a range of heights, let alone carry them all. However, a few minutes of my playing with it, and I had figured out how to use it. The neat thing about it is that you can raise the center post of the tripod all the way up, press a button, and the center post swings to the horizontal position, great for sliding closer or farther away from a subject while doing macro photography. With the legs splayed all the way out, it puts the camera nearly at ground level. It’s a very well-engineered piece of equipment, I fell in love with it! They sell sliding rail systems that you mount to your tripod for just that purpose, to move closer and farther away from a subject. With the tripod that I looked at, I wouldn’t need one of those, making the tripod somewhat more affordable when compared to an aluminum one that doesn’t have the sliding boom feature that the Manfrotto does. Since that model is about a third of the cost that I thought that I would have to pay for a good carbon fiber tripod, I have added it to my list of things to purchase relatively soon. It’s sturdier than my current tripod, but weighs a fraction of what the one that I have now weighs, making it more likely that I will have it with me, and it sets up easier, making it more likely that I’ll use it. Sad, bad news today. The officials at the Kent County airport have been shooting snowy owls this winter. So far, nine have been killed. I could hardly believe it when I read the news, the owls are a protected species, yet it seems that they are being killed at several airports across the country, due to the possibility of plane/owl collisions. If there is any good news on that subject, it is that public outrage over the killing of the owls once the news was leaked about what was happening has caused the officials at the airport to switch to trapping and relocating the snowy owls. I understand the need for air-passenger safety, a snowy owl sucked into a jet’s engine could lead to a catastrophe, but there has to be a better way of dealing with the owls than shooting them. In weather news, we’re back to cold, windy, and snow for today, we had our quota of sunshine for the week yesterday. The longer range forecasts are looking just as grim as they have all winter, continued very cold with occasional snow. The next three weeks are looking exactly like the last three weeks, minus the short thaw that we had. I’m getting really bummed out about the weather. I shouldn’t be, I had a feeling that this winter was going to be a rough one, how, I don’t know, but I had that feeling. If there’s an upside to the weather, it is that because of it, I have been earning close to $100 a week in overtime pay that I wouldn’t otherwise get, which is helping me to afford all the recent purchases I have made. If this keeps up, I’ll have that new tripod a lot sooner than I could otherwise hope to. I’m still ticked off about how uninformed the staff has become at the camera store that I shop at. One of the jerks that I dealt with on Monday is the same one that told me that you had to have a lens with a maximum aperture of f/2.8 to auto-focus when using a 1.4 tele-conveter, wrong! Anyway, I’m going to bring my new panel light along today, despite the cold, and see if I can shoot a few test shots with it. I’m back, and I have to say that the weather out there today was simply lovely, if you’re a polar bear. However, I may be big and fat, but I’m no polar bear. 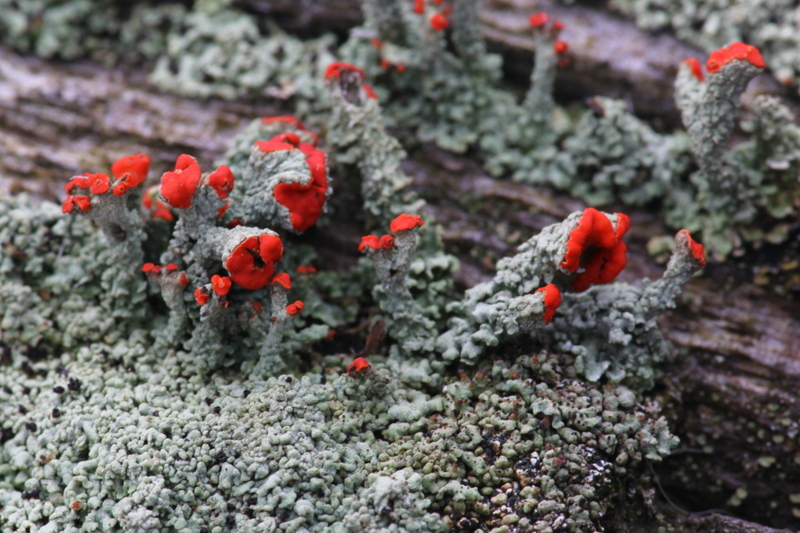 The only photos that I shot were of lichens, and they are not very sharp, so I’m not going to bother posting them. The panel light doesn’t put out as much light as I had hoped, or needed under conditions as they were today, but I want to use the panel light for additional lighting, not the main source of light as it was today. So, the jury is still out deciding if the LED panel was a wise purchase or not. I think that it will work as I had in mind for the right subjects in better weather. What has surprised me is the Gorillapod. They have been on the market for some time now, but they always looked too gimicky to me. But, in playing with the one that I purchased, it works very well. I can wrap the Gorillapod around the lens hood of my lenses, and it and the panel light are light enough so having them out on the end of the lens isn’t a problem. On the shorter lenses anyway, I haven’t tried that set up on the Beast, as the Beast is heavy enough all by itself. I can see that I’ll be able to position the panel light just where I need it one way or another using it mounted to the Gorillapod. Looking at the filter on the front of the L series lens, I can see why I’ve not been getting sharp photos the past few days, it’s filthy. Well, let me rephrase that, it has a coating of what is probably salt spray from the roads that I walk along getting to and from the park. I’ll give it and all my lenses a good cleaning after I finish this today. I know that I have a serious case of the winter blahs right now. There are photos that I probably could be getting, but I’m not. I’m getting geared up, and fired up for spring if it ever arrives. I want to photograph flowers, butterflies, and other subjects which aren’t around right now. That’s okay, this winter may be costing me money as far as the camera gear that I have been buying, but I’m saving a lot of money by staying home most weekends for the time being. I have decided that my finances are in good enough shape that I’ll purchase the tripod that I fell in love with on Monday. That will be my final “big-ticket” item for the foreseeable future. The poor weather will give me time to play with my new gear indoors, even if I don’t post the photos here. That way, when spring does get here, I’ll familiar with how everything works together, and it should result in better photos sooner this spring than if I had waited until then to start using my new gear. 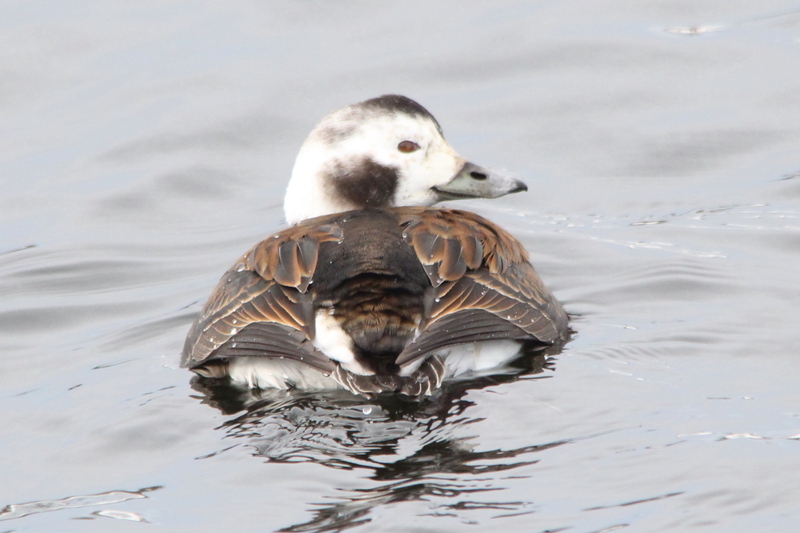 For the photo for today, I’m going back to last Sunday for this one of a demure female long tailed duck. Time to clean some lenses. There’s more sunshine streaming through my windows this morning, normally that would have me rushing out in hopes of some good photos, but not so much this morning. As harsh as this winter has been so far, and looks to be for the next three weeks, I’m not going to chase birds or any wildlife when they are struggling to survive. It’s only a couple of degrees above zero fahrenheit, so I’m in no rush to get out there today. I see that the countdown to spring widget that I added to my blog is very optimistic, as it now reads one month til spring. 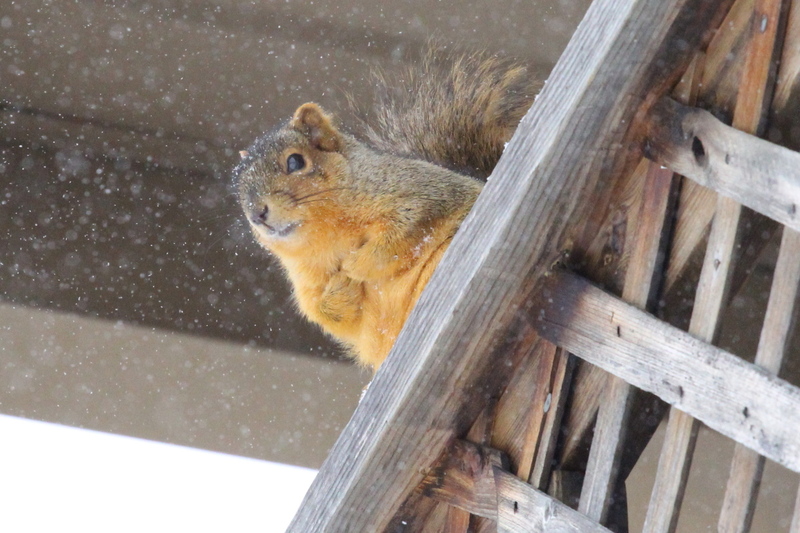 It may not be until April or even early May before the traces of this winter are gone. I cleaned all my lenses yesterday afternoon, then set up the L series lens and Tamron extender for some near macro photos indoors using the tripod. I was very pleased with the results that I got, especially when I used the new LED panel light. As I expected, with the light mounted to the camera’s hotshoe, there was glare on the subject, and the light was rather harsh. So I switched the light to the Gorillapod, dimmed it a little, and set it up to the side slightly, and the results were about perfect. I have very high hopes for this set up once spring finally arrives. I also checked the pricing of the tripod that I would like to purchase from several of the large mail order camera retailers, and found that the prices were significantly lower if I were to purchase through one of them. So much lower that I could buy the tripod and a ball head suitable for my needs for what I would pay for the leg set at the local store that I normally shop at. I do try to buy local when I can, but one thing that the local store have to do for me to shop there is provide service and information, if they can’t, then I’m better off saving money by doing my shopping online. I’ll be back after my walk. Call me crazy, but I felt the first hints of spring today, I swear that I did! I’m not about to start packing away my winter clothes, far from it, in fact, I suspect that we’re going to get even colder weather in February than what we’ve had so far. But, for the first time since last fall, I could feel the warmth of the sun penetrating all the way in to my tired old bones. It felt so good that there were several times when I just stood there soaking it up. At first, I thought that I may have been imagining it, but when I got to the metal footbridge over the creek, I could see that the sun was melting the snow on the railings. Ten degrees Fahrenheit, and the sun was strong enough to melt snow. That means that while there’s still a lot of winter left to endure, the corner has been turned and that I’ll begin seeing more signs of spring coming soon. I even managed a few photos today. I took the L series lens and the Tamron extender, and when that combination focuses correctly, the results are excellent! However, the one problem that I have had with the L series lens since I purchased it, is that the auto-focus is off a touch at the close up end of its range. The Tamron extender seems to make that problem even worse. When I shot the test shots indoors yesterday, I had to switch to manual focus, use live view, and zoom in to get the focus correct. That’s par for the course with the L series lens. 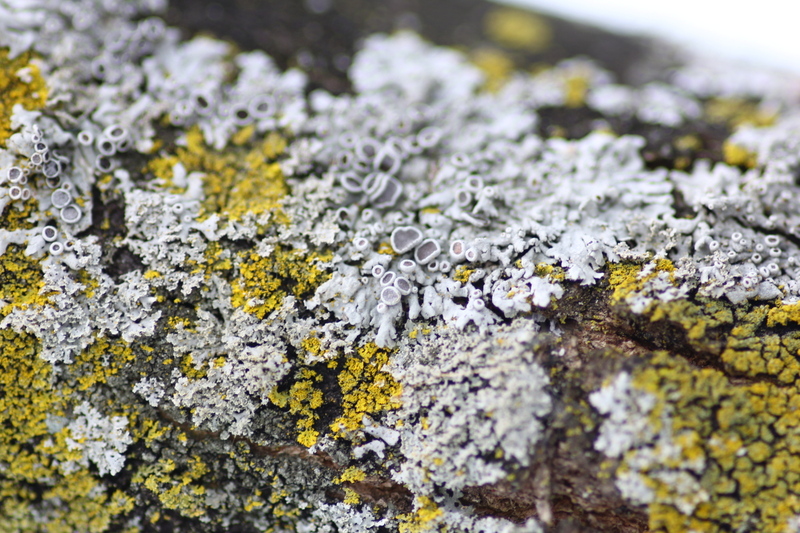 Today, I tried a few lichen photos, but every one of them is off slightly as far as focus. The L series lens focuses better when I use it on the landscape body, I have thought about switching the intended use for the bodies, but the wildlife body works so very well with the Beast, and the landscape body works so well with the 15-85 mm lens and Tokina macro lens, that I’m afraid that I’d regret making the switch. Once spring gets here, the L series lens won’t get much use anyway. Anyway, here’s a few of the other photos from today. 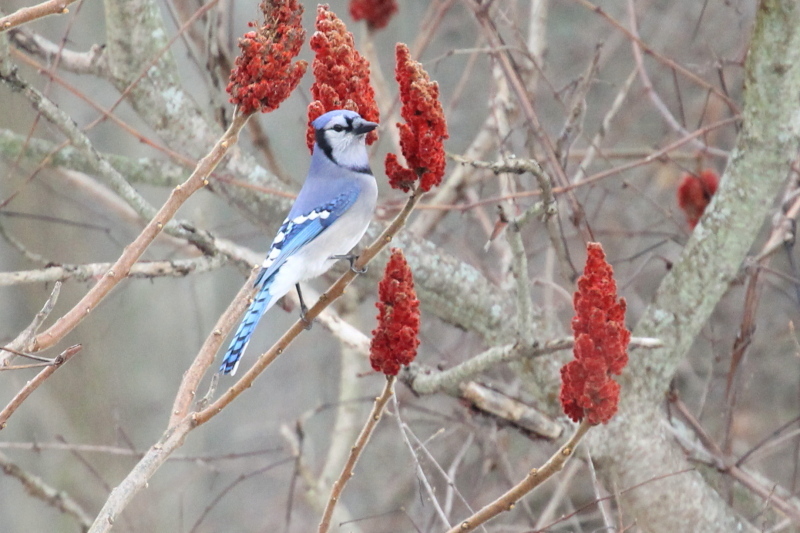 I saw a few other birds, but they didn’t pose as nicely as the jay did, and as I have said, I’m not going to chase them until the weather gets nicer. I think that I may have come up with a way of relieving myself of any feelings of guilt about purchasing the tripod that I would like online. It’s the leg set that is on sale online, for $80 off the regular price, the price that the local store is asking. I’ll see if the local store will match the online price, if not, I’ll purchase the legs online. When they arrive, I’ll purchase the ball head from the local store. It works for me. Now, it’s time for a shower and a nap before work. As I have proof read what I have already written, one thing that I forgot to add stands out. It was sunny with a light wind on Tuesday, but the sunshine didn’t feel warm to me. The conditions were almost exactly the same on Thursday, but I could feel the sun’s rays penetrating my clothes and warming up from the core. Could the angle that the sunlight hits the Earth have changed so much in two days? I would say that I had been imagining the sun’s warmth, but I also saw that it was melting the snow, not just on the footbridge railing, but on one of the benches in the park. We are gaining several minutes of sunlight each day, so maybe there was enough of a change. One thing I know for sure, it sure felt good to feel Old Sol again yesterday. There’s no chance that I’ll be feeling the sunshine today, as the clouds are back, along with a stiff west wind. Conditions are going to get even worse for the next day or two. I’m not looking forward to working tonight at all, as they are predicting close to blizzard conditions for tonight into tomorrow morning. I think that I’ll go to Frederick Meijer Gardens on Sunday, I’ll have to remember to make sure that both camera batteries and my new LED panel light are fully charged before I go. I’ll save my ranting about the tripod for later, right now, it’s time to report on my walk today, not that there’s a lot for me to say. The word for the weather today is dangerous. 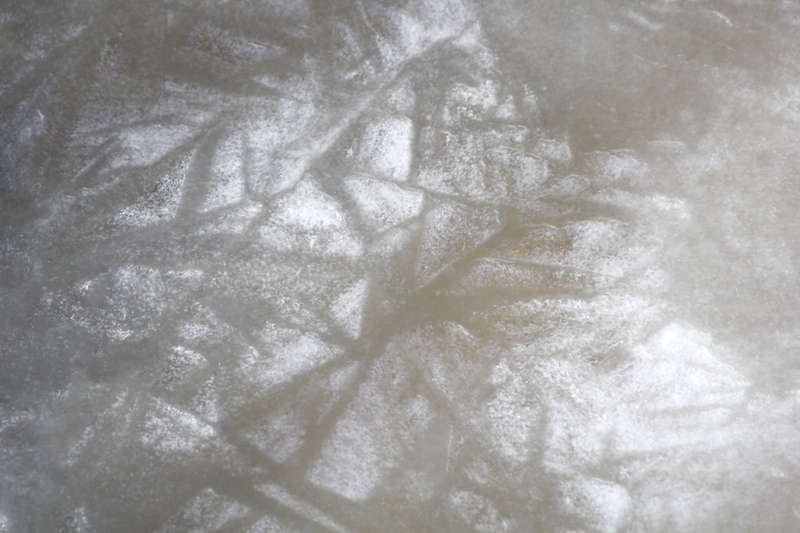 Between the bitter cold and the high winds, frostbite was a distinct possibility. For most of the time I was out there, I had my neck sock pulled up over my nose, and my knit cap and hood of my parka pulled down to my eyebrows, leaving just my eyes exposed. It was still cold, the kind of cold that makes my joints ache, and affects my thought process. It’s really hard to believe the difference from yesterday when it felt pleasant, despite the cold. I wimped out and walked through the subdivision to reach the park, rather than walk up and over the hill that I have to go over if I take my normal route to the park. That hill isn’t really much of a hill, but it is the highest point around, and completely exposed to the wind. I’m glad that I took the coward’s way to the park, the thought of battling the wind had no appeal to me what so ever. 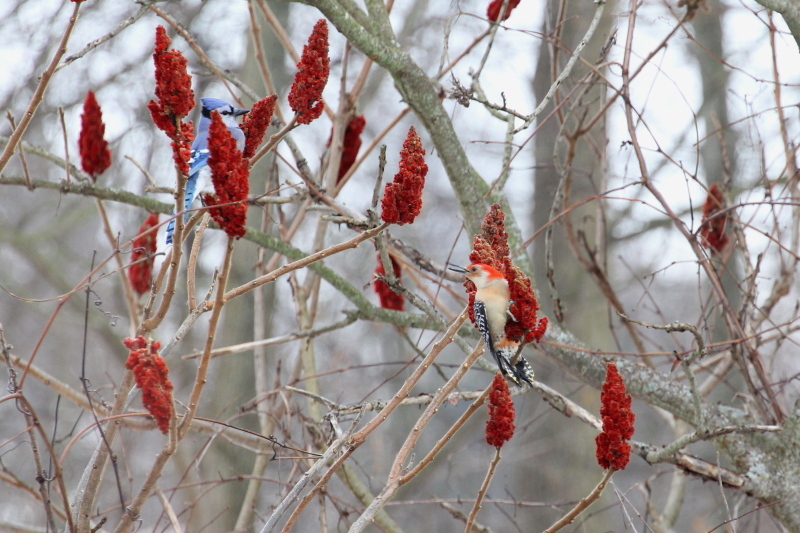 Walking through the subdivision, I did see a few birds huddled around bird feeders in the yards along the way, but I didn’t shoot any photos of them, or anything else for that matter, it was too darned cold. The forecast for both tomorrow and Sunday is much the same, although the winds will be a little lighter. If the forecast is correct, I may stay indoors tomorrow and start my income taxes, and my spring housecleaning in my apartment. That way I’ll have those things out of the way when, or maybe I should say if, the weather ever gets better around here. Looking at the longer range forecast, we may see a moderating trend next weekend, I sure hope so, even though my guess is that it won’t last long. Well, I took a short break from this to get a nap in before work, and to order the tripod that I want so badly. I may have been crazy to do that as well, but I don’t think so. I couldn’t pass up the chance to get a light carbon fiber tripod for under $300. If that model is being closed out, the new model will probably be more costly, that’s hard to say. I do know that the one that I just ordered is much lighter than its aluminum twin brother, about a third less weight, and I know that the new one will be much steadier than the one I’m currently using. I also know that being able to rotate the center column 90 degrees and slide it horizontally saves me from buying an accessory to do much the same thing. So in the long run, I should have less money into this set up than if I had gone another way. Since I didn’t shoot a single photo today, here’s another from last Sunday. That one was a test of sorts, I shot it using the Tokina 100 mm macro lens just to see how sharp it was, it passed the test in my opinion, even though the mallard turned its head at the last second. Any thoughts that I was having about going for a walk today were just put soundly to rest by the white out that occurred outside my window. The garages, which are less than 100 feet from my window disappeared in the snow. I could barely make out the line of cars parked 25 feet from where I’m sitting. I had enough of that last night. I could whine about all the problems I had driving for work last night, but I’d rather forget that last night ever happened. This storm has been the real deal, the authorities in Indiana had closed most of the major expressways, other than the toll road, so I had to slug it out on the back roads to and from our branch in South Bend. Here in Michigan, they’re having trouble keeping the roads open due to the number of abandoned cars left where they got stuck and couldn’t go any farther. There are two bright sides to this storm, one, I made a few extra dollars last night in the way of overtime. The other is that my little Forester handles deep snow with no trouble at all, so I could weave my way around the few stuck vehicles that I had to avoid on my way home from work, once I had finally gotten back to Grand Rapids. It feels weird knowing that I’m not going for a walk today, I can’t remember the last time that I skipped a day. It was probably a little over a year ago, when I was moving from my old apartment to this one. As I type this, I can hear people outside working to get their vehicles unstuck, so it’s just as well that I not venture out anywhere today. I had the passing thought of going to the orchid show today rather than tomorrow, but I think that I will stay home, do my taxes, and clean my apartment. Since there won’t be any photo from today, I went back to my photos from my vacation this past fall for this one. There’s no spring-like weather in the forecast for this upcoming week, so I chose that one because it reminds me of spring, even though it was taken in the fall. Well, I guess that since I’m not going for a walk today that I really don’t have anything else to say, other than I’m sick of winter and I hope that we get an early spring. That’s it for this one, as always, thanks for stopping by! 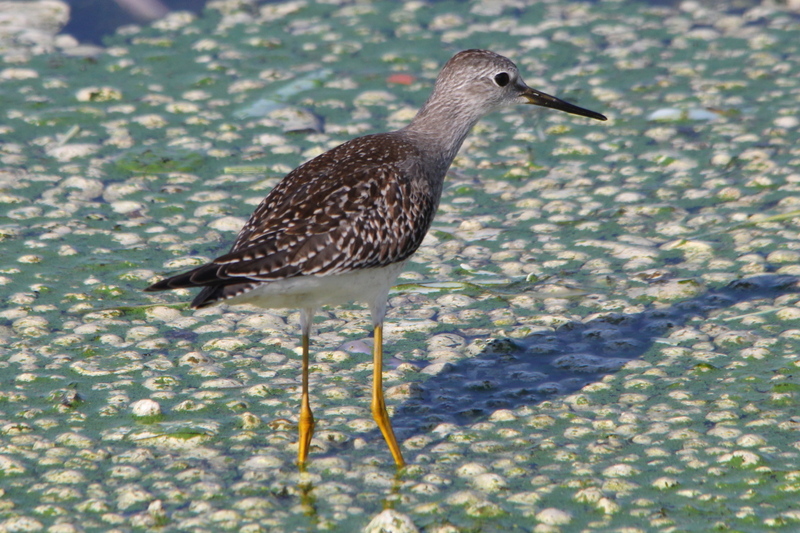 The Greater Yellowlegs is a large North American shorebird, similar in appearance to the smaller Lesser Yellowlegs. 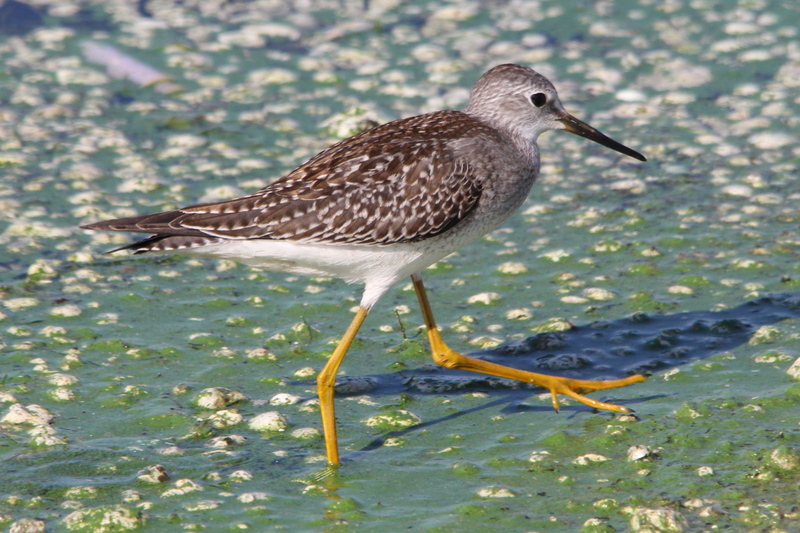 Adults have long yellow legs and a long, thin, dark bill which has a slight upward curve and is longer than the head. 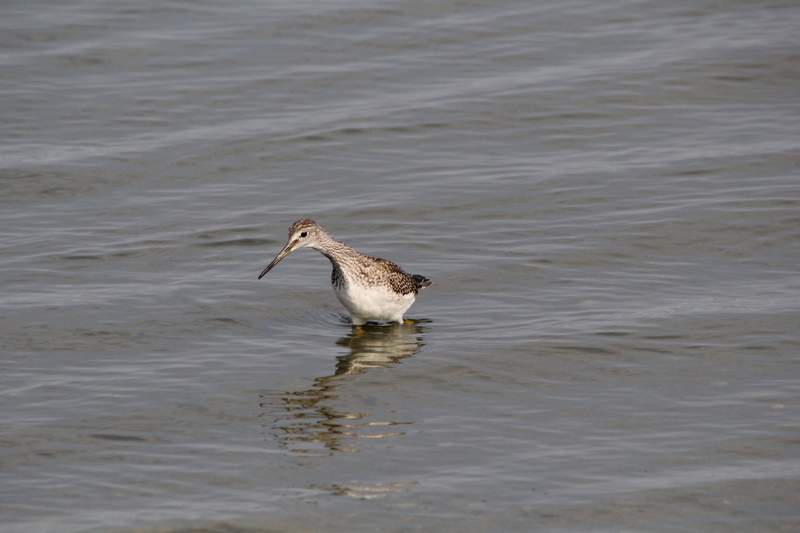 The body is grey-brown on top and white underneath; the neck and breast are streaked with dark brown. The rump is white. It ranges in length from 29 to 40 cm (11 to 16 in) and in weight from 111 to 250 g (3.9 to 8.8 oz). 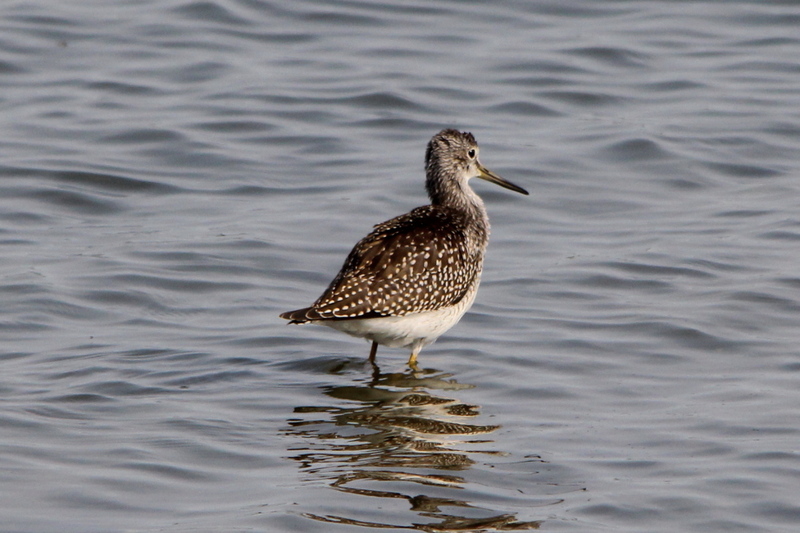 Their breeding habitat is bogs and marshes in the boreal forest region of Canada and Alaska. They nest on the ground, usually in well-hidden locations near water. The three to four eggs average 50 mm (2.0 in) in length and 33 mm (1.3 in) in breadth and weigh about 28 g (0.99 oz). The incubation period is 23 days. The young leave the nest within 24 hours of hatching and then leave the vicinity of the nest within two days. They migrate to the Atlantic and Pacific coasts of the United States and south to South America. They are very rare vagrants to western Europe. 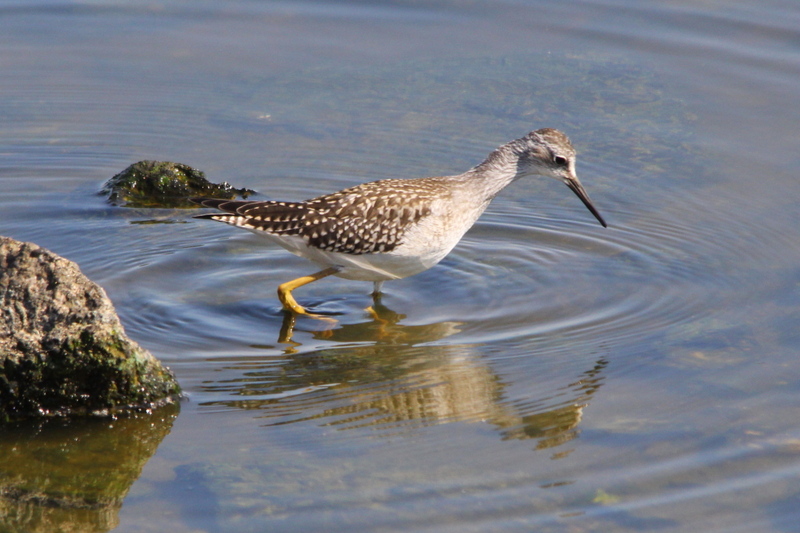 These birds forage in shallow water, sometimes using their bills to stir up the water. They mainly eat insects and small fish, as well as crustaceans and marine worms. It often walks in sand or mud and leaves clear tracks; it can be possible to gather information about this species using its tracks. 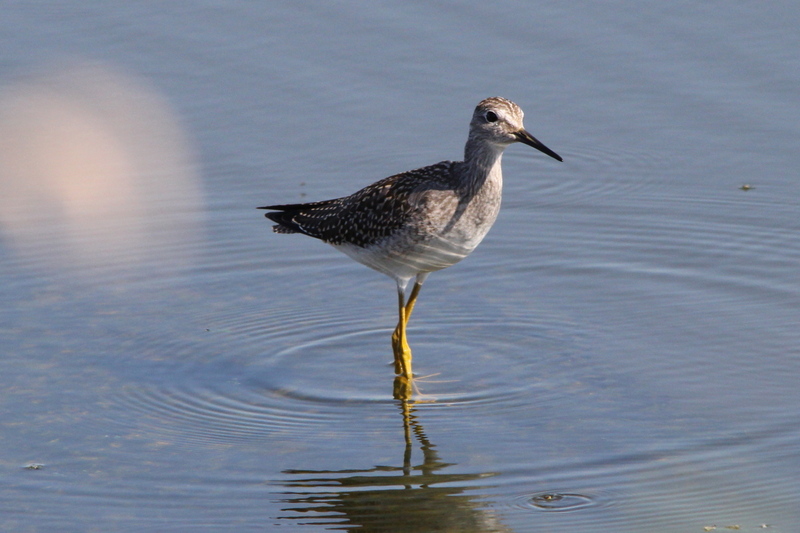 The call is harsher than that of the Lesser Yellowlegs. This is number 142 in my photo life list, only 208 to go! As has become my typical routine, I’m up before sunrise, drinking coffee, pondering the week ahead, and looking back, a little. I ended last week’s post after I had purchased a Tamron 1.4 tele-converter, and I’m dying to try it out with some of my lenses in some better light than I had yesterday. I bought the extender mostly to use with the Tokina macro lens, and occasionally with the Beast (Sigma 150-500 mm lens), but I was pleasantly surprised by how much the extender increased the versatility of my 70-200 mm L series lens. Since the extender doesn’t change the close focusing ability of the lenses it is used with, the L series lens becomes very close to being a 280 mm macro lens on the close-up end of the scale. That extra 80 mm also seemed to make more difference than I expected for longer shots. I suppose that I shouldn’t be that surprised, after all, I got by with only a 70-300 mm lens on my old Nikon. I know that the photo quality will suffer a little when I use the extender, but, I can still get photos good enough to make me happy when I use it. hopefully I’ll get a chance to test it further today. Okay, that brings us to today, and where I should go. My best chance of seeing sunshine would be to head east, away from Lake Michigan. But, it’s been a while since I’ve been to the big lake, and I’m also chomping at the bit, so to speak, to take some photos of birds. Of the places that I go often, Palmer Park has been a complete bust for birds, or anything else since late summer for some reason. 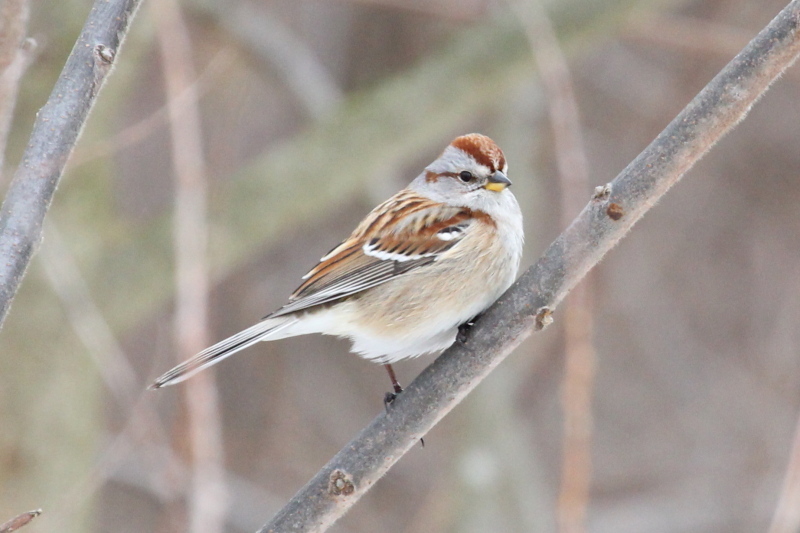 Aman Park has been better for birding this winter, which is somewhat unusual. 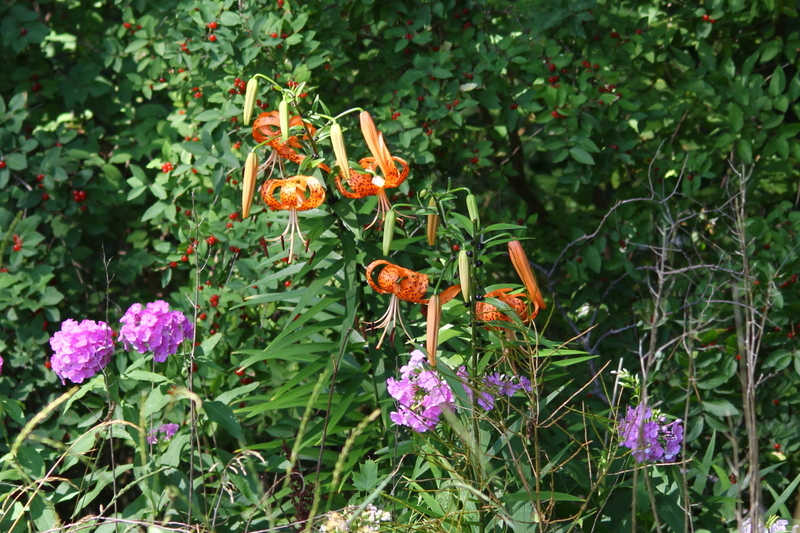 Aman Park is much better known for the spring wildflowers than for birding. 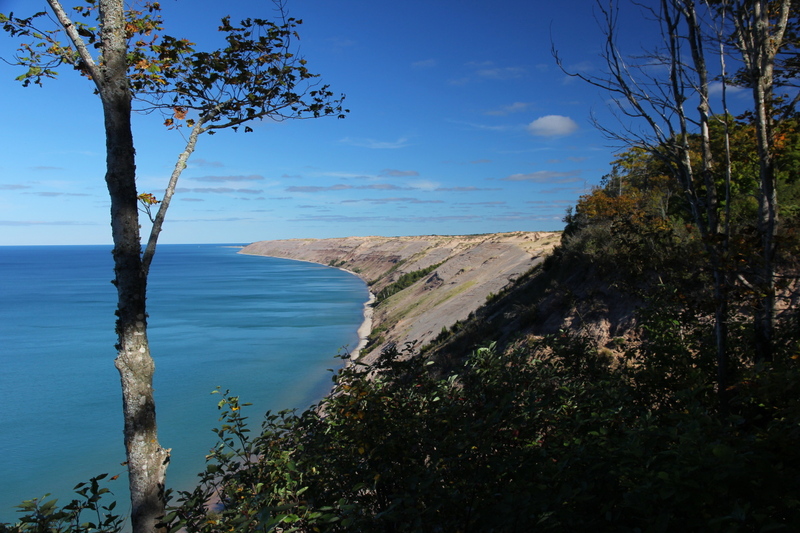 Anyway, I’m thinking Lake Harbor Park today, even though it is on Lake Michigan. I know that I’ll find the widest variety of birds there, along with chances for some landscape photos as well. Another thing going for it is that it’s only a hop, skip, and a jump from the Muskegon Channel, so I can make a quick stop there after my hike at Lake Harbor Park. Well, today was a huge learning experience for me, or should I say that I had to relearn the art of manually focusing, along with learning a few other things, which I’ll touch on as I go. 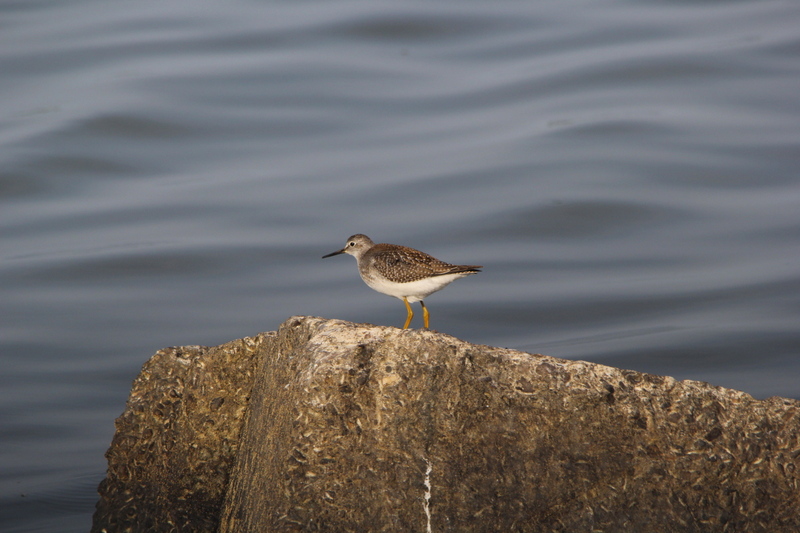 I went to Lake Harbor Park, and there were plenty of birds to practice on, but I have few photos to show for the time that I spent there. It’s not that I didn’t shoot many, but most of them are bad. There was little light, a 30 MPH wind blowing, and my ability to manually focus was off. I will share a few that surprised me however, I’ll get to those in a second. Before that, one of the things that I learned today was that using the 1.4 extender works well with the Beast, when everything is right. Those three were all taken later in the day at the Muskegon Channel, after the sun had come out, and the wind had died down a little. 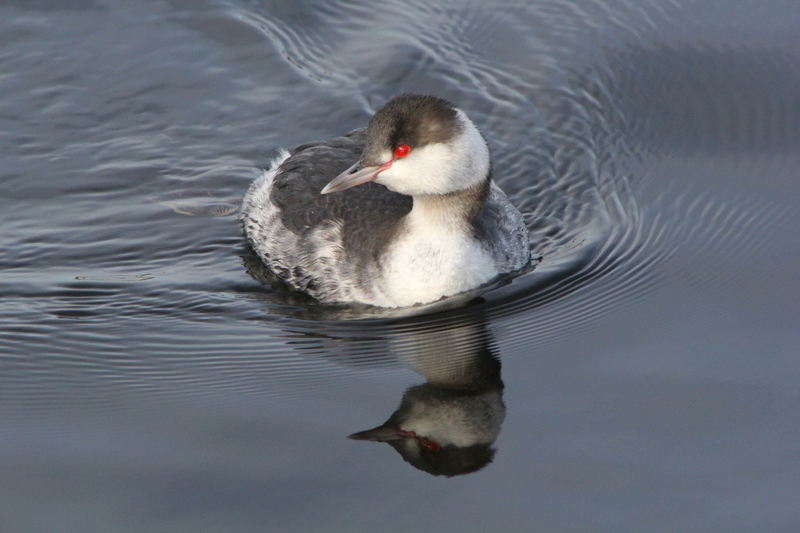 The photo of the scoter was cropped slightly, the grebe and merganser are just as they came out of the camera. Under very good conditions, there’s not a lot of fall off in quality from what the Beast produces without the extender. That makes me a very happy camper! I also learned that a 30 MPH wind was enough to blow me around to the point where I couldn’t keep a subject in focus, nor could I hold steady enough for a sharp photo. 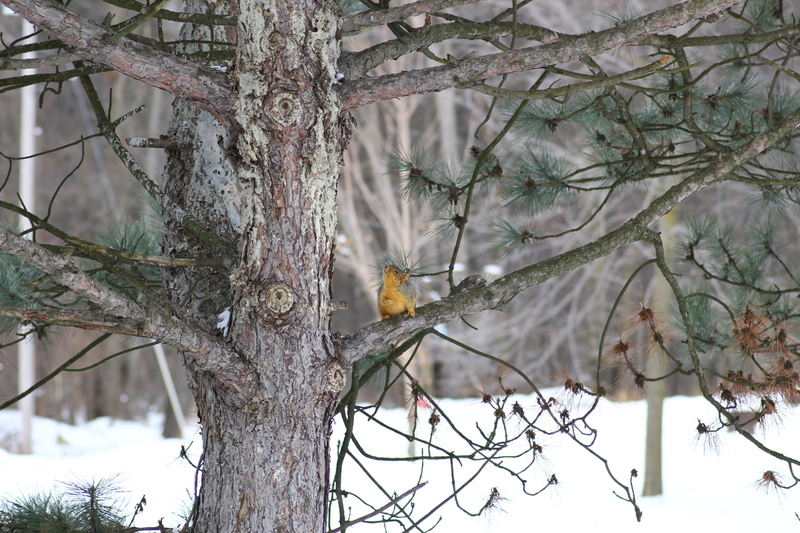 In addition, I learned that I can’t manually focus quickly enough to keep up with smaller birds, such as nuthatches and chickadees, which never sit still for very long anyway. Luckily, most of the birds that I photographed poorly weren’t very special, that is, until I got to the channel from Mona Lake to Lake Michigan. 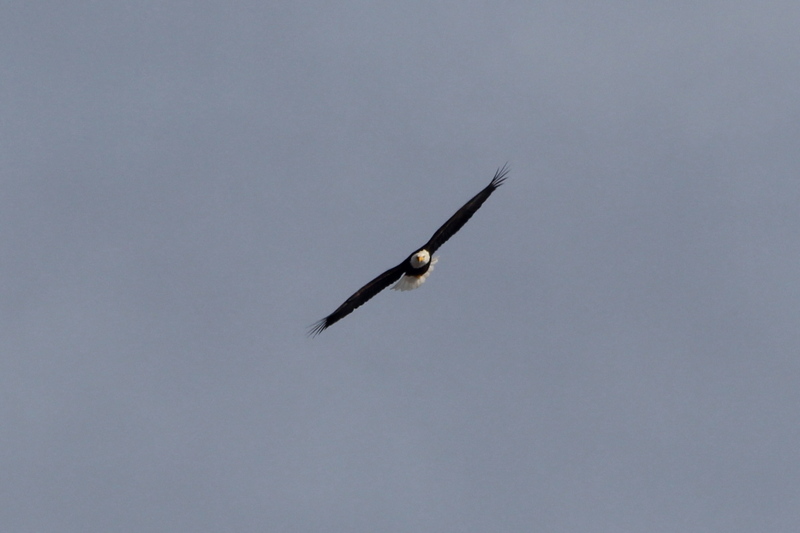 I saw two bald eagles in flight, but before I could get the camera up to my eye, they had dropped below a dune, out of sight. 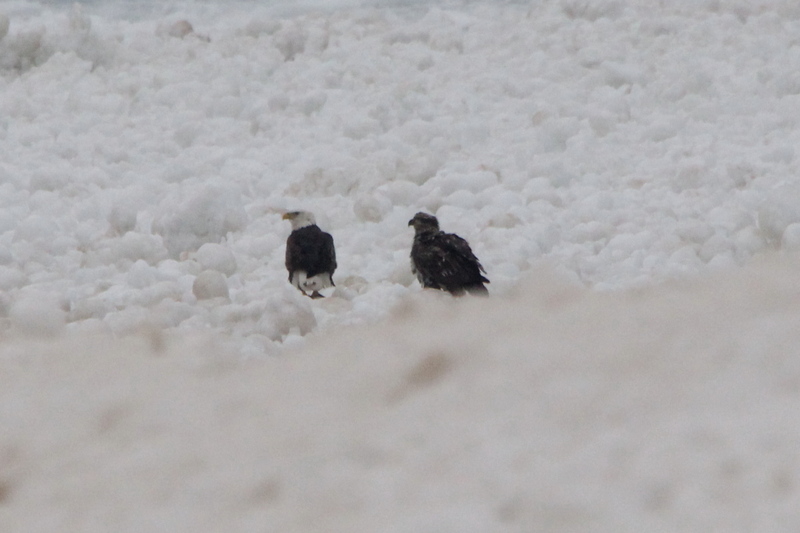 After I got closer, I could see them perched out on the ice on Lake Michigan, one was about 100 yards from me, the other, a little farther than that. I shot a few photos of each, no need for them here though. 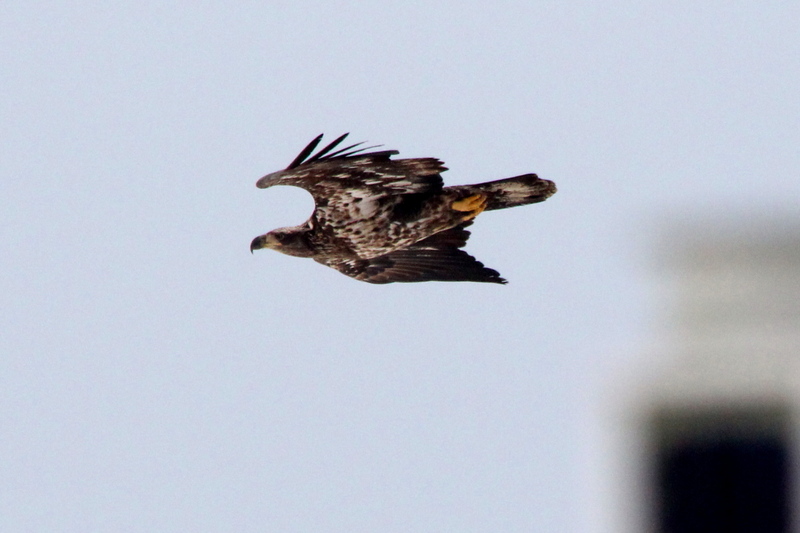 As I was standing there watching them doing nothing, an immature eagle flew past me, this time I was quick enough. The young eagle landed next to one of the mature eagles. 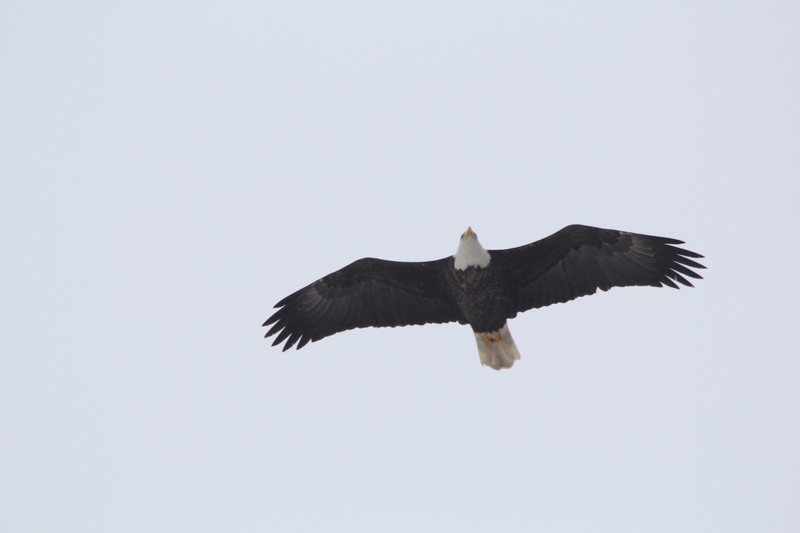 That makes me wonder, how do eagles recognize each other at great distances, eyesight? 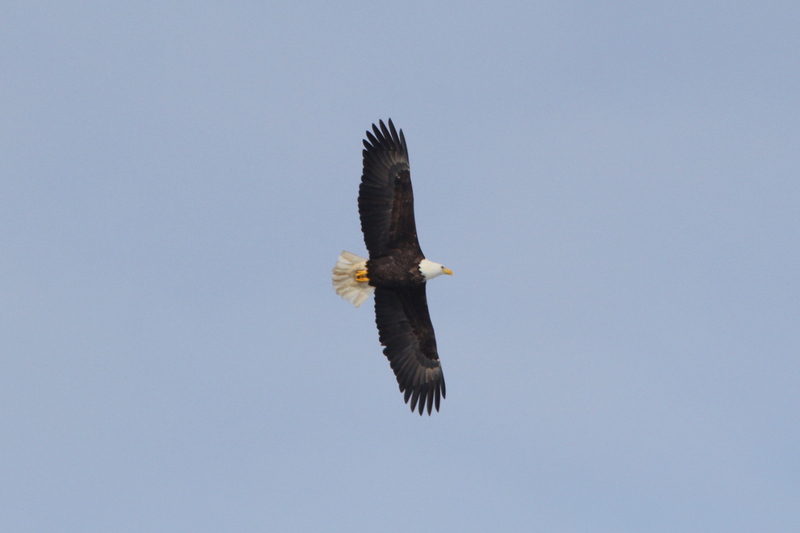 Anyway, I turned around to head back to my vehicle, and another mature eagle flew over me. 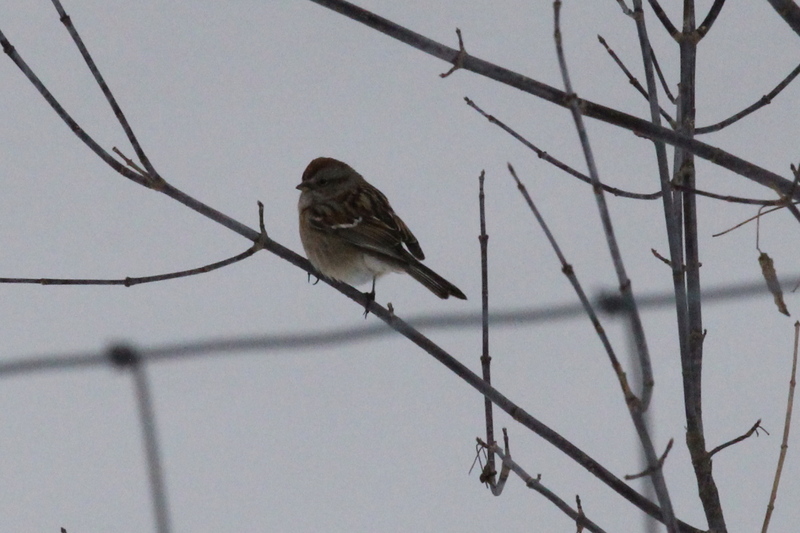 Not great, but handheld at 700 mm, manually focused, and very little light, I’ll take it! My plan had been to walk the length of the channel carrying only the Beast with the extender, then return to my vehicle, shed the extender, and grab the second body with the macro lens on it, then go for a walk in the woods there at Lake Harbor Park. 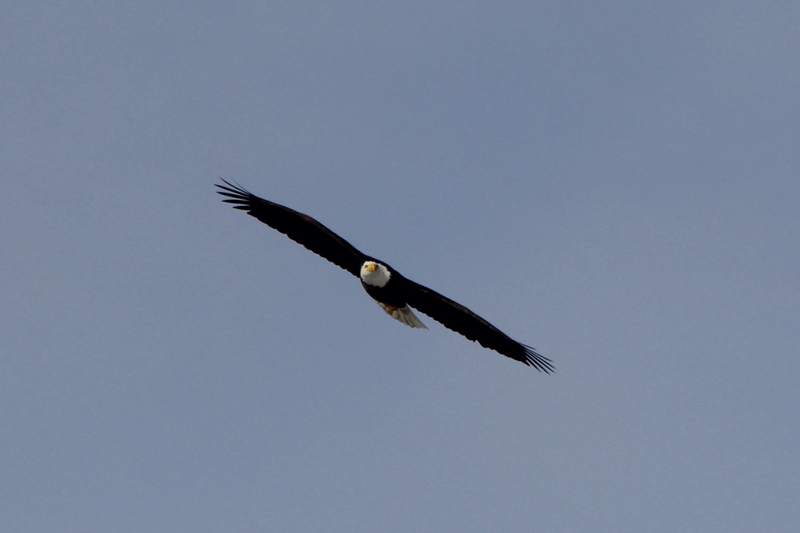 I had just removed the extender, when yet another eagle flew over the parking lot. That eagle disappeared off to the east, but it was soon followed by another. The last three were all shot at 500 mm, and cropped a little. As you can see, the sun was breaking through the clouds by then, I wish that I had the time to put the extender back on, but the eagles didn’t wait around. 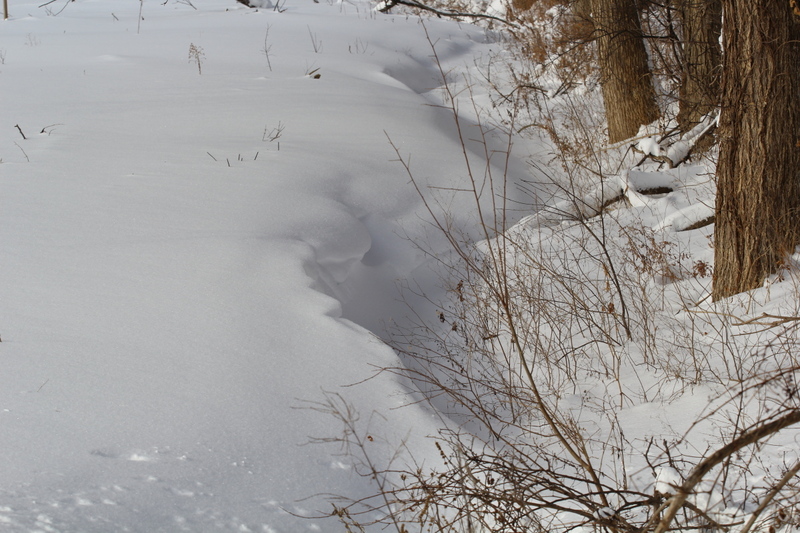 My plan to walk the woods didn’t go well, the trails at the base of the dunes were drifted shut, and I didn’t feel like busting through drifts, some of which were taller than me. So, I walked one of the trails that runs along the top of a dune, then walked back via the beach. The only photo worth posting is this one. 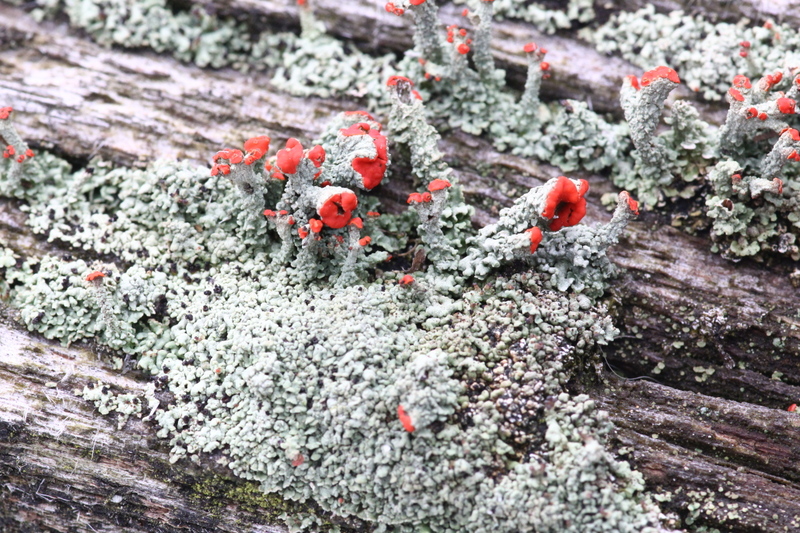 That was shot with the Tokina macro lens, which also makes a fair landscape lens it turns out. 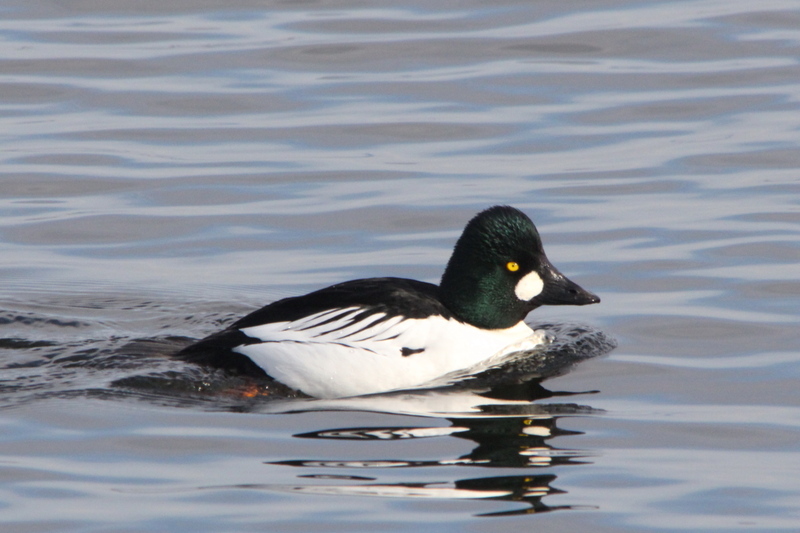 So, with that part of the day over with, I went to the Muskegon Channel to chase a few more waterfowl around. By then, the sun was out, the wind began to die down, and I started getting much better at manually focusing, so my photos from there are much better. But, I’m going to be a jerk and make you wait to see them. The weather forecast for the next eight days looks much like it has all winter long, other than the brief warm up this weekend, cloudy, cold, and snow. I doubt if I will get many photos worth posting this week, so I’ll throw in a couple of the ones from today as needed this week, maybe even next week. I’ve said it before, but it fits well here, I’m my own harshest critic when it comes to my photos. When I first looked through the photos from yesterday, I was convinced that they were all junk, maybe one or two good ones. That may be because I shot a much higher percentage of clinkers than I normally do, but that was part of the learning curve when using a new piece of photo equipment. My problem is that even though I may know that there will be things to learn using new equipment, I don’t allow myself the luxury of bad photos as I learn. I know, that makes no sense, but it is me. I set high standards for myself, even though I know that I won’t reach them right away. One thing that I forgot from yesterday, the Canon 60 D, the Tamron extender, and the Beast performed very well together as a team. The Tamron extender transmitted the correct data back and forth between the camera and lens, the Canon body calculated great exposure settings based on the true focal length of the stack, and the Beast reacted accordingly. The Canon upped both the ISO and shutter speed as much as it could, while keeping the Beast stopped down as much as was possible to give me as much depth of field as could be gained. I’ve read that some other combinations don’t work as well together, and that the user’s end up going to full manual because their camera bodies don’t communicate correctly with the extenders and lenses that those other users have chosen. It pays to do your homework before purchasing something. Okay, on to today. A rare bit of good news weather wise around here, the front that was predicted to arrive here about the time that I’m typing this has slowed down, and won’t arrive until this evening. That means one more day of warm weather before we go back into the deep freeze. There’s some clouds, but they aren’t the heavy, dark clouds that we have most of the time around here in winter. Still, I won’t be trying the extender with the Beast today, I learned yesterday that they are best used on bright, sunny days. Instead, I’ll take the L series lens and extender for more testing with it. 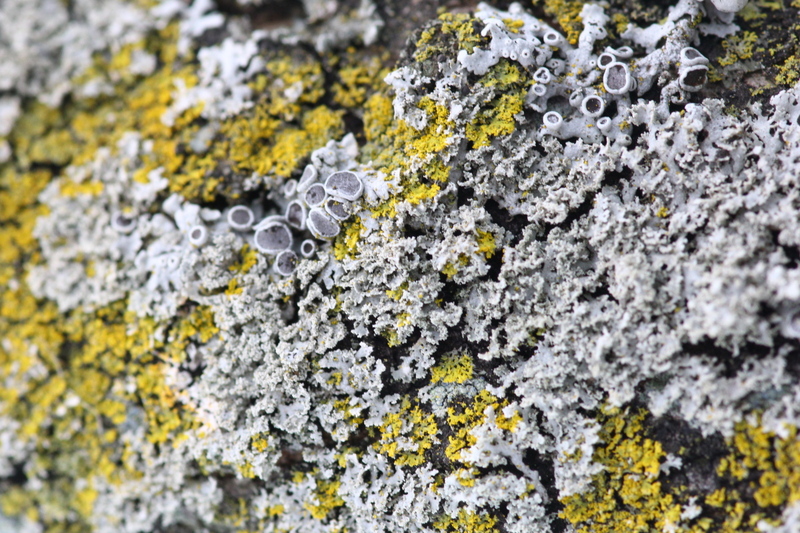 Big, big news here from the humble abode today, while I was eating breakfast, I decided that there was enough sunlight to try the new Tokina macro lens, and the Tamron extender out on the British soldier lichens that I posted a photo of last week. I think that you’ll be able to see just how good of choices that I made in purchasing these items, when I get to the photos. 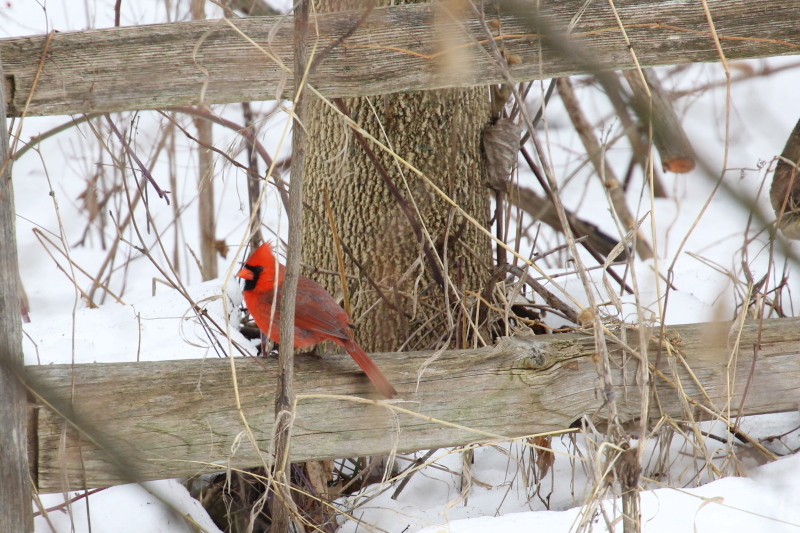 But, to build suspense, I’m going to begin with the bird photos from today. 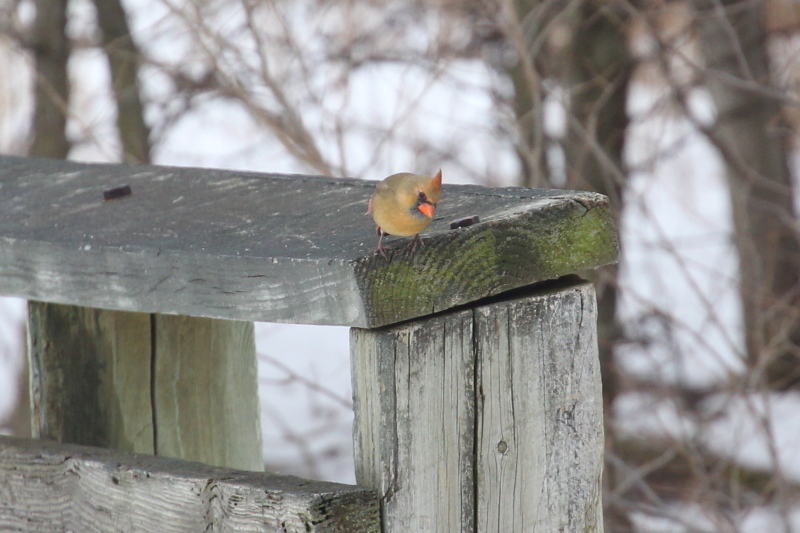 With the warmer weather, I saw more birds around here today than in the entire week last week. If I had taken the Beast with me, I could have gotten many more photos than I did, but I used the L series lens with the extender for these. Nothing special, but it looks like the L series lens works well with the extender as a walking around lens. Now then, for the good stuff. By the time that I entered the park, the clouds had thickened up, and the light wasn’t nearly as good as it had been when I started my walk. In fact, it sprinkled it bit off and on for the rest of the time that I was out there. But, I didn’t let that stop me, nor my cheesy tripod either. 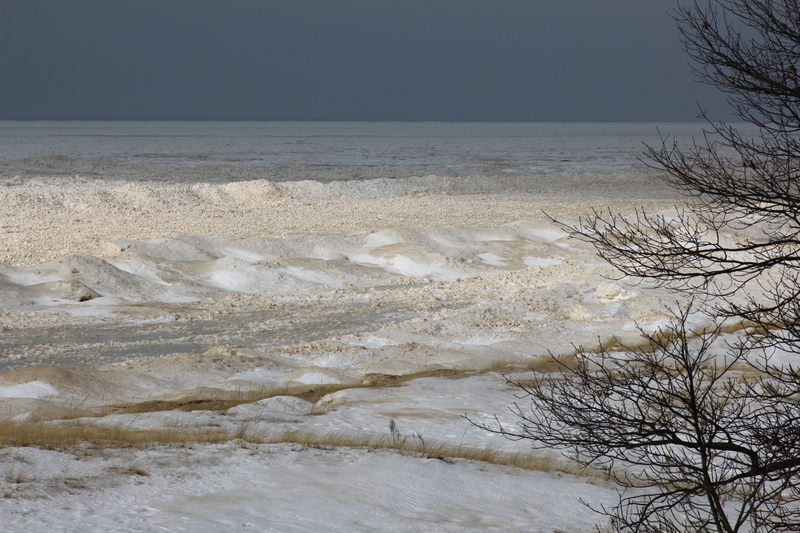 To be fair to the tripod that I have, the snow piles and ice were part of the problem that I had, but not all. Nothing locks solidly on the Vanguard tripod. I also tried some test shots with the L series lens and extender using the tripod. I was all set up, used live view to focus manually, and as I had my finger on the shutter release, I could see movement caused by the pulse of my heartbeat on the screen. I should have turned on the mirror lock up and self timer for absolute steadiness, but it was sprinkling, and I didn’t want my camera gear exposed to the rain any longer than I had to. None of the shots using the L series came close to being as sharp as I was able to get handheld in worse light last week. I may just have to postpone the purchase of the 400 mm prime lens that I would like, and work on getting a better tripod and accessories for macro photos. I’ve lugged the Beast around for nearly a year, and it hasn’t killed me, I suppose I could go another year with it as my main birding lens. But I digress, it’s time for the big unveiling! The first is the Tokina macro alone. This next one is the Tokina and the Tamron extender together. Neither of those were cropped at all, they are straight out of the camera! I may be overly proud of those, but I don’t think so. If I am, please correct me. 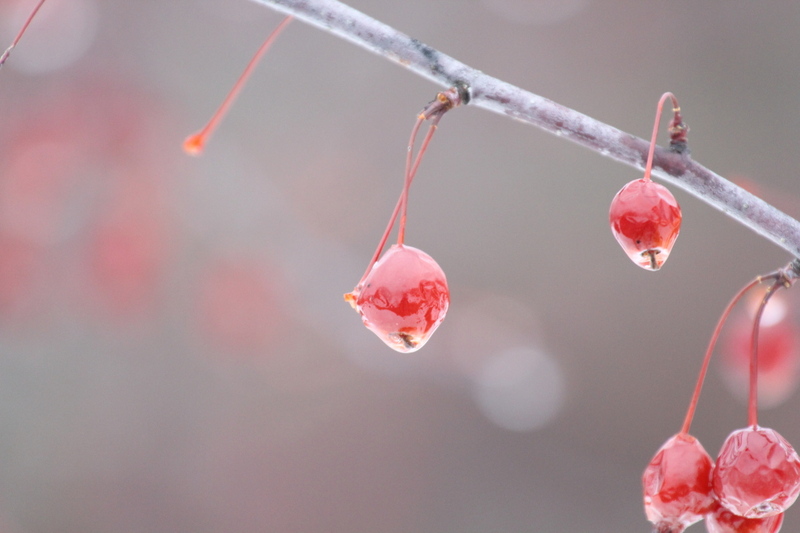 For the record, these were shot at ISO 100 and f/14, using manual focus through the viewfinder. The photo where I used the extender looks sharper, but I think that’s because I did a better job of setting the exposure, and was probably lighter on the shutter release, so there was less camera shake for that one. But, in any event, the Tokina Lens and Tamron extender make a great combination for getting close. 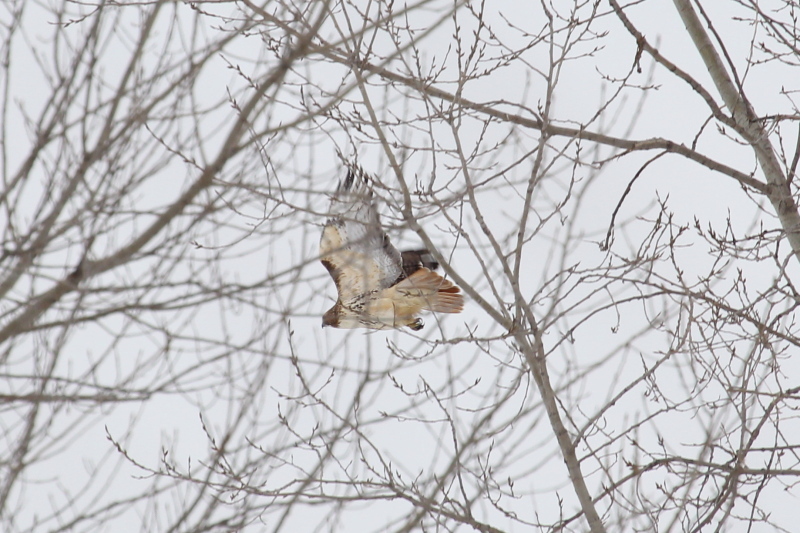 And, I could have gotten even closer if I hadn’t been thwarted by a snow pile and a poor tripod. I’m a happy camper! Now I’ll have to be patient, and hope that spring comes early this year. We’re still waiting for the storm that refuses to arrive. It’s colder today, about average for this time of year, and there was sunshine when I first woke up. That’s fading as I type this, as the clouds try once again to invade the area. After the successful trial using the Tokina macro lens and the Tamron extender together, I have decided that the time has come to spend some time with the manual for my camera, and lock in saved settings for use when shooting using the tripod. That means using the mirror lock-up function, and the self timer, among other settings. The settings that I used for the macro photos were virtually identical to the settings that I’ve used for the very good landscape photos that I have gotten so far. I have a saved set-up for flying birds in the wildlife body, which saves a lot of time and fooling around. Now it’s time to do the same with the landscape body. I’m much more likely to photograph subjects the “right” way if I don’t have to fool around changing half a dozen, or more, camera settings to get the shot. So, I’ll take care of that problem this week. One other thing before breakfast, and it’s a repeat of something that I said yesterday. I have to quit being so critical of my own photos. I shot some excellent ones on Sunday, I don’t want to sound like I’m bragging, but some of my photos are almost as good as any that I’ve seen. I may not have the very best equipment, so I can see that my photos may not be quite as sharp as those taken by people who do have the finest lenses and cameras, but I’m coming very, very close. Now what do I do? I have 30 photos left over from Sunday to use up, but I came home from my walk today with a good crop of photos to go with them. 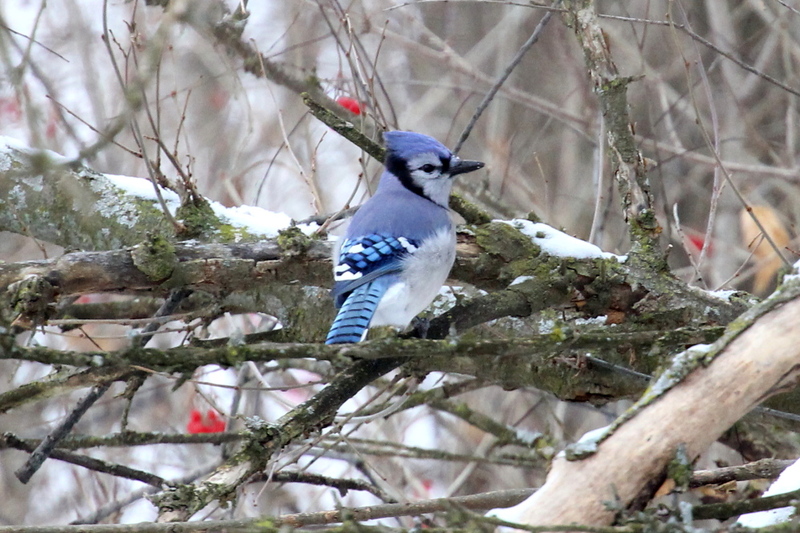 Well, let me rephrase that, I came home with a few very good photos, a few of a blue jay battling a red-bellied woodpecker, and a few that are so-so, but I saved them because I was able to get photos of most of our common winter resident birds today. 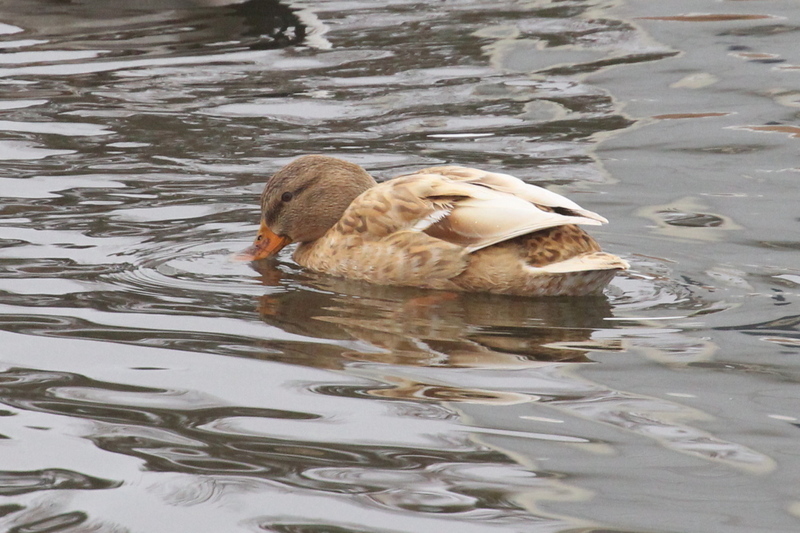 I guess I’ll use up the photos from today now, and save the waterfowl for bad days. 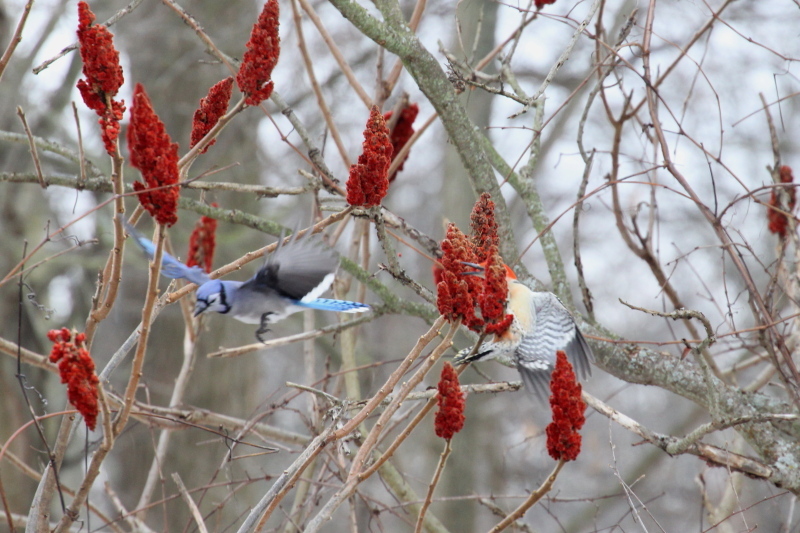 The next few are the series of photos that I shot of the blue jay trying to chase a red-bellied woodpecker away from the sumac, it didn’t go well for the jay. 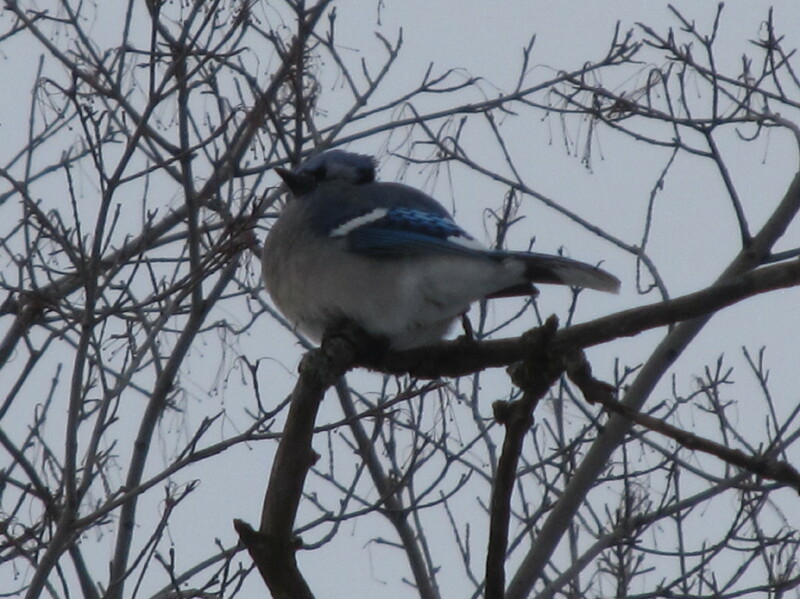 The woodpecker tried telling the jay not to try that again. But the jay was dumb enough to try again. 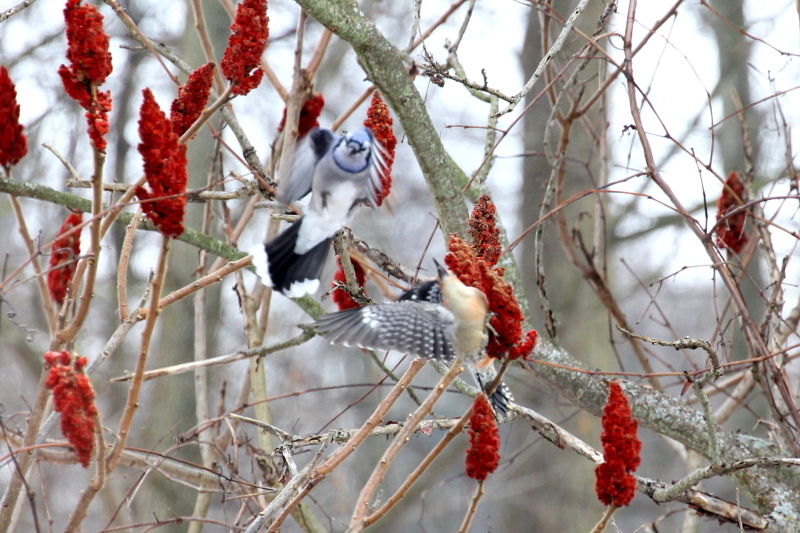 The blue jay thought that imitating a vulture for a while before an attack may work better. 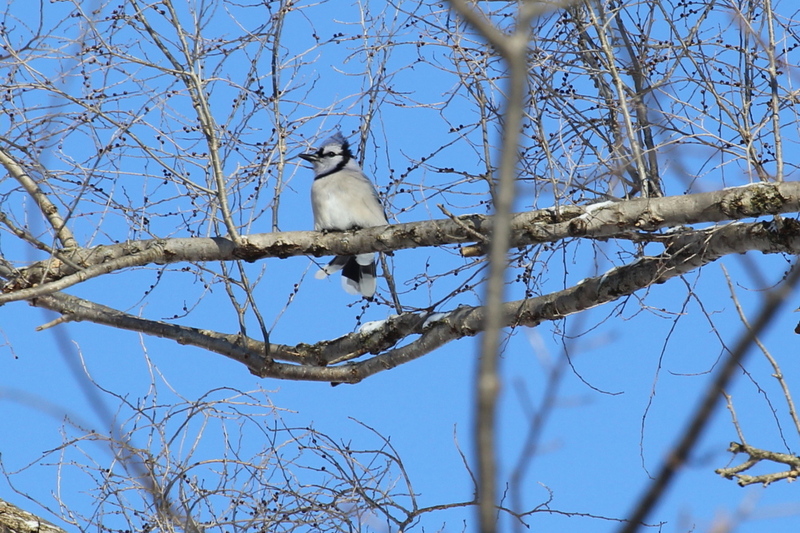 The woodpecker eventually flew off, the jay ate a little of the sumac, and then it left as well. I’m not sure what prompted the jay to attempt to drive the woodpecker away, other than both species are bullies in the bird world. 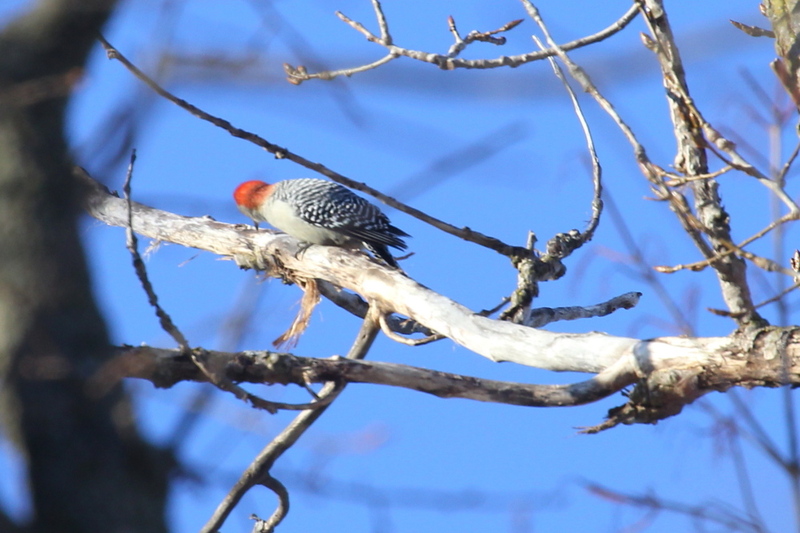 I’ve seen red-bellied woodpeckers following downy woodpeckers, wait for the downy to drill a hole to food, then the red-bellied would drive the downy away to steal the food. Here’s the rest of the photos from today, captions will be enough for these. It was nice to see so many birds today, both species and the number of each species, even better was hearing them chatter away. 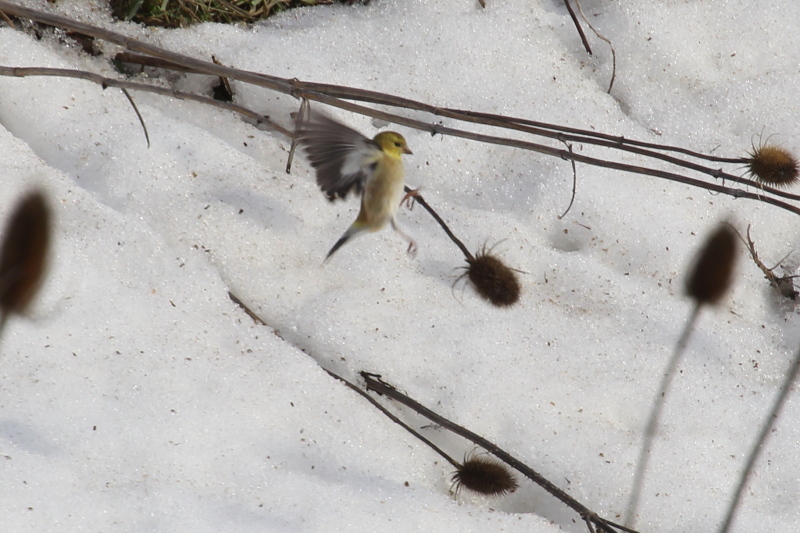 I even heard both a titmouse and a goldfinch warming up for their respective spring songs. If you’re thinking that my photos from today look a little washed out, you’d be right. You see, while I was at the camera store on Saturday, I bought some screen protectors for the LCD display of my camera, and I applied the protector Sunday night after I got home from Muskegon. Apparently, the screen protector darkens the display slightly, for when I checked my early photos, they all looked a bit dark as viewed on the display. Today was also my first day of seriously photographing birds using the new extender on the L series lens, so I assumed that the display was telling me the truth, and that I needed to go up a little in EV when using the extender, the display lied. If you remember, early on after I purchased the Canon 60 D I had a similar problem, when I brightened the display slightly so that I could see it better. I shot a number of photos that were too dark after that because of what I saw in the display when I checked. It took me a while to adjust to the brighter display. It may take me a day or two to adjust to the display with a protector on it. Funny how little things can throw me off. The snowstorm first forecast to arrive Sunday night is just now reaching the area, and there’s light snow falling as I type this. Winter has returned, the brief January thaw was very welcome though. It’s much more winter like this morning, with lake effect snow falling, driven by the last of the wind from the storm that came through last night. I have decided to stop following a number of blogs that I had been following, several people have taken to posting multiple times per day, I assume in an effort to make their stats look better. That’s their privilege of course, but it’s been taking me too long to view them all, and as much as I may have liked their blogs, I don’t have the time to read two, three, or even four posts per day from the same person. That’s bordering on spamming people in my opinion. Anyway, it’s time for food and a walk. Well, I’m back. We didn’t get very much snow overnight from this storm, and most of what did fall got blown around until it became part of existing snow drifts. I was deep in thought for most of my walk, as I wasn’t seeing very much wildlife of any type, it was a ho-hum kind of day. I did look up once to see a pair of mourning doves flying past me, out of camera range, and with the sun behind them as they passed me. A second or two later, a Cooper’s hawk flew past me as if following in the tracks of the doves, but I didn’t get a photo of it. 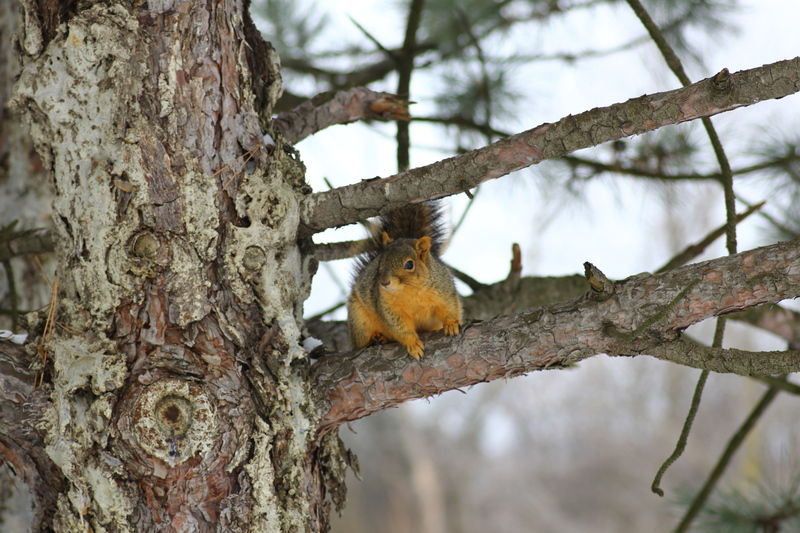 I did shoot a photo of a fox squirrel, as I’m still testing the capabilities of the Tamron extender, here it is, in the slightly cropped version. That photo plays into things that I have been thinking about over the past two weeks, and also goes along with what I said about being my own harshest critic. I am beginning to rethink a few things, mainly purchasing the 400 mm prime telephoto lens. Over the past few weeks, I’ve been going back through the photos that I have taken this past summer, and posting one or two now and then as a way of looking back at the past year. Here’s another example, from last August. Also, the photos that I shot at Muskegon on Sunday that I thought were junk when I first viewed them. 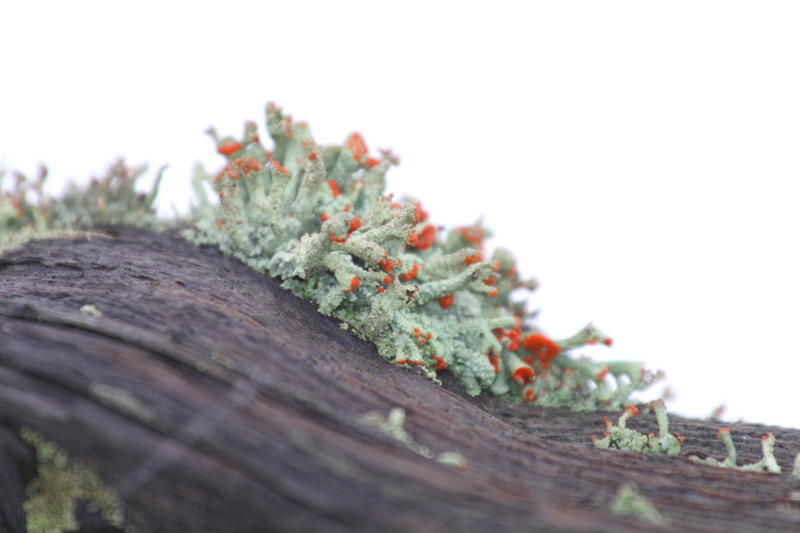 But the photo that has hit me the most was the second one of the British soldier lichens that I inserted earlier into this post. With a lot of careful research, I’ve managed to put together a very good kit of photo gear, and under reasonable weather conditions, my photos reflect just how good my current photo gear is. Of course, it isn’t just the gear that’s responsible for the quality of my photos improving. I have allowed myself to go on a quest for the “Holy Grail” as it pertains to photography, looking for the magical lens which will improve my photos dramatically. There’s no doubt that the 400 mm prime telephoto lens that I’ve been drooling over is superior to the Beast when it comes to optics, and it’s much easier to carry and handle as well. I’m sure that I will purchase one eventually, but I’m no longer in any hurry. I look at the photos that I have taken with the Tokina 100 mm prime macro lens and know that I would just love to have a long prime telephoto lens equally as sharp as the Tokina is. While the prime telephoto can produce better photos than the Beast, there’s still room for me to improve the photos that I get while using the Beast, as well as all of my lenses, and especially the camera bodies. I’ve been taking a slow, methodical approach to learning my new gear, and I believe that I still have a lot to learn. I think that I can extract more quality from my current gear than I would see if I were to purchase an even sharper lens. I could be wrong about that, but it doesn’t matter, I won’t know until I try, and even if the increases in quality aren’t as large as I think that they will be, there will still be improvement, and that’s what counts. I think that if I continue to fine tune the camera settings, that I will continue to see the quality of my photos improve, and I hate to sound like I’m bragging, but many of them are darned good already. 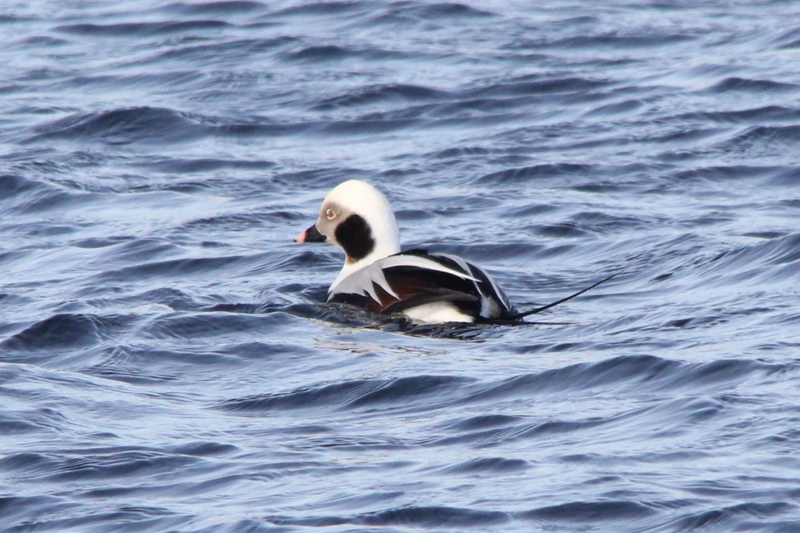 It’s funny, I inserted the photos of the bunting and long-tailed duck, and the first thing that I wanted to do was apologize for the poor quality of those photos because I’ve reduced both the physical size of those photos, and the quality of them before posting them here. One thing that I have begun to do this week is to make two categories for my photos that I post here. 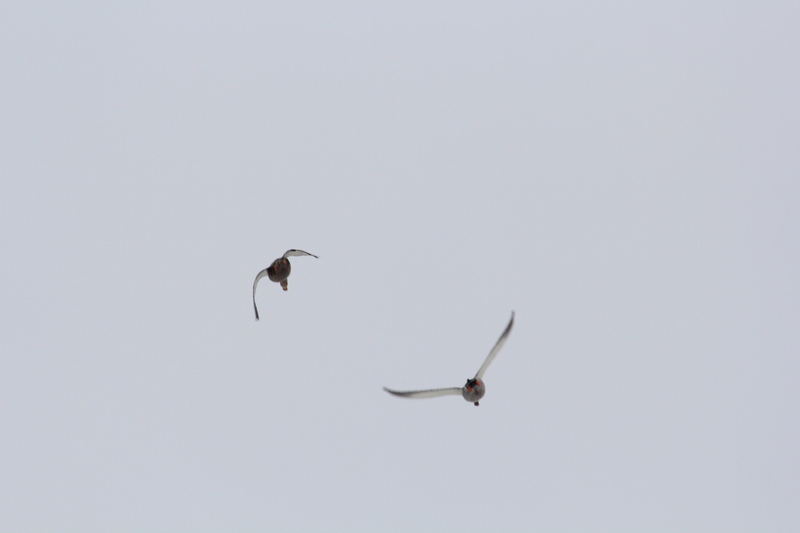 One is of “throw away” shots, the photos of the birds from yesterday are an example of that category. With the poor light, I knew that none of the photos from yesterday would be wallhangers. I reduced the size and quality of those photos a little more than I have in the past, as they were just fair to begin with. The other category will be the “trophies”, really good photos and/or of species that I seldom if ever post photos of. I’ll still reduce the size and quality of the trophies, but not as much as I do to the throw aways. That will help me conserve space as far as the WordPress limits on uploads, and besides, I don’t see any reason to try to make a silk purse out of a sow’s ear. I’ll post slightly better versions of trophy photos, however I still won’t post the full versions, not only because of space limits, but I don’t want any one stealing my photos either. As much as I would like to post nothing but trophies, that isn’t going to happen, as this is still a record of my daily walks. But, and this is hard for me to say in a way, I’m getting some excellent photos, and it’s time for that to make its way into my thought process. There is no such thing as the perfect photo, so it’s time for me to stop knocking myself because I’m not getting perfect photos every time that I press the shutter release. Cold, windy, and snow, we’re back to full blown winter again around here. However, last night at work, I noticed that as I backed up to the dock at the Lansing branch that it was still light out, even though I had stopped for fuel on the way there. The days have already gotten longer, I’ll have to remember that as the next arctic blast hits next week. Spring is on its way, it’s just a matter of time, and gutting out the cold spells until it arrives. Yeah, right, spring is right around the corner he says. It was cold and windy today, and so gloomy that there seemed to be no color at all in anything. 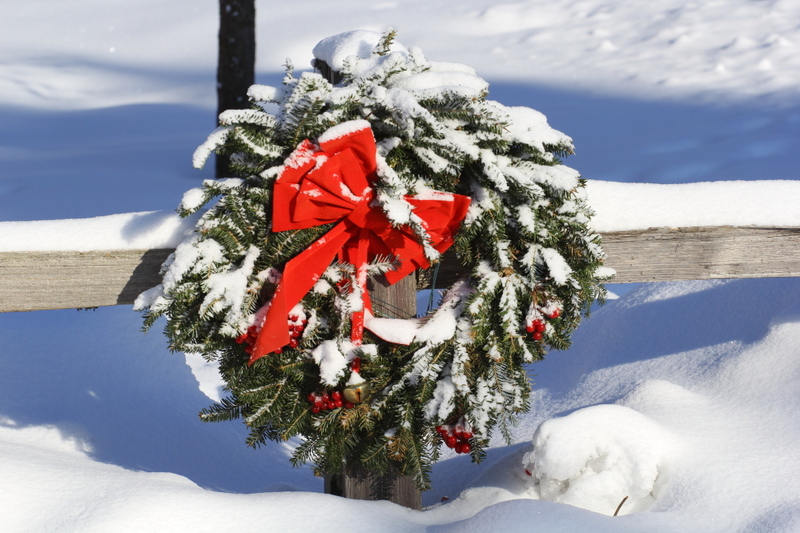 I shot two photos of a wreath that some one placed on the gate to the park, but neither turned out well. That wreath is giving me fits, and I don’t know why. Today isn’t the first time that I’ve tried to photograph it, but I have yet to get a properly exposed photo. It gives me something to practice on even if I never do get a good photo of it. 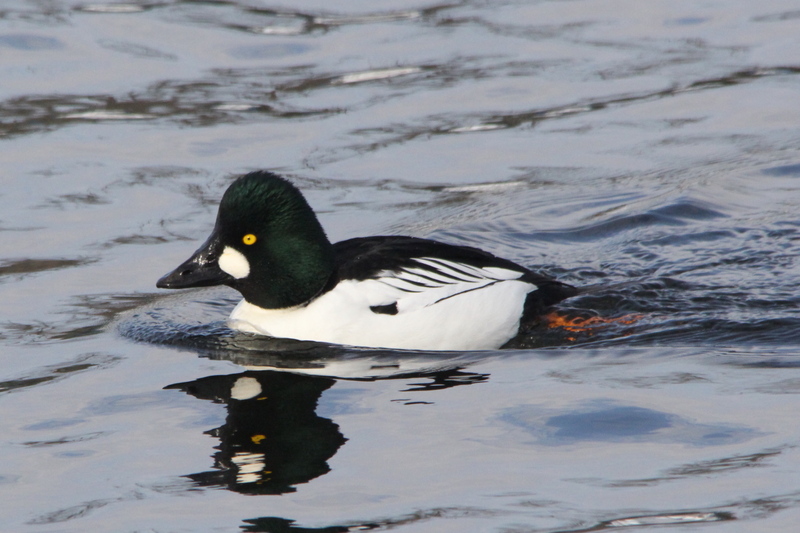 That gives me an excuse to post three photos of a male common goldeneye that I shot on Sunday. 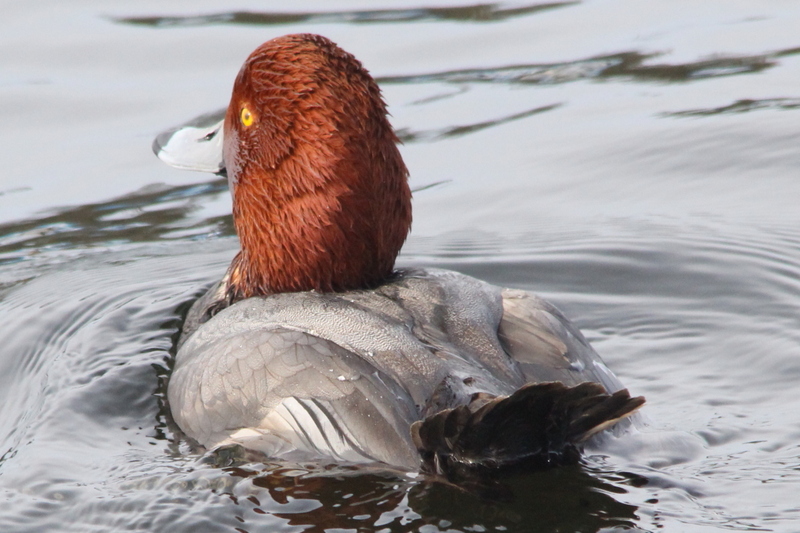 I’ll add those to the post that I’ve already done on them in the My Photo Life List project, just as I have added some photos of redhead ducks to the previous post on them. And since I have already uploaded the redhead photos, I may as well insert them here as well. 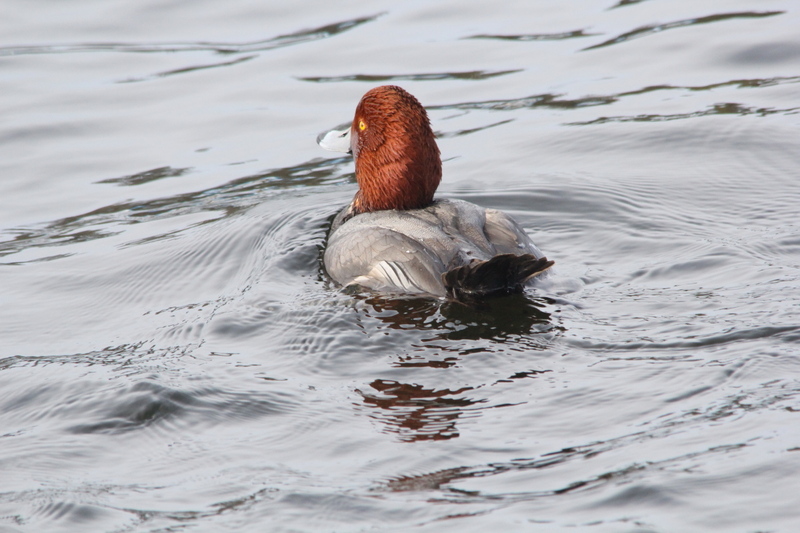 Along with this one which is also a redhead, but I was photo-bombed by a swan as I shot the photo. 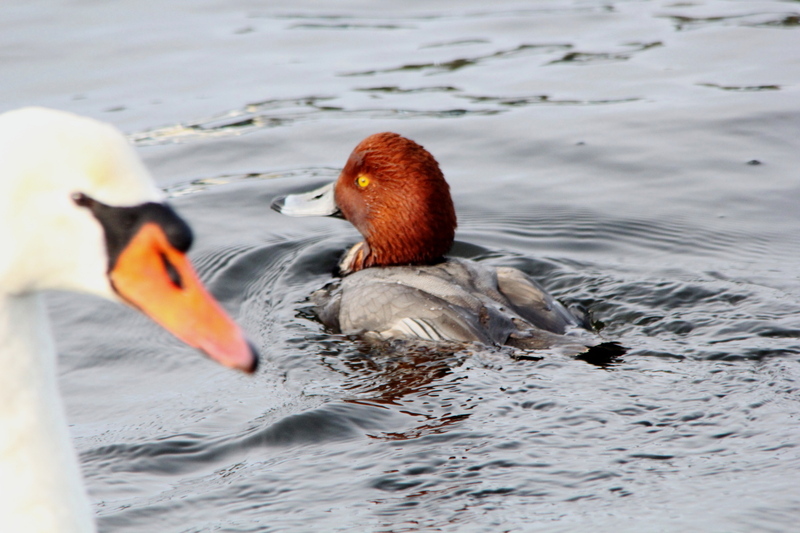 The darned swan swimming into the frame ruined my best photo of the redhead. That photo also gives you some idea how much of a difference in exposure is needed for the two species. I was dead on for the duck, but the swan is way overexposed. The weather forecast is looking grim, not just for next week, but into the month of February. It may be so cold that I won’t be taking a camera with me as I go for my walks, there may even be a few days when I don’t go for a walk at all, if it gets as cold as they are saying now. Today, it’s about average around here, cold, cloudy, with some occasional snow flurries, brrr. So, before I go out to not take many, if any photos, here’s another from Sunday at Muskegon. This one is cropped a little just for insertion here. The full size photo as seen on my computer didn’t need to be cropped, but I decided to add this version here to show you how well that my photo gear and I are doing. The question that I have for myself, and that only I can answer, is, why is it that I can’t see how good my own photos are? I can remember that after shooting the fall colors in Palmer Park, I nearly deleted all the photos that I shot when I first viewed them, but they were actually quite good in retrospect. It was the same with the snow landscapes that I shot a few weeks ago, I wasn’t happy with them, either. Two thoughts come to mind, one is that my initial assessment of my photos is correct, but after viewing them a few times, I begin to overlook the flaws that they have. The other is that you may think that I’m fishing for compliments, I’m not. I think that what I really could use is a completely unbiased opinion, and go from there. I know that at least some of the problem that I have in assessing my own photos is that I compare mine to those that have been taken by professional photographers using top of the line equipment, then edited extensively during post processing. As good as my cameras and lenses are, they can’t quite compete with equipment costing ten times as much. Nor can my unedited photos compete with those that have been edited by experts using Lightroom, or some other software. 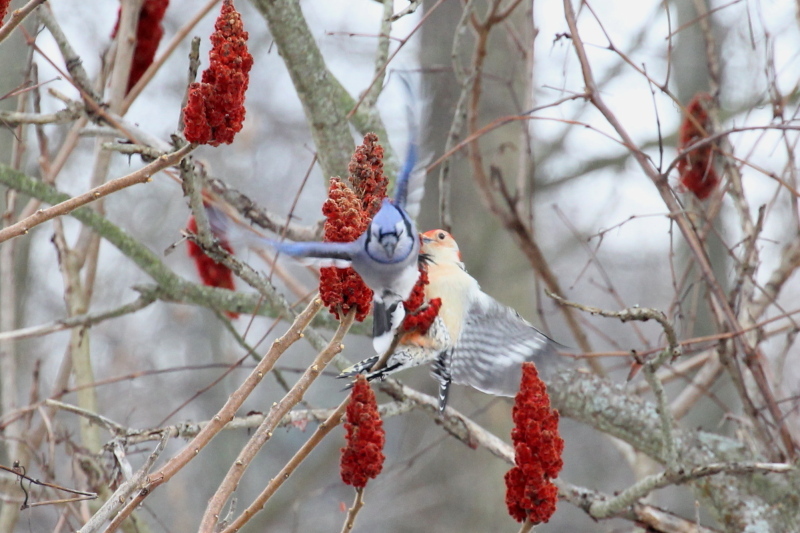 To make things worse, I take so many photos of common subjects from too far away and in poor light, such as the blue jay trying to drive off the woodpecker from earlier this week, or these two from today. I consider these two to be throw aways, as I have far better photos of both species. The only reason I shot these two is that I have tweaked my camera to compensate for the Tamron extender, and wanted to see how well the tweaks worked. I would say that they worked quite well. However, as I said earlier today, I think that the time has come for me to find a source where I can get unbiased opinions on some of my photos. I could use some constructive criticism from some one who knows photography. I have several options in mind, but there’s no need to list them here, now. I think that along with that, it’s time for me to have a few of what I consider to be my best photos printed, as I haven’t had any of the photos that I’ve taken with the Canon bodies printed yet. I’m going by what I see on the computer screen when I analyze my photos, and that may be misleading. I do know this, I have agonized over this post far more than any that I have done up until this point. I am afraid that people reading this will think that I’m fishing for compliments, but I’m not. I’m thinking of turning the comments off for this post. Or, they could think that I’m a nut case for not being able to tell a good photo from a bad one. Only when it comes to my own. Cloudy, cold, and snow, we’re back to the same old rut around here. The forecast for the next three weeks is depressing. The bitter cold is predicted to return early this week, and stick around into February, with just a few “warm” days, when our temperatures will be around, or a little below average. There’ll be no chasing birds by me if that holds true. There’s been no real sunshine this week other than a few hours last Sunday, it was less gloomy than normal on Monday, but other than that, we’ve had constant cloud cover the entire week. There’s more talk of Lake Michigan freezing over, if that happens, it will be even colder here, but at least there would be some sunshine now and then. I think that I would trade the cold for a bright day once in a while. Okay, I had some 8 X 10 prints made from some of my photos, and they seemed to wow the people who saw them, including myself. I may have made a mistake though, most of the prints were landscapes, all taken with the 15-85 mm lens while I was on vacation last fall. 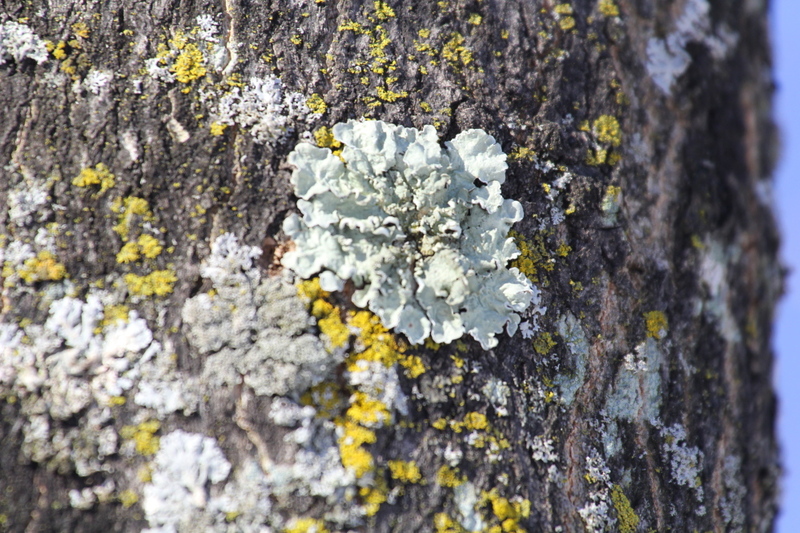 I did include one photo of an eagle using just the Beast, two taken with the Beast and the Tamron extender together, and the photo of the lichens using the Tokina lens and Tamron extender. All the prints were very sharp, although the colors were off slightly in a couple of them. That was due to the printing process, and not my fault. 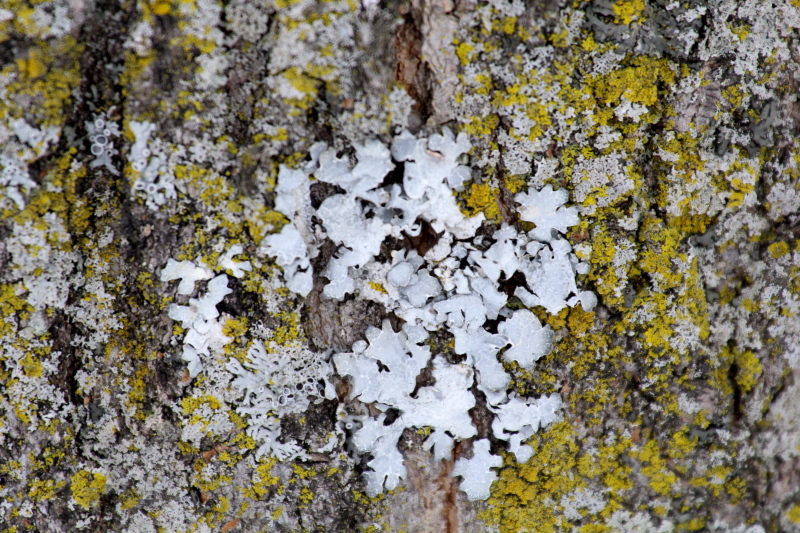 I know that I have written about that in the past, but it really hit me this week when I saw the photo of the lichens earlier this week. The question remains though, why do I have such a hard time admitting it to myself, or seeing it when I first view photos that I have taken? I also don’t know how to explain the strange dichotomy about my photography, I am quite proud of the equipment that I have purchased, yet when I see the photos that I’ve taken while using that equipment, I’m disappointed at first. Going back to what I said earlier this week, it’s time for me to fine tune my settings, and work at improving my techniques. Well, time for a walk so I can think on this some more. I’m back. I suppose that I should chalk this post up as another in tracking my evolution into being a good digital photographer, even though I feel that I still have some distance yet to go. Evidence of that is that I see my digital results on the computer, and I’m not happy at first. Yet when I picked up the prints that I had made last night, I knew right away that they were very good. I would even go so far as to say that they are much better than anything that I was able to do back in the days when I shot film. I’m still much better at judging printed results than digital results. I saw a huge leap in the quality of my photos when I made the switch from my old Nikon to my current Canon camera. Since then, there have been several Aha! moments along the way, but mostly it has been a slow, step by step process to get to where I am today. I hadn’t realized how good my photos have become until I looked back at some of my earlier efforts. I’m making progress, so it isn’t any wonder that I need to take time, look back, and then rethink the course that I’m on, and make any needed adjustments to that course. So I’m sorry if this has seemed to be another repeat of what I have said in the past, it has been, but with some differences as I have been assessing my progress, and deciding which way I need to go next. My goal hasn’t changed, I still want to become the very best nature photographer that I can be, but I have had to alter my course slightly in order to get to where I want to be. I’ll have more about that new course next week, right now it’s time to wrap this up fairly soon. My photos from today were nothing special, but I think that this one is worth posting. That’s the only color I could find with the weather the way it was. 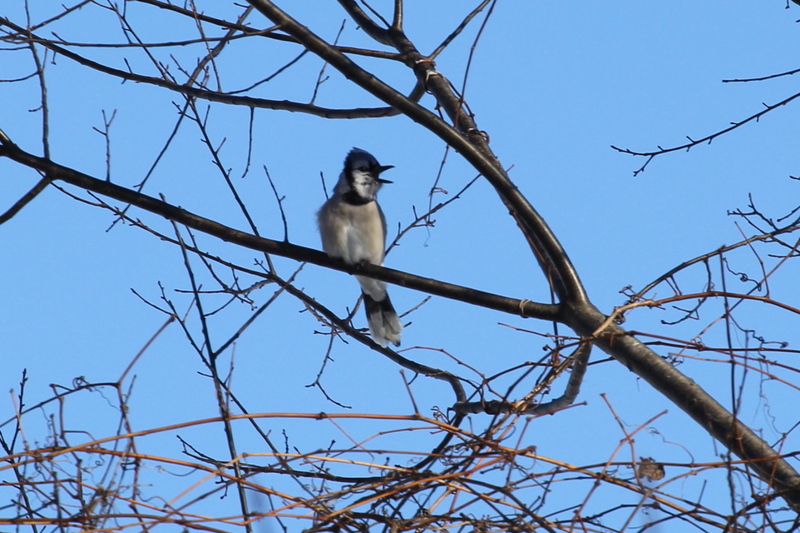 I shot a blue jay and a small flock of tree sparrows, but they all look grey, since that’s the only color that shows up this time of year, so I’m not going to post them. 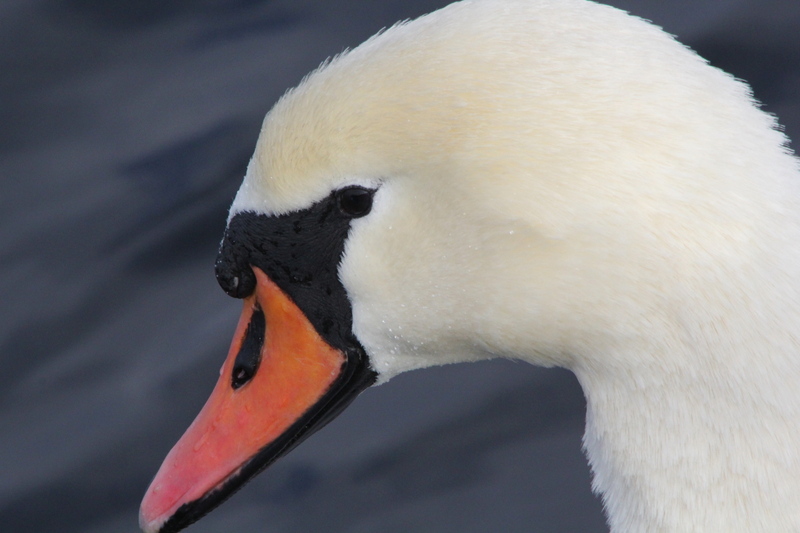 My final photo of this week will be this one of a mute swan that I shot at 700 mm on Sunday. The weather tomorrow is about as good as it will be for the foreseeable future, but windy. So, I’ll return to Aman Park, being down in a valley, I usually find some respite from the wind. 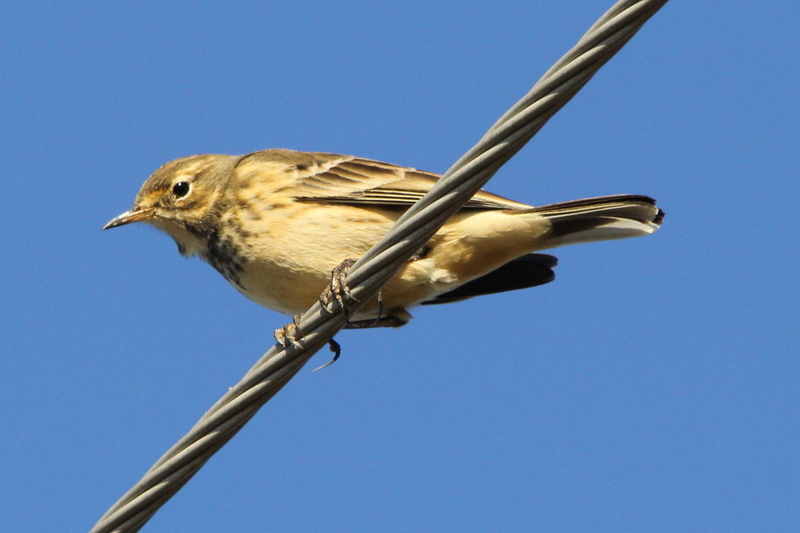 The American Pipit as it is known in North America, is a small songbird found on both sides of the northern Pacific. It was first described by Marmaduke Tunstall in his 1771 Ornithologia Britannica. 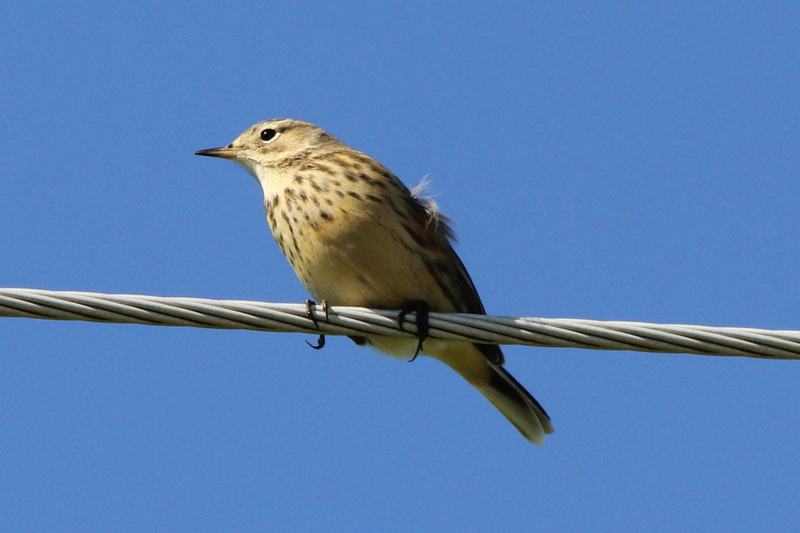 It was formerly classified as a form of the Water Pipit. 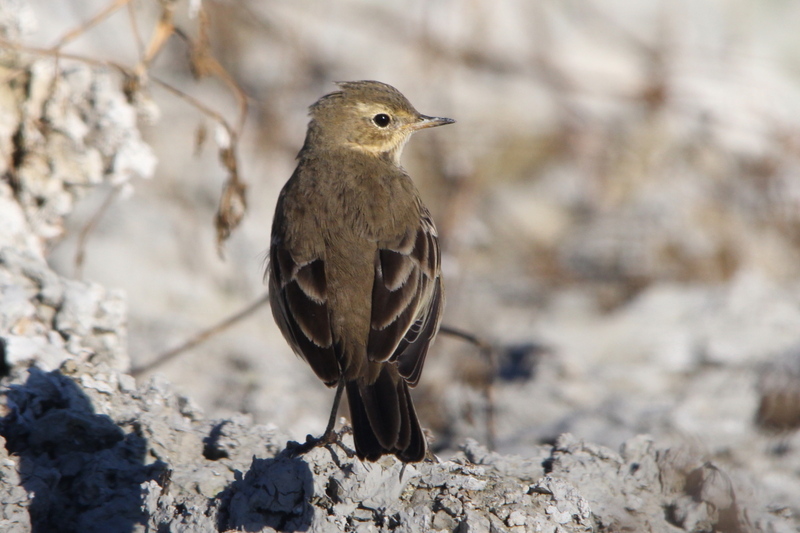 Like most other pipits, it is an undistinguished-looking species which usually can be seen to run around on the ground. 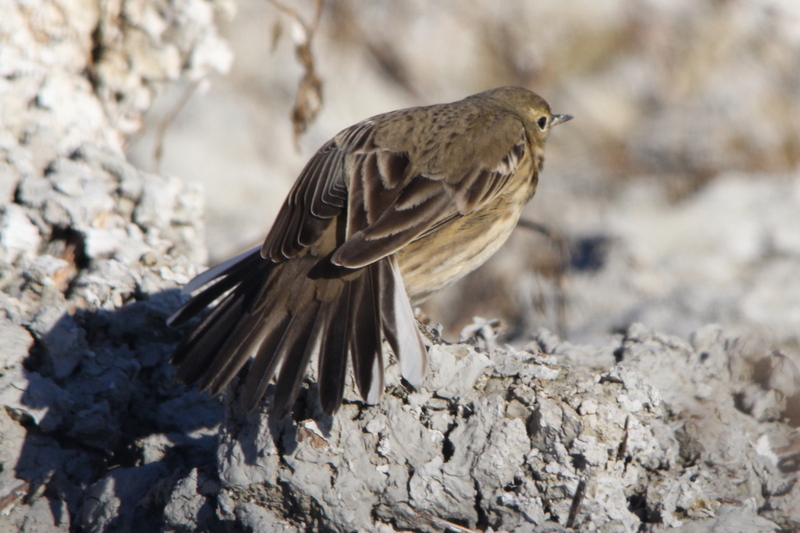 The American Pipit has lightly streaked grey-brown upper-parts and is diffusively streaked below on the buff breast and flanks. 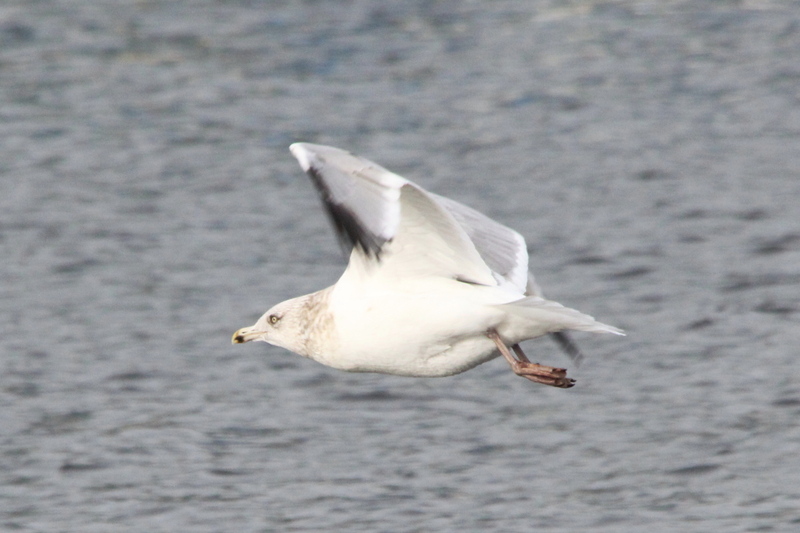 The belly is whitish, the bill and legs are dark. Like its relatives, this species is insectivorous. 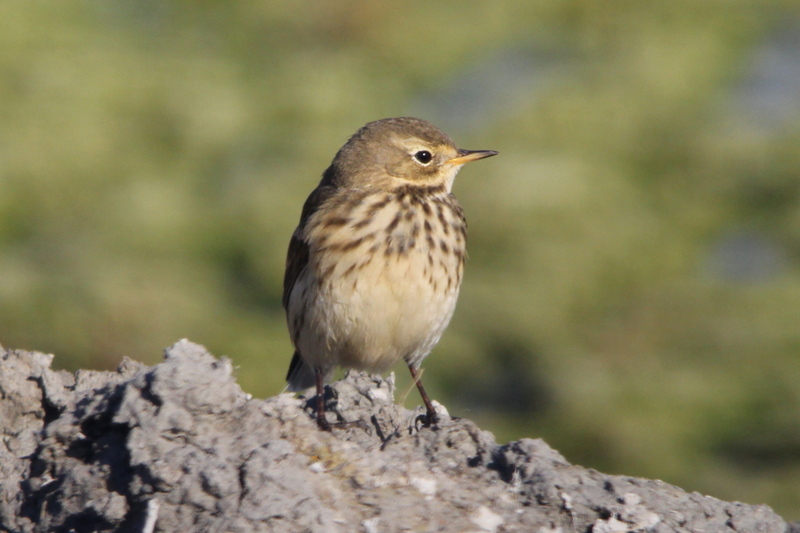 The breeding habitat of American Pipit is tundra, but outside the breeding season it is found in open lightly vegetated areas, similar to those favored by the Water Pipit. 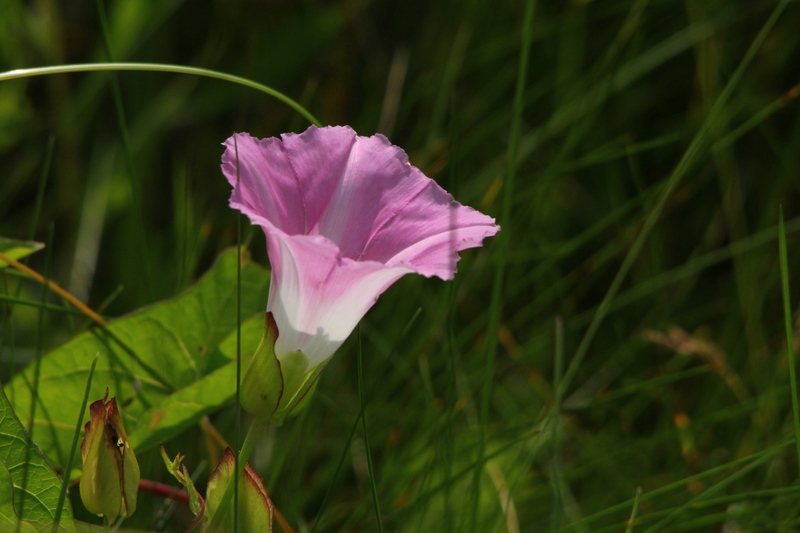 Nests are most often found on the ground in dry or wet meadows, always with a helpful protection, but they are never placed in shrubs or trees. The composition of the ideal nest depends on whatever is around the nesting area, but it is usually made of sedge, remains or new fine grass, and sometimes some horse hairs. 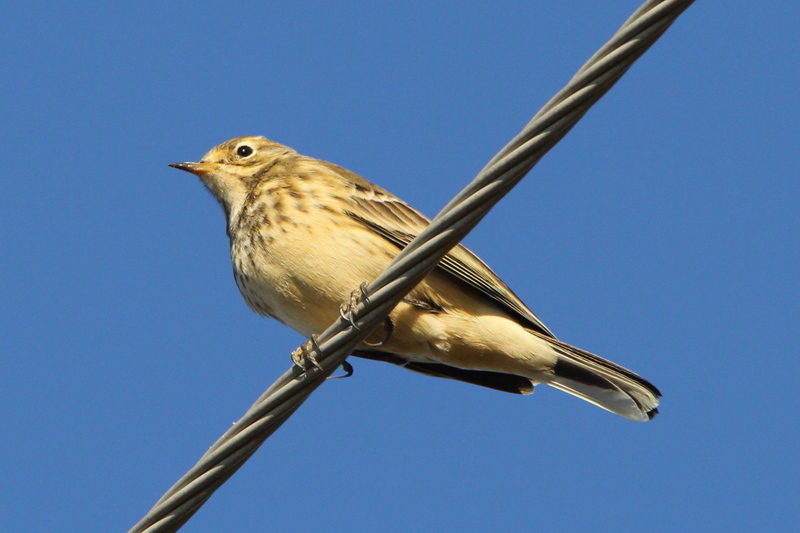 The final issue American pipits have to deal with is nest success. 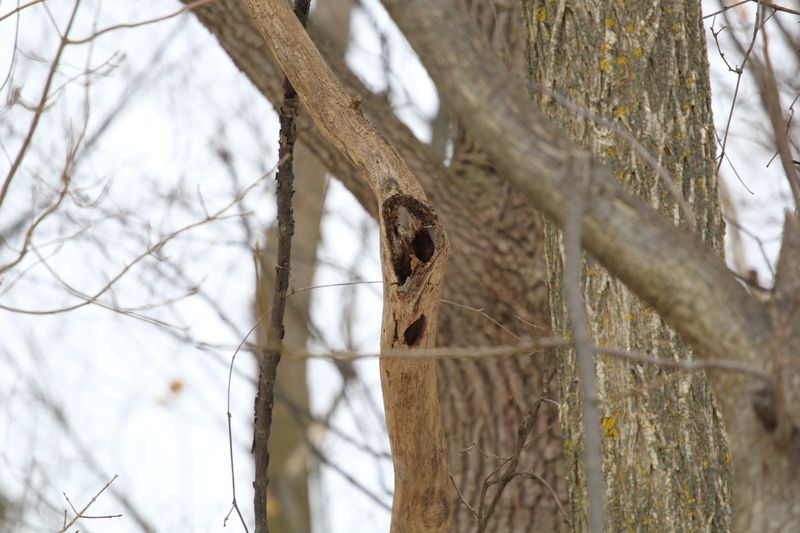 The nest is indeed the target for numerous predators such as ants or hawks. If this step is successful, an egg can be produced. 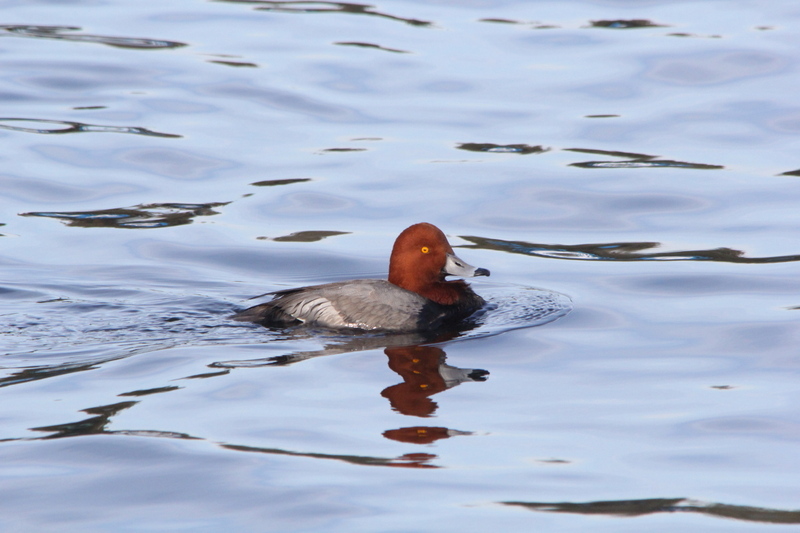 The female will not lay an egg if the conditions, such as temperature and nesting site, are not optimal. If the first attempt fails, her time to lay an egg is reduced. 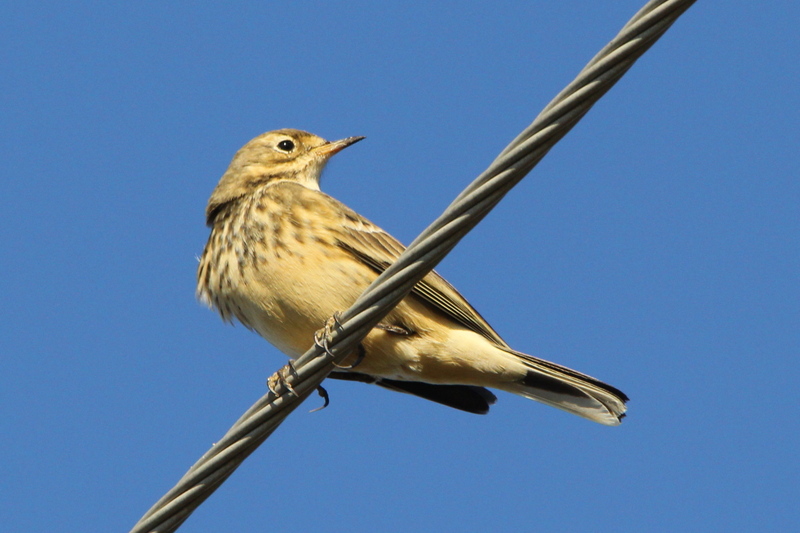 In general, American pipits continuously lay eggs over a period of 4 to 5 days after snow-melt (in April–May) to mid-July. In general, the clutch size is 5 eggs but it can vary according to snowfalls, the parents’ reproductive ability and predation. Eggs are incubated for 13–14 days. 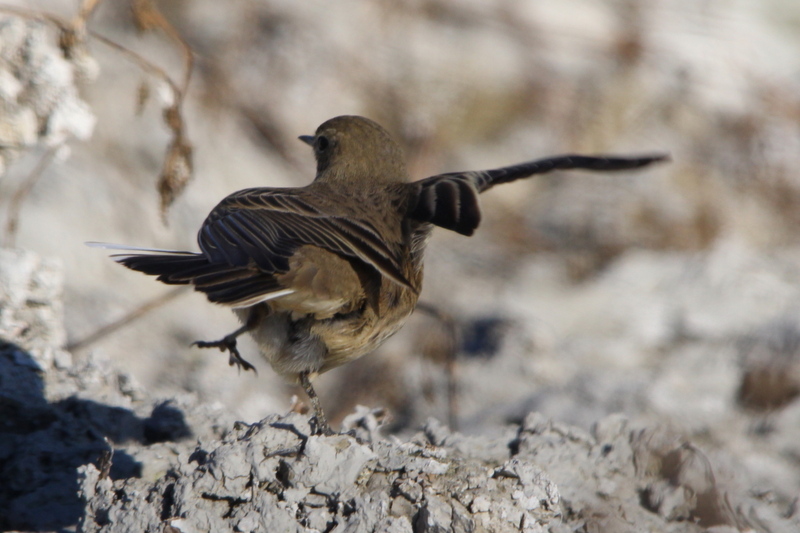 During this time, the female does not leave the nest, but is still very reactive to any movement around its habitat. 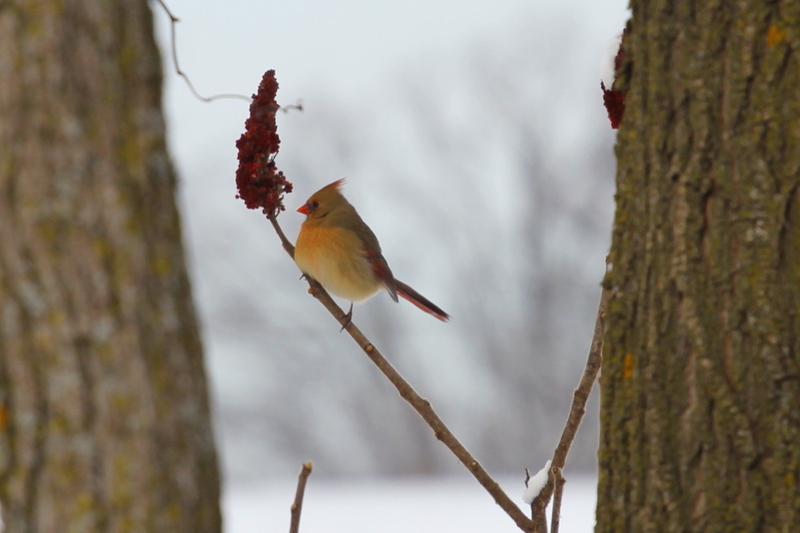 It communicates by singing to the male that brings her food and defends its territory. 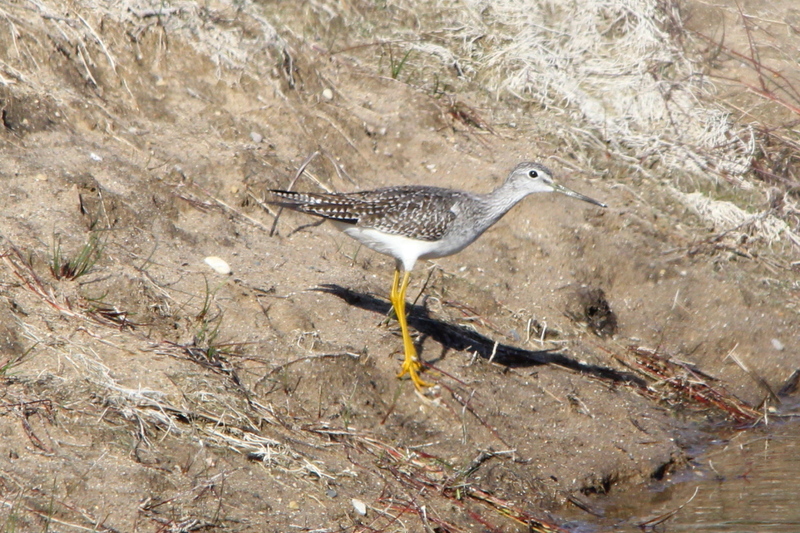 Four or five days after hatching, the young is skinny, blue-gray in color and only has its secondary feathers. For a week, the female will brood its clutch but both parents will feed them. After these 7 days, the birds are ready for fledging but they will still be fed by their parents 14 days after their departure. Finally, immature birds will form little flocks with other immature birds and wander off. This is number 141 in my photo life list, only 209 to go! Well, another day, another week, another year, there are ones that stick out, but for the most part, they all run together after a while. This week is starting out like most, I’m sitting here drinking my morning coffee, pondering the week ahead of me. The big news this week will be the weather, it began snowing yesterday while I was out walking, and the snow continues to fall as I type this. So far it has been a light snow, we’ve only received a couple of inches. 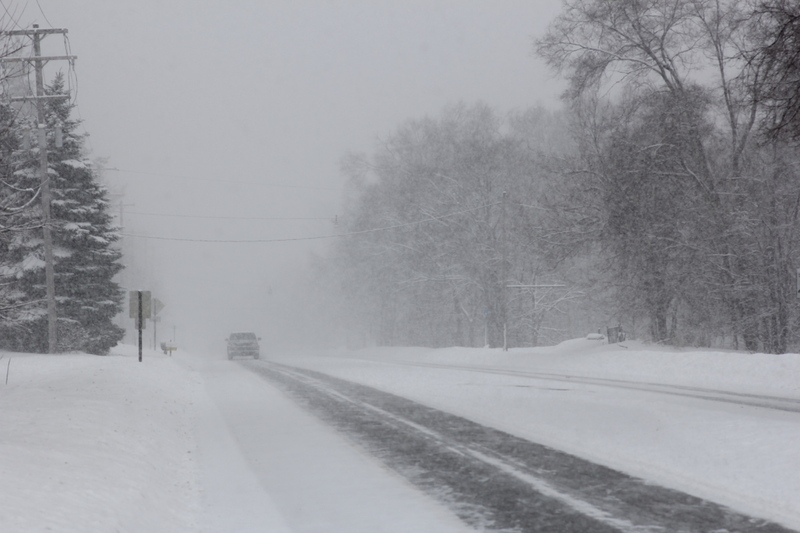 The heavy snow is forecast to arrive later today, and continue on through Tuesday. It’s still relatively warm outside, and my apartment is back up to 70 degrees again, so all is well right now. The really cold air arrives this evening, with temperatures falling until Monday night, when we may get as cold as -7 F (-22 C), with a strong northwest wind driving the wind chill readings to around -25 F (-32 C). Monday and Tuesday are forecast to be brutal as far as the temperatures and the wind, so I may just take a day off from walking on at least one of those days. Yes, I’m going to wimp out. There comes a time when you have to ask yourself how many times do you really want to face weather like that. When you’re younger and full of vim and vigor, weather like that is one thing, something to be overcome, and a source of bragging rights. I’ve been out ice fishing, rabbit hunting, and even steelhead fishing in weather conditions like what are forecast, and when helping out at a relative’s farm, there was no choice but to face such weather. Farm animals have to be tended no matter what, and there were always other chores requiring one to go outside. But I have to face it, I’m getting old. Brutal weather is no fun any longer. I’ll get enough of the weather while I’m working, there’s no need for me to add to my exposure to it for “fun”. Changing the subject, yesterday I played with the new Tokina lens a little more, and loved the results. The subjects that I photographed were rather bland as far as color, so with some time on my hands, I shot a few photos with that lens indoors. I’m not going to post those photos, as they were of colorful packaging that I found to test the color rendition of that lens on, and all I can say is that the results were spectacular! 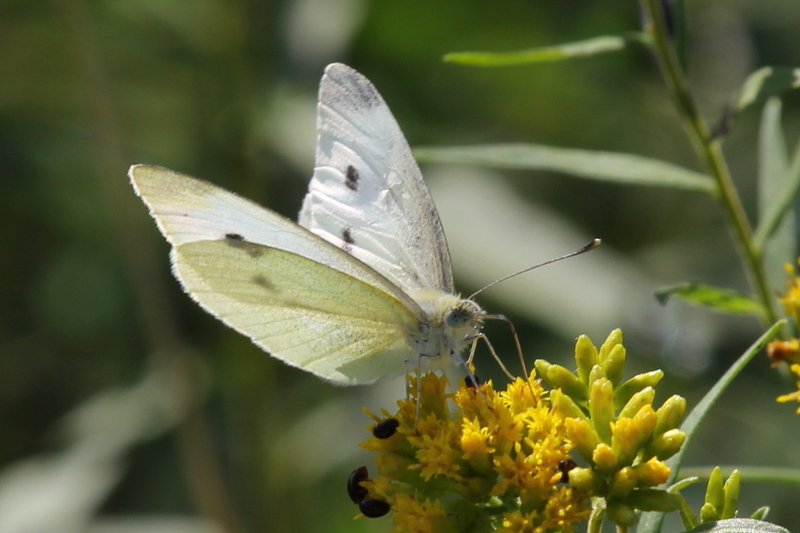 Spring, with colorful flowers and butterflies can’t get here soon enough for me! So, I have added a widget to my blog that will do a countdown to the first day of spring, as a way of reminding myself that it really isn’t that far away. Later, I will change it to countdown to the days when I am starting longer trips or my vacation times. OK, back to the new Tokina lens, I haven’t shot many photos with it yet, but the few that I have taken have strengthened my resolve to purchase a long prime telephoto lens, the Canon EF 400 mm f/5.6 L series is the one that I am saving for, as you may well know by now. Modern zoom lenses are great, but they can never quite match the performance of a fixed focal length lens. I look at the photos that I have shot with the Beast (Sigma 150-500 mm lens), and it’s hard to believe that there are better lenses out there. When I look at the photos that I have gotten with the Canon 70-200 mm L series lens, it gets even harder for me to believe that a prime lens can be better, but the few photos that I’ve gotten with the Tokina tell me otherwise. As I’ve been typing this, I have been looking out the window from time to time, watching the snow coming down steadily, blowing around at times, and building up on the cars in the parking lot. I so much want to get back to shooting good photos again, and spring is still just over two months away, which seems like forever right now. I have to tell myself that things will improve before spring technically arrives. A nice day or two towards the end of January will get the birds behaving as if spring were here for the time that the nicer weather lasts. 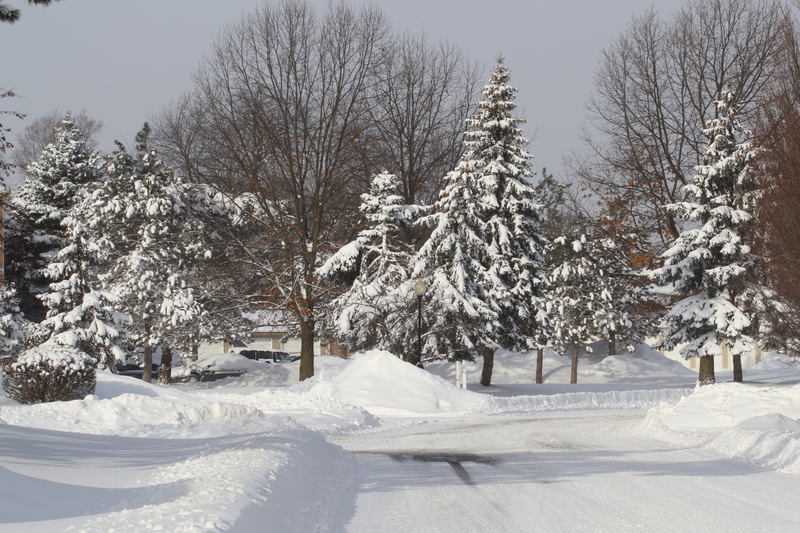 Those types of days will become more frequent through February and early March. It really won’t be all that long, I have to remember that patience is a virtue. 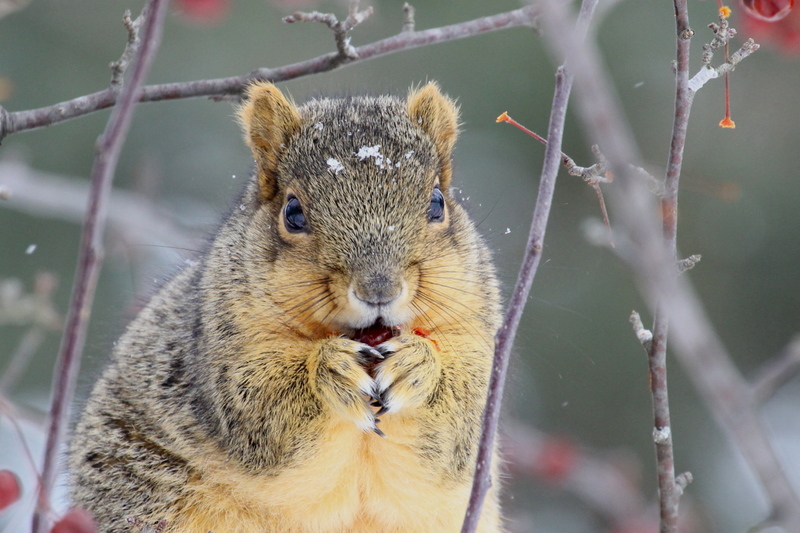 Well, I’ve finished my breakfast, I suppose that there’s nothing left to do but bundle up and face the snowstorm. Yup, there’s a real snowstorm happening out there! Today was one of those rare instances when the weather outside was worse than what it looked through the window. For one thing, a lot more snow had fallen than what my view led me to believe. There’s some one stuck in the parking lot even as I type this. And, that leads me to something else I have to say about today’s walk, twice I climbed the three-foot tall snow bank on the edge of the sidewalk to avoid possibly being hit by out of control vehicles. People are such complete idiots when it comes to driving in this kind of weather. There’s a bunch of them that refuse to drive more than 15 MPH when it’s slippery, and another good size bunch that think that they should still be driving at 10 MPH over the speed limit, which where I walk is 40 MPH. When the two types of drivers meet, there’s trouble! Both of the times when I planned my escape up the snow bank, there were fast travelling vehicles coming up on the very slow drivers, both times, the drivers going too fast waited until it was really too late to slow down, and they began sliding all over the road trying to keep from hitting the slow vehicles. Turns out that I never was in any danger, but you never know where a vehicle that’s out of control is going to end up. Those were just the two near collisions that I watched close to me, there were many others, as people refuse to slow down for anything, as if saving a second or two were worth life or limb. Anyway, before I go off on a really long-winded rant about the way that people drive, I had better change the subject. I shot a few photos today, but they are bad, other than they are a record of the weather, so I went back to July of 2013 for this one to kick this post off. Now, for the opposite kind of weather. It was hard getting around today, not just for cars but for me. What I thought was an inch or two of new snow turned out to be around four. That’s not really all that much, but on top of bare ice left over form the ice storm a couple of weeks ago, it made walking tricky in places. I was wearing my Yak Trax, but their effectiveness is greatly reduced in conditions like today. So, I did only the three-mile long version of my walk today, even though my legs are trying to tell me that we went much farther than that. The snow falling today is synoptic snow, that is, it is due to a storm, not lake effect. Synoptic snow is heavier and harder to walk through than the light, fluffy lake effect snow that we get most of the time. Well, that’s about it for the day. This storm is the real deal! I can’t say how much snow has fallen since it began, but last night I went out to help a couple of people who were stuck in the parking lot, it looked like about a foot then. It was hard to tell though, because the wind was blowing and drifting the snow around so much. There was a three-foot high snow drift near where I had parked my Forester, I’m sure that there are even bigger drifts around than that. This is one time when the storm has actually been worse than what the first warnings indicated that it would be. Every time that I checked the online forecast yesterday, they had upped the total snowfall forecast, so I stopped checking it after a while, hoping that the predicted snowfall wouldn’t go up any more. I haven’t been outside this morning, but I can tell from looking out the window that it’s brutal out there. When I first got up, there was a heavy snow-band over the area, I could hardly see the woods 100 yards south of my apartment. The snow has let up a little since then, but the wind hasn’t. It’s blowing and swirling the snow around, and now that I can see the trees, I can see them swaying in the wind, which is never a good sign when they don’t have any leaves on them. The actual storm system that brought the bulk of the snow yesterday has moved on to the east, the snow that has been falling this morning is all lake effect snow. It’s funny, I know that it’s bad out there, I’ve seen plenty of snowdrifts and stuck vehicles in my life, but there’s a part of me that wants to go out there and experience firsthand just how bad it is. So, I guess I’ll get something to eat and take a stroll through the apartment complex. I’m not going to walk down the main road to the trail today, there’s no need for me to be in the way of the vehicles trying to get around in this weather. Sure enough, it’s nasty out there! My guess of about a foot of snow was about right, I haven’t seen a storm total yet, but from the updated season snowfall, we’re now over a foot for this storm. I’m not sure how far I walked today, I went all the way around the apartment complex, my guess is between one and two miles. I got a little extra exercise shoving vehicles that were trying to move out of the snowbanks that they were stuck in. I’m sure glad that when I bought my Forester that I opted for the winter weather package. Even though I seldom use the heated seats, the windshield wiper heaters and the heated mirrors were worth the cost of the package. I say that because I moved my Forester to a portion of the parking lot that had been cleared so that they can clear where I normally park. Not only does the winter weather package make it easier to get and keep the windows and mirrors clean of snow, there’s Subaru’s legendary all wheel drive system to love as well. While other people couldn’t get out of the parking lots, my little Forester walked right through the snowbanks with no problem at all. I learned a couple of things today, one is that there’s a nice little picnic area on the other side of the apartment complex from where I live that I never knew was there before. I also found out where all the birds are hanging out, I saw more birds today than I have in a month around here. They are all hanging out around feeders that people here in the complex and the surrounding homes have put up for the birds. 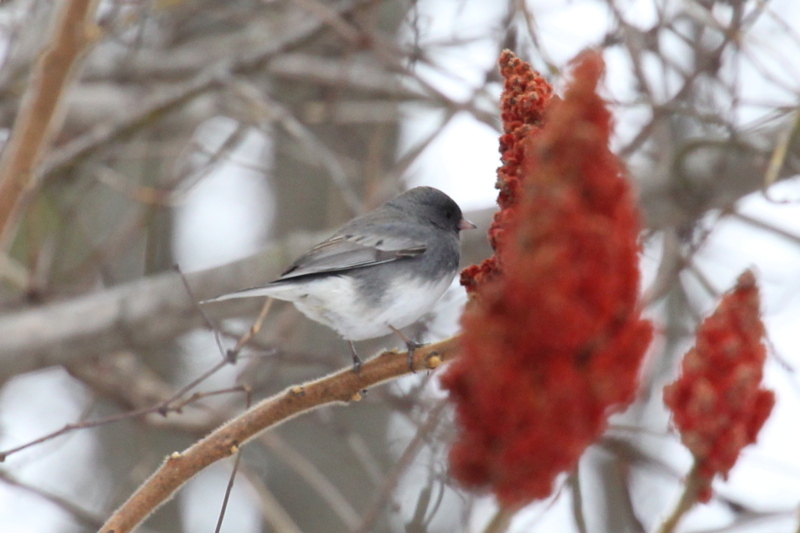 There were small trees near feeders that were full of finches, Juncos, chickadees, and the other tweety birds that stick around here all winter. 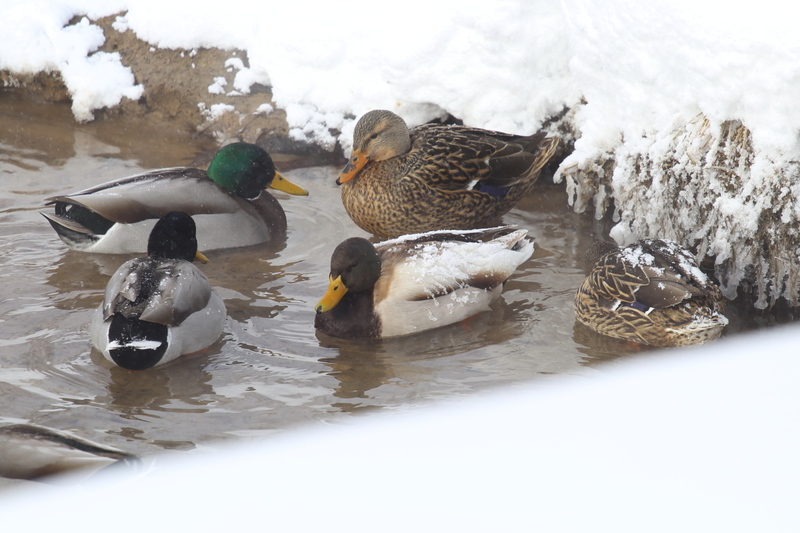 I also found a large flock of snow-covered mallards on the banks of the creek that flows through the complex. 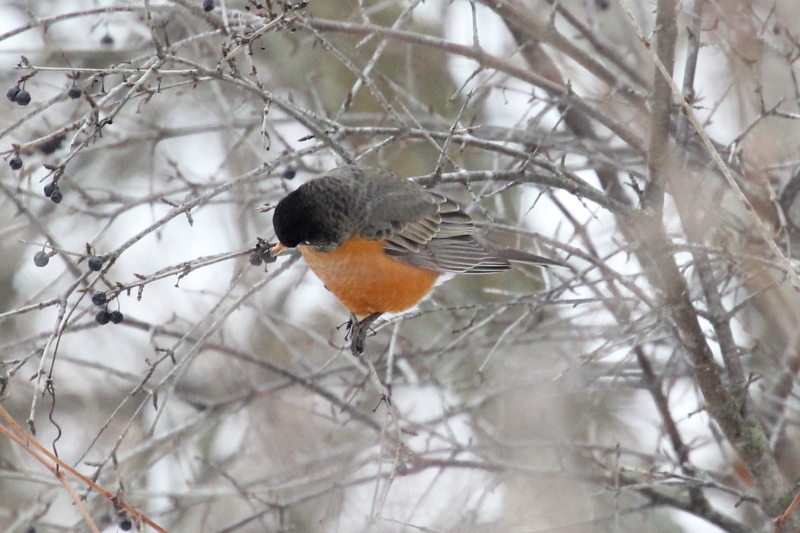 Smart birds, snow is actually a very good insulator, and when they are covered by the snow, it makes it harder for predators to see them. I almost wish that I had taken a camera with me, but conditions were far too bad for photos. So, I went through my past photos for this one from July of last year. Tomorrow is forecast to be very much like today, so I may do the quick walk around the apartment complex again. Good news though, the forecast is calling for a moderating trend and possibly a January thaw this weekend, I sure hope so, they are running out of places to put snow just about everywhere. It’s still very cold, but the sun is trying to break through the clouds, there was a good sun dog earlier this morning, but it’s gone now. The wind is still fierce, as I can see the leafless trees swaying in the wind, and snow swirling in front of my window. Every one is still working to dig out from this last storm, and the wind is making it difficult. As soon as an area is cleared, the wind drifts what had just been cleared full of snow again, and that applies to the roads, sidewalks, and everything else. 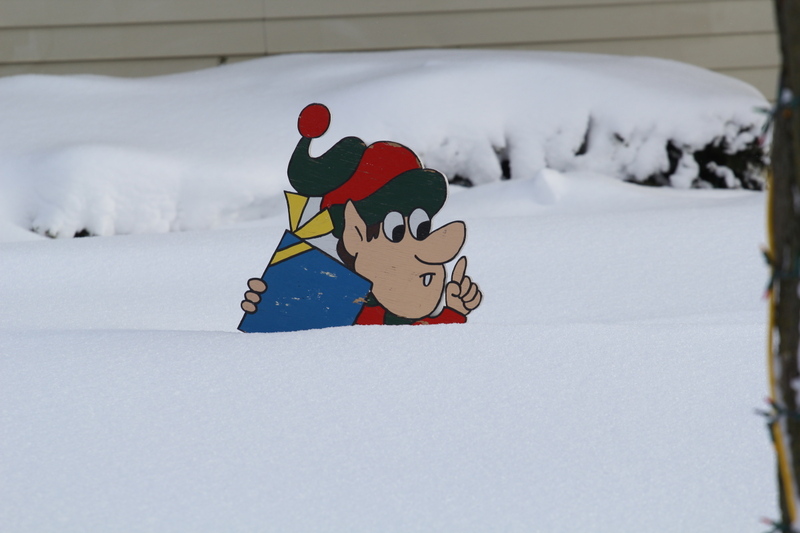 We’re over four feet of snow for the season, the snow banks are getting so high that it’s hard to see over them. The good news is that today may be the last of the brutal cold for at least a while, and we may get a January thaw starting this weekend. I’m back from a walk around the apartment complex again today, this time I brought my camera and the L series lens with me, since there was some sunshine. I don’t know why, but it felt colder today than it did yesterday, even though it wasn’t snowing. The wind yesterday was strong and steady, today, it was gustier and swirled more, maybe that’s the reason it felt colder. 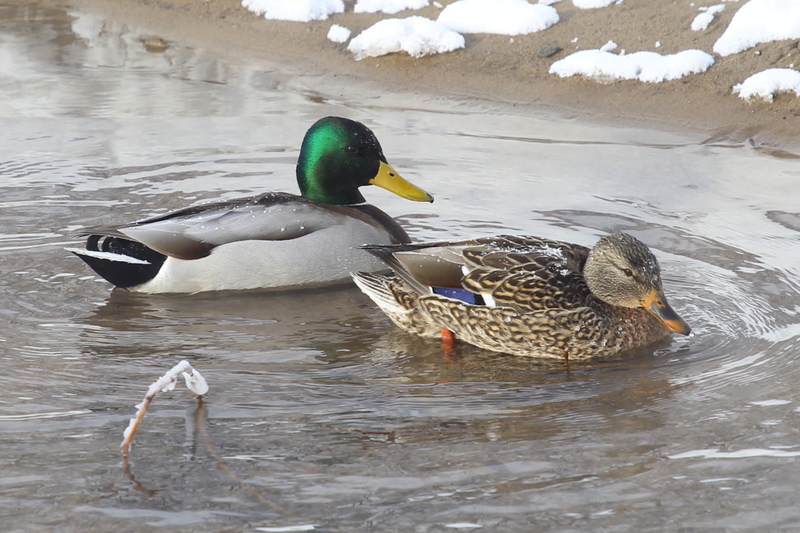 I stopped off at the creek where I had seen the snow-covered mallards yesterday, and I shot a few photos even though the mallards didn’t have much snow on them today. 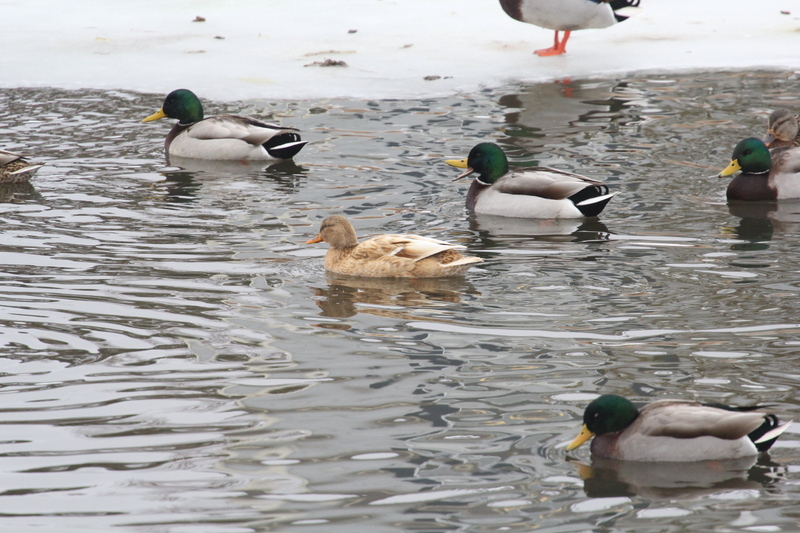 Two things to note, one is that the mallards use that spot to rest because it is where the road crosses the creek, and at the first sign of danger, the flock swims into the culvert under the road so that they are completely out of sight. The other thing is that while I have said that I haven’t been testing the limits of the Canon 60 D bodies, when it comes to dynamic range, I have been. 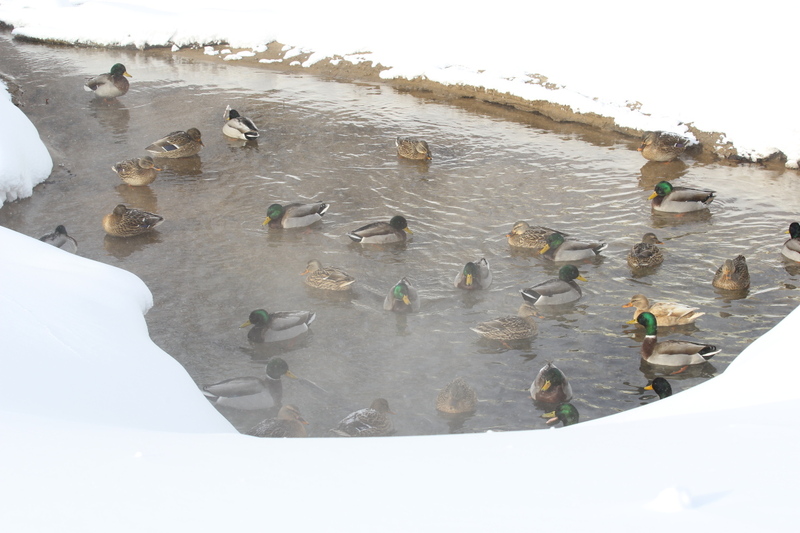 You can see that the white of the snow was blown out in some of those photos, even though the ducks are exposed correctly. I had some trouble with that while I was on my vacation to the UP this last fall, it wasn’t snow then that showed the problem with the lack of dynamic range with the 60 D bodies, but the sky and clouds in some of my landscape photos. I won’t rehash that right now, I’ll just say that if the Canon 60 D body has a weakness it is that its dynamic range is less than some other cameras on the market in close to the same price range. No matter what brand of camera gear that you buy, or how much you spend, there are always trade-offs. I chose Canon because of the availability of quality lenses that fit my needs as far as the types of photos I shoot, and in the price range that I can afford. The 60 D body was the best that I could afford at the time, and I was aware of its limitations. So while its dynamic range capabilities may not be the best, overall, it is still exceeding my expectations. So far I have been able to work around the short comings as far as dynamic range through either careful composition, or cropping. That’s why I spent so much time researching cameras and lenses, so I would have realistic expectations as far as what their capabilities were, and that they would be the best choices for the photos that I shoot. 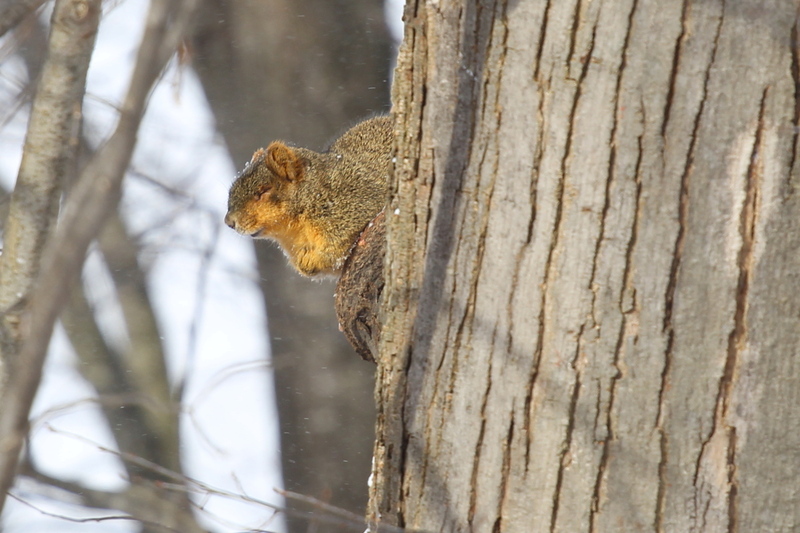 Anyway, here’s my favorite photo from today, a fox squirrel dreaming of spring. Well, that’s it for today. Another very cold but sunny start to the day. 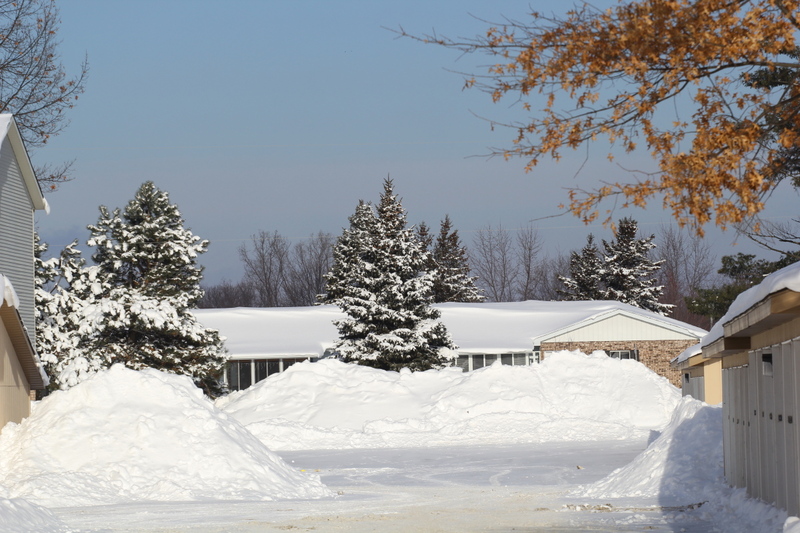 The sunshine didn’t last long yesterday, and there was more lake effect snow most of the day and into last night. The roads have become skating strips, the salt that they use doesn’t work when it’s as cold as it’s been, or so they say. They haven’t been putting anything on the roads, not even sand or gravel which would give drivers at least a little traction. I’d better leave it at that, or I’ll go off on a long rant about the roads, the government, and work, so I’ll change the subject. Before the Nikon camera that I used to have died, I began researching its replacement. I had chosen the Canon line, for reasons that I won’t rehash now, and one of the lenses on my wish list was the 400 mm L series prime telephoto. When the Nikon died before I expected, I was forced to make the switch sooner than I had planned, which is why I purchased the Beast (Sigma 150-500 mm lens). Anyway, after using the Beast for a while, and looking at other lenses that fit my Canon body, I switched from the 400 mm lens to the 300 mm L series prime telephoto as far as my want list. Part of that is because of the close focusing capabilities of the 300 mm lens, it focuses on subjects half as far away as does the 400 mm lens. The other part of the reason was because I couldn’t get a good photo of a bird in flight with the Beast at the time. I thought that it was due to the long focal length, but it turned out to be the Optical Stabilization built into the Beast. But then, I decided to purchase a true macro lens, so I didn’t think that close focusing in a long telephoto was that important. But, it’s hard to get close enough to insects such as dragonflies and butterflies with a 100 mm macro lens. Before this becomes extremely long, I’ll sum it up by saying that I am back to being undecided between the 300 mm and 400 mm lenses. The 300 mm close focuses and has Image Stabilization, the 400 mm is slightly sharper. The 300 mm retains auto-focus when using a 1.4 extender, the 400 mm doesn’t. The two lenses are very close in price, with the 300 mm lens $100 more expensive because of the IS. A lot of my indecision has to do with my flip-flopping back and forth on purchasing a teleconverter as well. One of the things that led me to check out the 300 mm lens in the first place was from talking to another birder who was using the 300 mm and a 1.4 extender, which yields an effective focal length of 420 mm. His set-up worked very well, as we shot photos of a redstart while standing side by side. But, after seeing the quality of photos that I was able to get from the Beast, I crossed an extender off from my want list. That is until my brother bought a beast of his own, and showed me the photos he got from it with an extender behind it. That, and reading how well the Tokina macro lens that I just purchased works while using an extender behind it, so now I’m back to having the extender on my want list. If I photographed only birds, the hands down choice would be the 400 mm lens, to get the very best quality photo possible. But, that isn’t the case, I’ll shoot about everything that there is to see in nature, and dragonflies and butterflies are some of my favorite subjects. That makes the 300 mm lens a better choice. The best solution would be to have both of those lenses, but that’s not in the cards right now. I went for my walk today, I walked to the street first to see how it and the sidewalk looked, and to my surprise, the sidewalk had been cleared. So I set off towards the park where I normally go. When I arrived at the trail to the actual park, it was covered in more snow than I cared to slug through. Instead, I walked to the dead-end street in one of the sub-divisions that surround the park, thinking that I could get to the park that way, as there is an entrance to the park at the end of the cul-de-sac in the sub-division. No luck there, the entrance to the park had been plowed shut with a four-foot snow bank to climb over to get into the park. 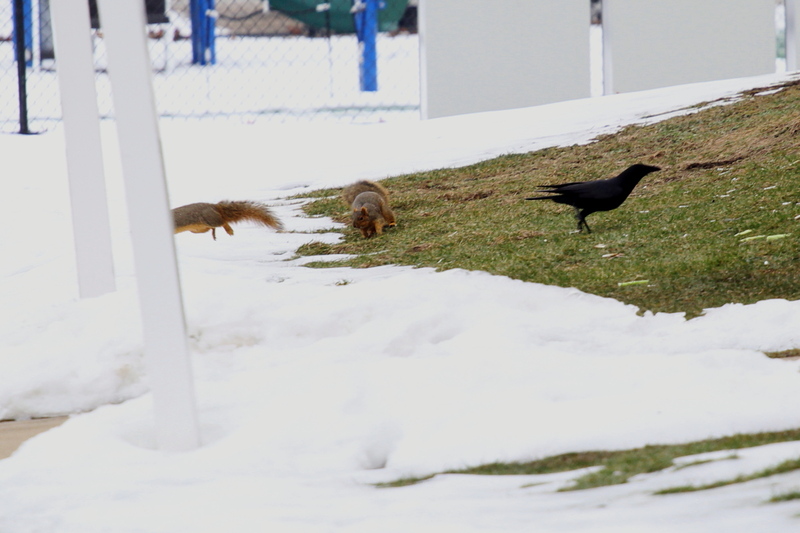 I could walk all the way around the park and enter it off from the main road that runs past it, but I decided not to bother today, I wandered around in the sub-division watching the birds at the bird feeders there. 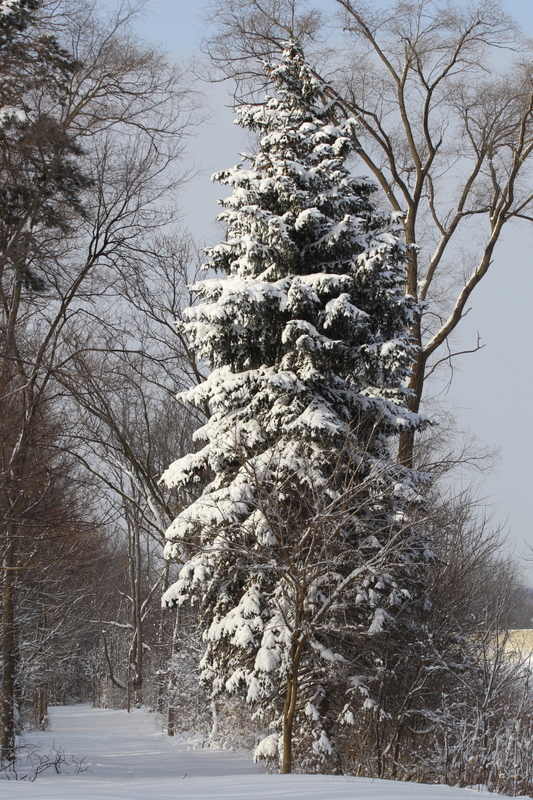 I did shoot a few photos, nothing special, just snowy trees, because even though it’s been very cold, it’s still beautiful. Now then, the warm up is forecast to begin in earnest tomorrow, and if you can believe this, rain on Friday night into Saturday. It may even be above freezing with sunshine on Sunday, if so, I’ll be going somewhere other than around home for my walking that day! I overslept by two hours this morning, it’s been a long time since that’s happened. I’ve had to work late every night this week, I guess that it finally caught up with me. I feel as if I were hung over and would like to go back to bed and sleep a while longer, but the sun is trying to shine through a thin layer of clouds. It’s still cold, but at least it has warmed up to almost average, rather than the way it’s been so far this week. The warm up is predicted to continue, but with its own set of problems. The forecast calls for close to an inch of rain Friday into Saturday, that’s going to create a huge mess! We have over a foot of new light fluffy snow, but it is resting on a layer of crusty snow that had begun to melt, then was covered by freezing rain, then frozen solid again. The rain will soak into the new snow, but not the crusty snow, at least not until it too begins to melt. On top of that, after the rain ends, it will dip below freezing again at night, causing everything to re-freeze again. Well, at least the good news is that the next week looks to be about average as far as temperatures, maybe even slightly above, so we will have a January thaw lasting long enough to melt most of the snow. The wildlife can really use that. I’ve been seeing deer in the evening as I drive for work, they’ve been digging through the snow and ice trying to find enough food to survive. This thaw will certainly help the deer out, as well as the birds. It’s well past time for breakfast and my walk, so off I go. I’m back, I lost the sunshine soon after I began my walk, which was a shame. Not only did the birds all disappear, but for the first time in two months, the sunshine felt warm. You may say that I am crazy, but I felt the first faint hint of spring while the sun was out. And spring can’t arrive soon enough. I walked down to, and then through the sub-division again today, and since there had been a few people who entered the park, knocking down part of the snow bank which stopped me yesterday, I went into the park as well. The going was tough, and the few times that I stopped to think about shooting a photo, I found that I had to wait for my heart to stop pounding and for my breathing to settle down before I could remain steady enough for a photo. For the first time in at least a week, it felt good to be outside, and it felt even better getting a couple of photos of a bird, even if the photos aren’t great. Spring is drawing nearer, it really isn’t that far away now. I know that there’s some rough weather left to be overcome, but the end of it is in sight. If it is raining as hard as they say it will be on Saturday morning, I may spend some time at the camera store checking a few things out. One good thing about the terrible weather, I’ve put in enough overtime to be able to afford a 1.4 teleconverter, if I can find one compatible with my lenses. I didn’t write anything before I went out for my walk, I had some things to take care of first. It’s warmer, just above freezing, but it’s also foggy and very gloomy today. I’m feeling a bit under the weather, I’m sure that it’s because of the rapid change in the weather. 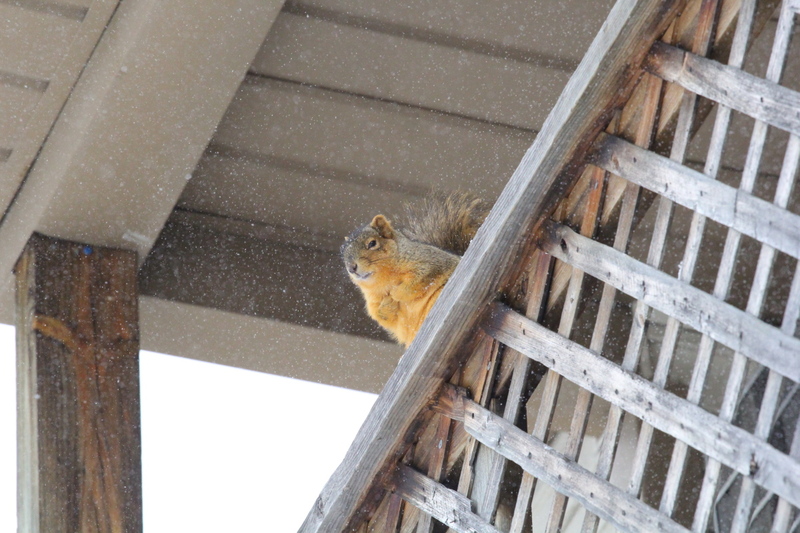 That has me wondering, do rapid changes in the weather affect wildlife in the same way? In some cases, it seems to, other times, it doesn’t. I’m afraid that we’re going to end up with a sloppy mess around here, it’s already starting to become one, and the rain which is on its way hasn’t begun to fall yet. The snowbanks along the sidewalk are at or above waist level to me now, that’s a lot of snow. There’s still a foot or more of snow on the ground in most places that haven’t been cleared. It was difficult getting around in the park today because of the amount of snow, and the fact that it is just beginning to thaw a little, making it heavy. 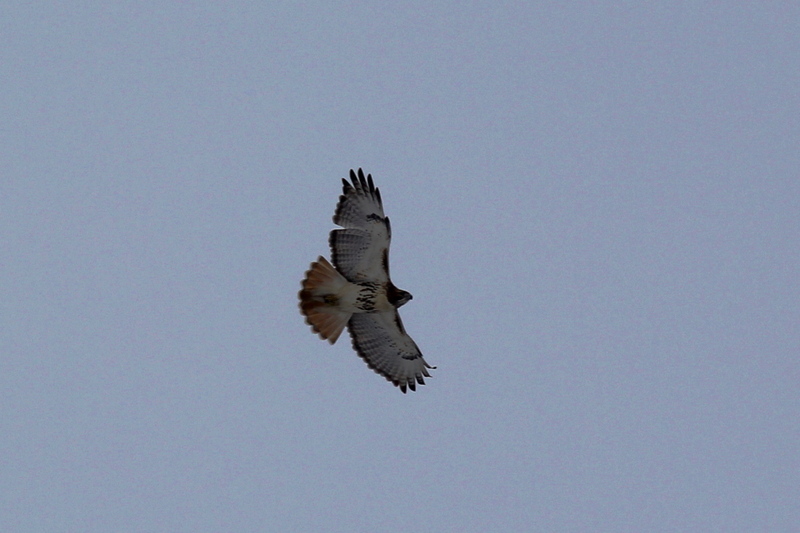 One of the red-tailed hawks seemed to be following me around, but kept its distance most of the time I was out there. 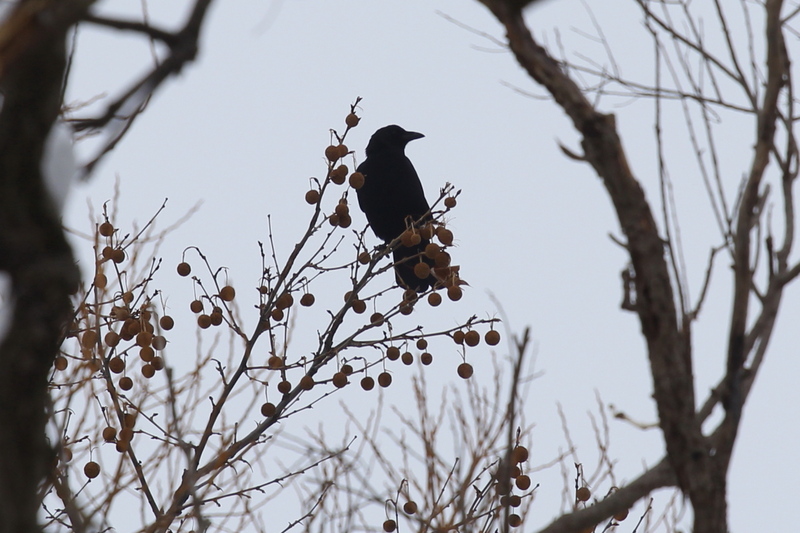 I shot a couple of photos of it perched about two hundred yards away, but there’s no reason to post them. 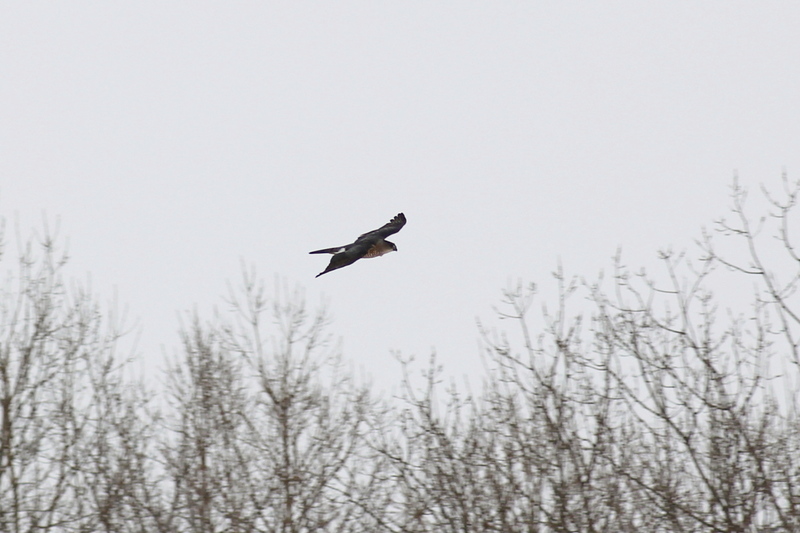 Not when as I was almost done with my walk, the hawk decided to give me a break and do a fairly close fly by. I’m not 100% positive, but I think that the hawk is “Bruiser” the mate to Bertha, the very large Red-tailed hawk the resides near here. This one doesn’t look stocky enough to be Bertha, but it could be the light. 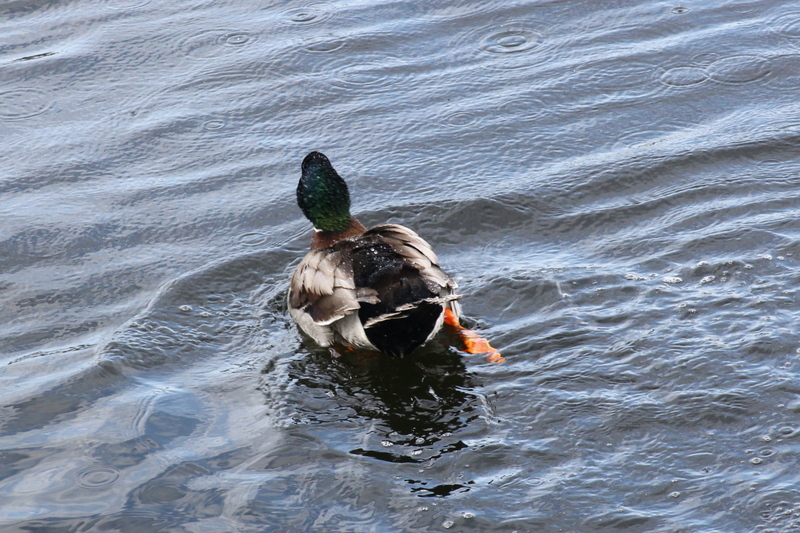 I’ll have to check to see if she’s missing a few flight feathers the next time I see her. 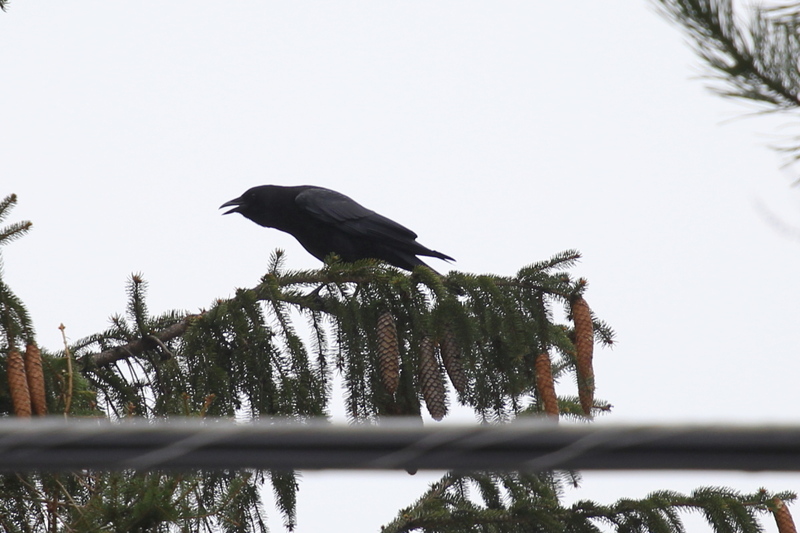 To prove that I’m a glutton for punishment, I tried to get a good photo of a crow in these conditions. I shot that one at +2 full stops EV. 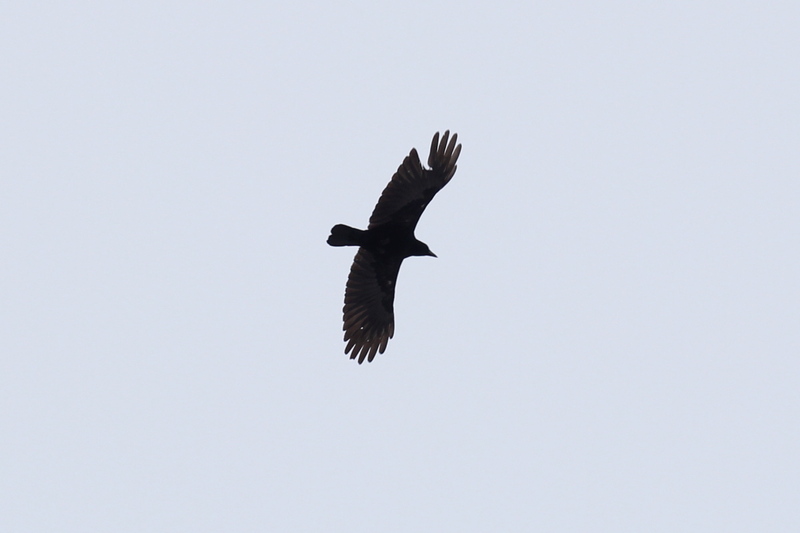 Then, to prove that I am crazy, I tried to get a good shot of the crow in flight. 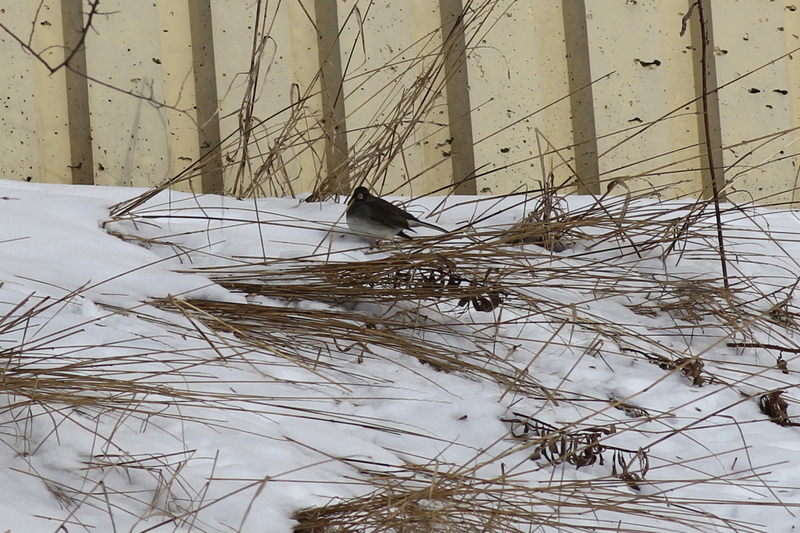 Sure enough, trying to get a good photo of an all black bird in the weather conditions like today is a fool’s errand. But, if I were to see a rare species on a day like today, at least now I have some idea what settings would result in a photo that I could use here. That’s it for what I have to say about my walk, time for a few other things. My order from Cabela’s has arrived in the store, and I should go over and pick it up, they may be less crowded today. 😉 That store is always crowded, and besides, I think I may make some other stops when I do go, specifically, the camera store. Yup, I’m going to ramble about photo gear again, sorry if I make your head hurt Mr. Tootlepedal. I am gong to try to ramble less this time, and be more on point. OK, I’m torn between the 300 and 400 mm L series prime telephoto lenses from Canon. There are two reasons that I would like either of them, they are much lighter and smaller than the Beast, therefore easier to carry on long hikes, and photo quality would be at least marginally better than what the Beast can produce. The strongest thing going for the 400 mm lens is absolute photo quality, it is one of the sharpest lenses in Canon’s line. The cons are that it doesn’t focus to less than 11 feet, and it doesn’t have Image Stabilization. But, the cons are also pluses in a way, because of its limited focus range, that lens is quicker to auto-focus, great for birds in flight. One of the reasons the lens is so sharp is that it doesn’t have the added optics for IS, if you can hold the lens steady enough. 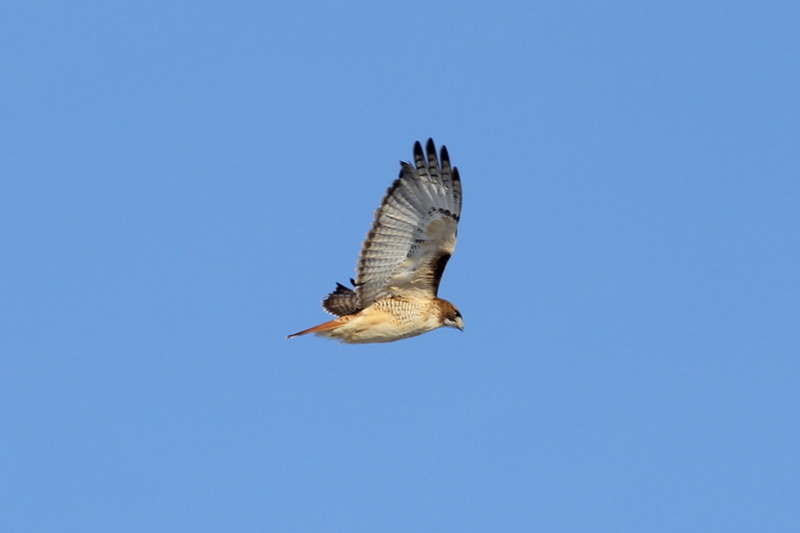 I have also found that I have to turn the IS off to get sharp photos of birds in flight most of the time. The biggest thing going for the 300 mm lens is that it is more versatile, because it will focus to just under five feet, making it a near macro lens. 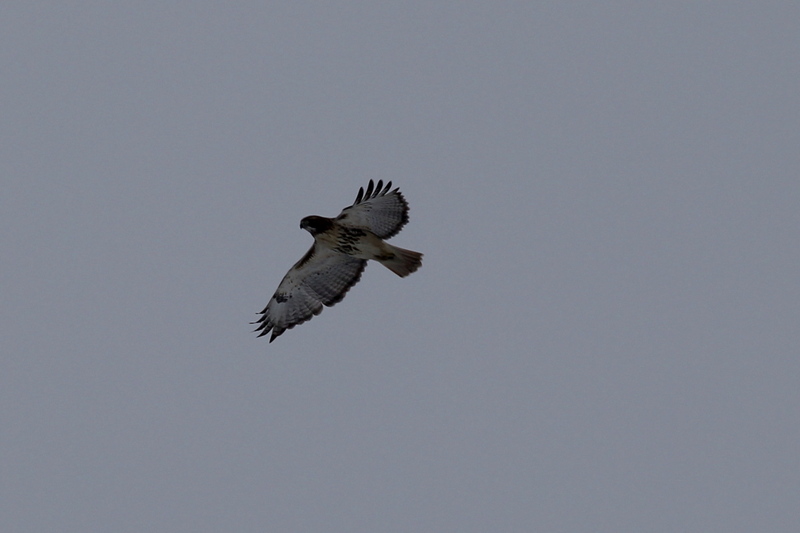 It also has IS, good in low light, but which I would probably turn off for bird in flight photos. The cons are that it isn’t as good optically as the 400 mm, even without adding a 1.4 extender, which I would end up doing. If I do add the extender, then the 300 mm probably wouldn’t be any sharper than the Beast, just easier to carry. I’m not sure that I can justify spending that kind of money just to get a lens that’s easier to carry. Now, the next logical step that I had forgotten about, I have the excellent 70-200 mm L series lens, which if I add an extender to, becomes a 98-280 mm lens, almost the same as the 300 mm lens, but the zoom will focus one foot closer, even with the extender. So, for larger insects that are difficult to get close to, the L series plus an extender would get me to where the 300 mm prime would. The fly in the ointment is compatibility, as far as the extender, and which one will fit my lenses. I would like to use one behind the Tokina macro lens to increase its magnification. I would like to try an extender behind the Beast for longer range photos as I am often forced to shoot while birding in the Muskegon area. And, if I can add and extender to the L series lens that I already have to shoot the photos that I would otherwise use the 300 mm prime lens for, then that makes my decision much easier. Truth be told, I’d lean heavily towards the 400 mm prime just to get the very best quality photos possible, but it’s harder to justify that when looking at the versatility of the 300 mm prime. If that versatility is no longer a factor, then my decision has been made, it will be the 400 mm prime. So, I will go to the camera store tomorrow and see if I can find an extender that will work with my lenses. Well, it’s warmer, and it rained all night last night. It’s a gloomy, sloppy, slippery mess outside right now, a good day for some indoor shopping. After breakfast, I’ll take the Beast and the Tokina macro lens to the camera store with me, and try out a few extenders. I may shoot some photos in the store using my camera body, come home and review the photos on my computer, then make my decision as to whether an extender will work for me. Maybe by the time that I’ve finished that, and picked up my order from Cabela’s, some of the small lakes that have formed overnight will have drained. Well, I’m back from the camera store and my other errands, and I have a brand new Tamron 1.4 tele-converter to play with. I did shoot a few photos with both the Tokina macro lens, and the Beast, and considering the poor light, they came out well enough that I could use them in my blog if they had been of anything worthwhile to post. I can see some slight drop off in photo quality, but it isn’t as much as I had feared, less than the drop off that comes from cropping severely. I think that the thing that surprised me the most was how well the Optical Stabilization of the Beast worked with the extender, I shot fairly sharp photos handheld at 700 mm in very poor light and very long shutter speeds for a 700 mm lens. I also tried out the 400 mm prime telephoto lens as well, it’s everything that it’s cracked up to be. Well built, sharp as a tack, and best of all, much easier to carry than the Beast. While I was there, I did a little more checking on tripods and heads, as well as a LED panel light to use for macro photography, so it was a very productive trip. So, I think that I’ll slip on one of the new pair of hiking socks that I got, and take a walk with the L series lens with the tele-converter and see if I can find something to photograph in the fog. I’m back again, it was a horrible day to try out a new piece of photo gear, the rain was changing to snow and sleet, as the winds were picking up out of the northwest. I’ll get to the photos in a second, but first, there was something very satisfying about my walk today, how comfy I was despite the nasty weather. The footing would have been treacherous, hard packed snow turned to ice and covered in water, but my Yak Trax got me through OK. The new New Balance boots, along with my new hiking socks, kept my feet dry and toasty. I didn’t mention this before, but I had also ordered a Polartec neck sock, nothing more than a tube of material that acts much like a scarf would, only better. It sure does keep my neck warm, and the cold breezes from going down my back. So I walked along about as comfortable as a person can be in weather like today. Now then, on to the photos. Being such a rotten day, all of these were shot at ISO 1600, which sure doesn’t do much for photo quality. However, I could tell as I was shooting these that the tele-converter added a great deal of versatility to the 70-200 mm L series lens, for close ups…. …and not a single one of those photos were cropped. I’ll be the first to admit that these aren’t very good, but when you consider that they were all shot handheld at around 1/60 of a second, the lens wide open, and the 70-200 mm lens (now 98-280 mm) zoomed all the way to 280 mm, I can see possibilities there. The tele-converter works as it should, it reports the correct focal length and aperture to the camera, which is a good thing. It get the 70-200 mm lens to where I want it as far as being able to close focus almost like a macro lens, and it increases the reach of the lens more than I thought that it would. And, I have been holding out as far as the best photos from today. And here’s the only cropped photo from today. There is some drop off in photo quality from what I would expect from the L series lens, but it’s hard to say how much of it is from the Tamron tele-converter, and how much is from the slow shutter speeds I used today. Still, these last two aren’t bad considering the weather today. The good news is that they are forecasting sunshine for tomorrow, so I’ll have a better idea of what the new tele-converter can do then. Well, that’s it for the day, and the week, thanks for stopping by. The Black-throated Blue Warbler (Setophaga caerulescens) is a small passerine bird of the New World warbler family. 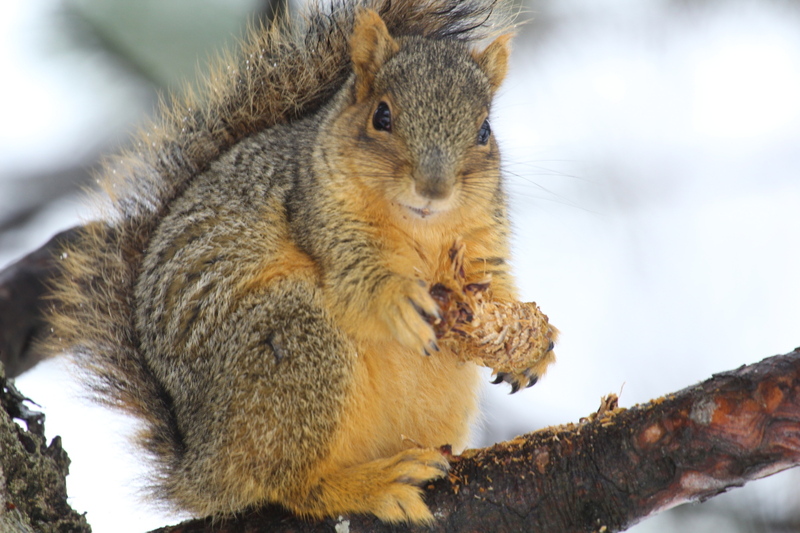 Its breeding ranges are located in the interior of deciduous and mixed forests in eastern North America. Over the cooler months, it migrates to islands in the Caribbean and Central America. 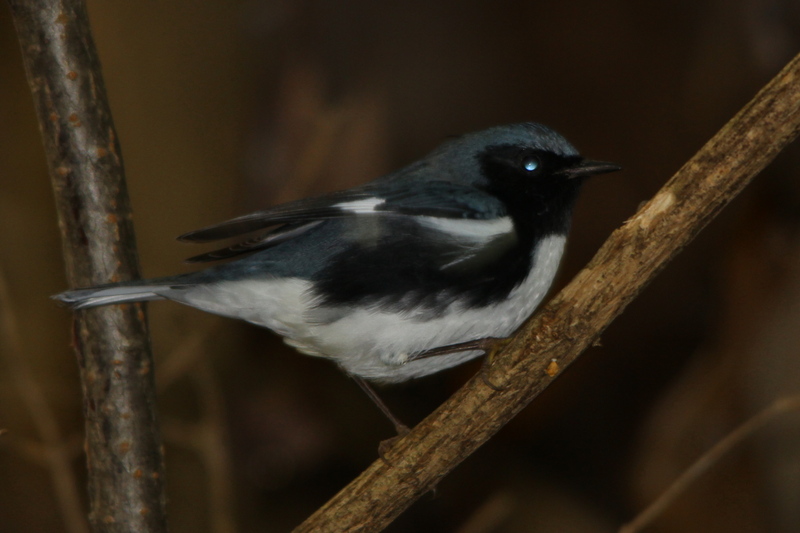 The Black-throated Blue Warbler is sexually dimorphic, the adult male has a black face and cheeks, deep blue upper-parts and white under-parts, while the adult female is olive-brown above and light yellow below. 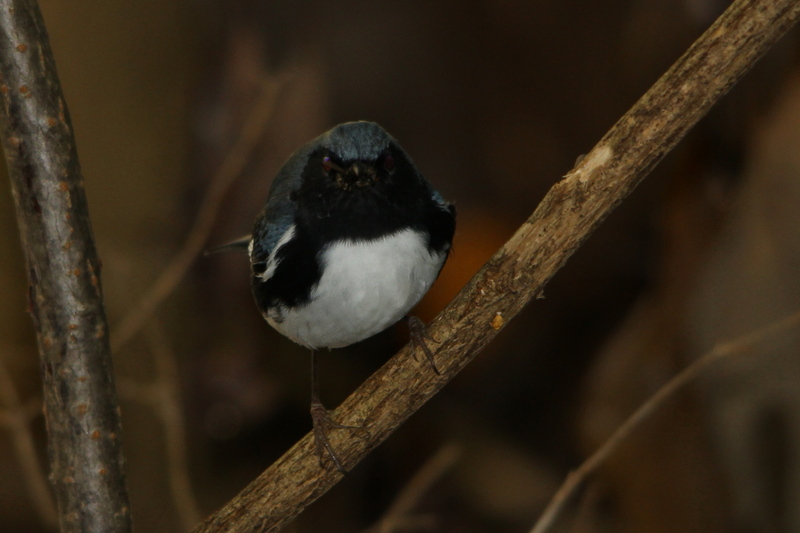 Predominantly insectivorous, the Black-throated Blue Warbler supplements its diet with berries and seeds in winter. 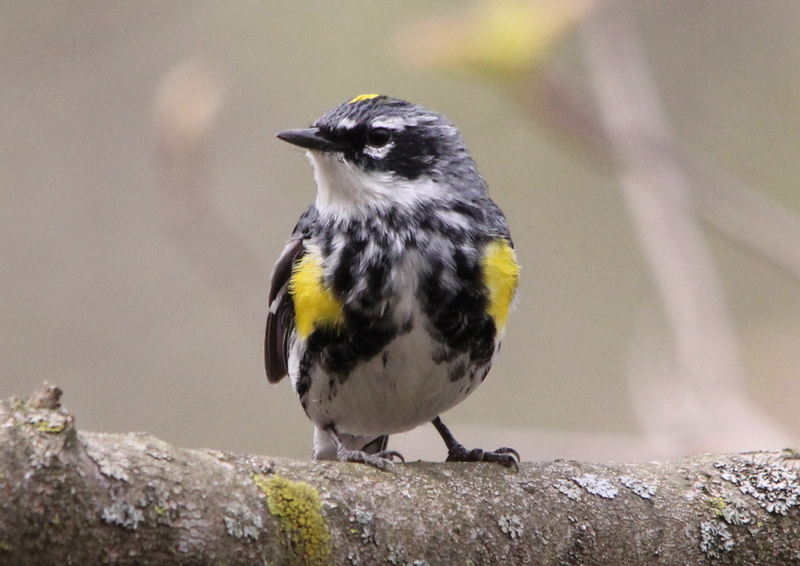 It builds its nests in thick shrubs and the closeness of its nesting sites to the ground make it a favored species for the study of warbler behavior in the wild. The Black-throated Blue Warbler defends its territory against other birds of the same species for both nesting and winter habitats. As the Black-throated Blue Warbler requires large, unbroken forest areas for nesting, its numbers are declining. The Black-throated Blue Warbler measures 13 cm (5.1 in) in length and weighs 8.4–12.4 g (0.3–0.45 oz). 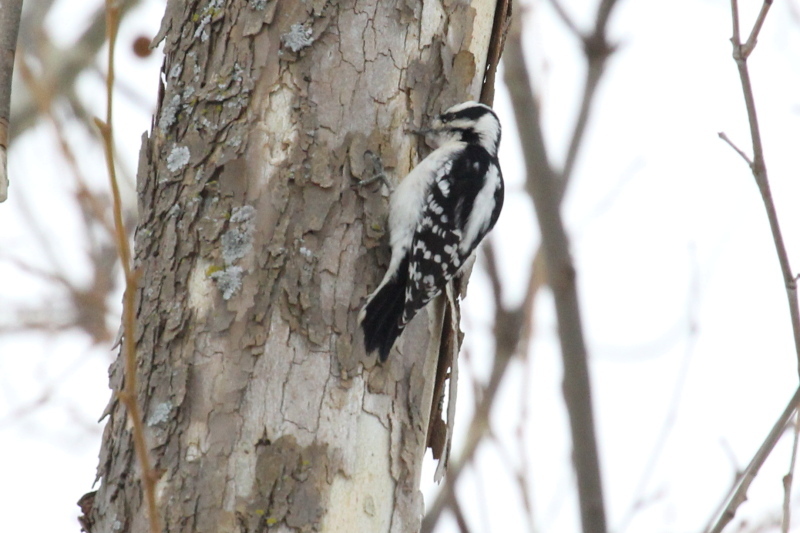 The adult male has white underparts with a black throat, face and flanks. The upper-parts are deep blue. The immature male is similar, but with greener upper-parts. 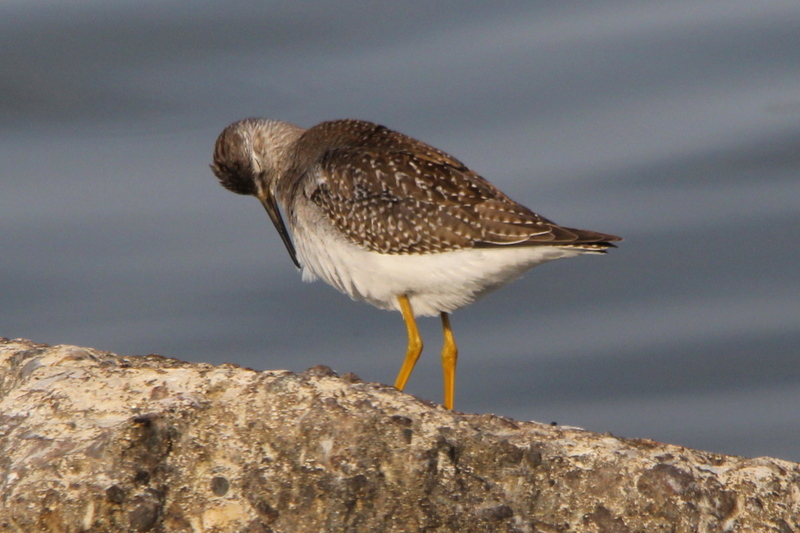 The female has olive-brown upper-parts and light yellow underparts with darker wings and tail, gray crown and brown patches on the cheek. 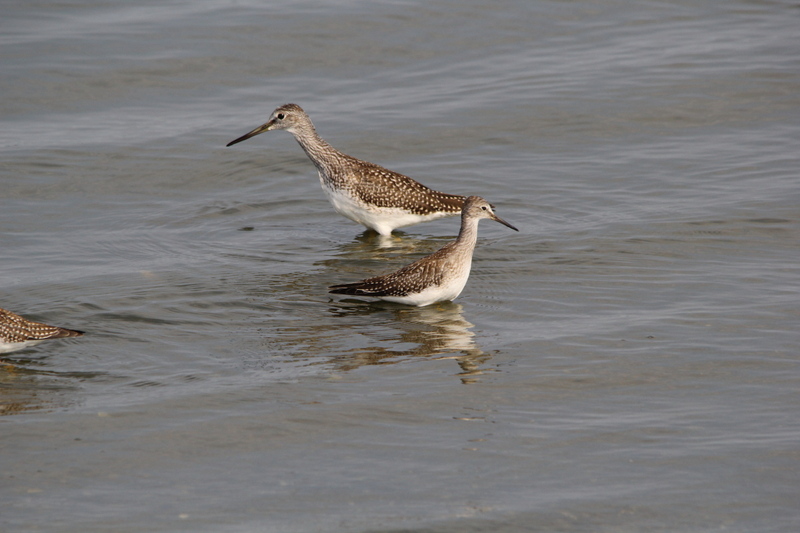 Both sexes have a thin pointed bill and small white wing patches which are not always visible. Like many other warbler species, it has colorful plumage during the spring and summer. 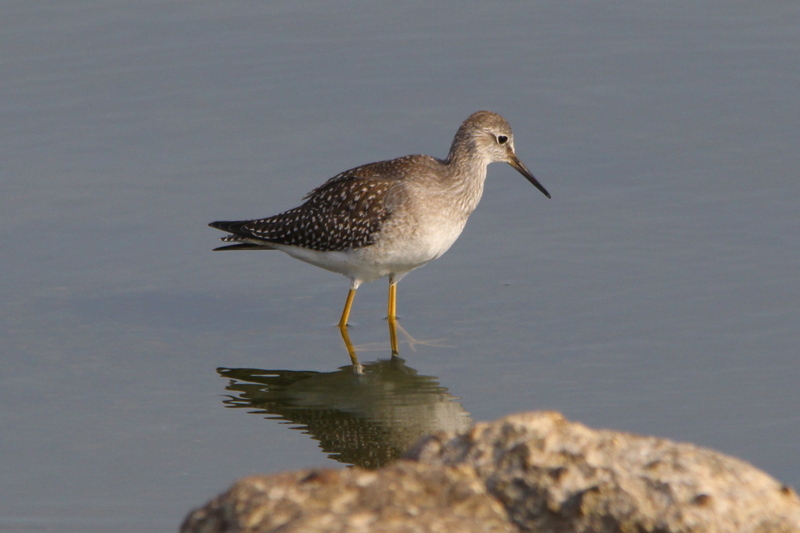 However, outside the breeding season its plumage is drab and less distinctive. In the fall, the Black-throated Blue Warbler can be distinguished by its small white wing patches. 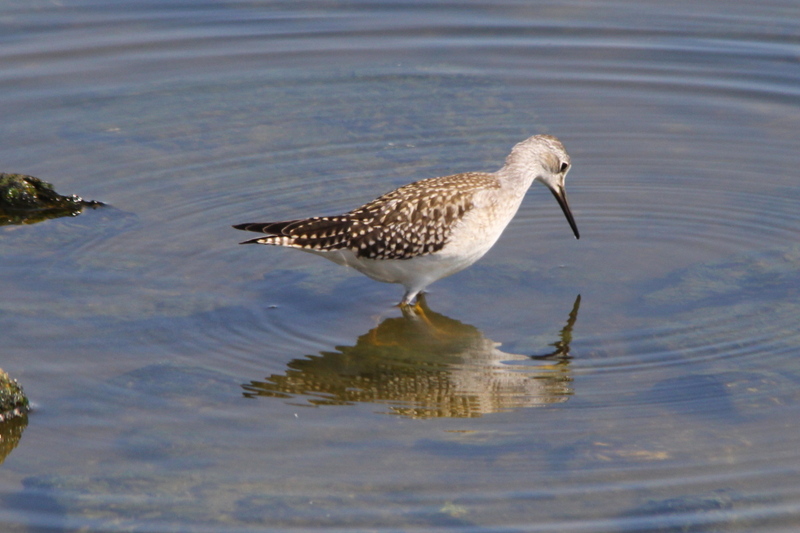 Juveniles have brown upper-parts with a creamy supercilium and brownish spots on the throat, the breast and the belly. 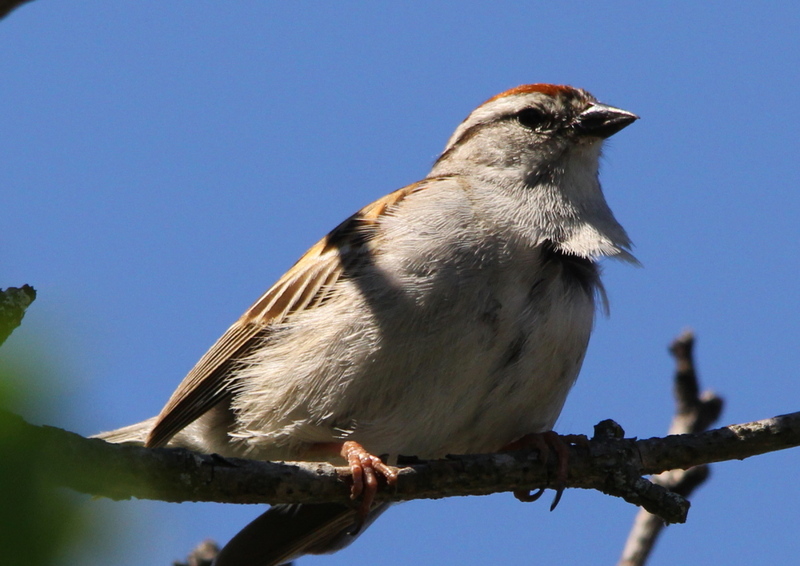 The bird’s song can be described as a buzzed zee-zee-zeeee with an upward inflection. Its call is a flat ctuk. The Black-throated Blue Warbler is a migratory species. 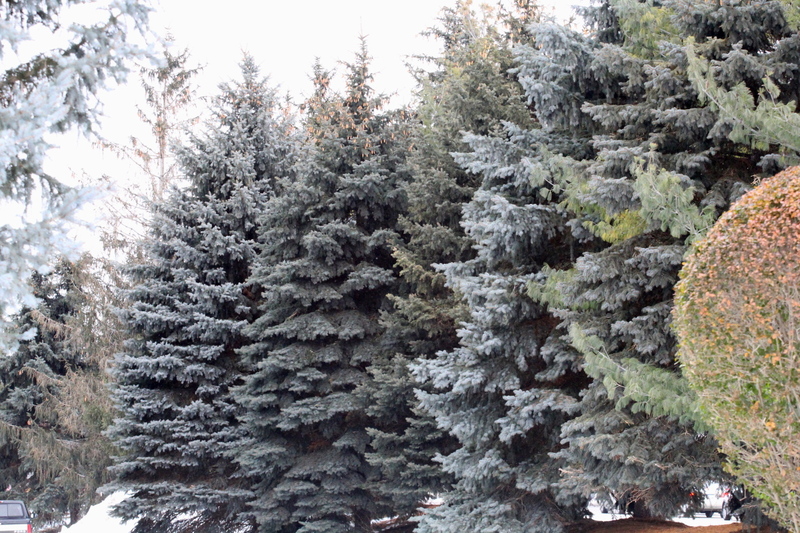 It breeds in temperate mature deciduous forests or mixed coniferous-deciduous forest with a thick understory. 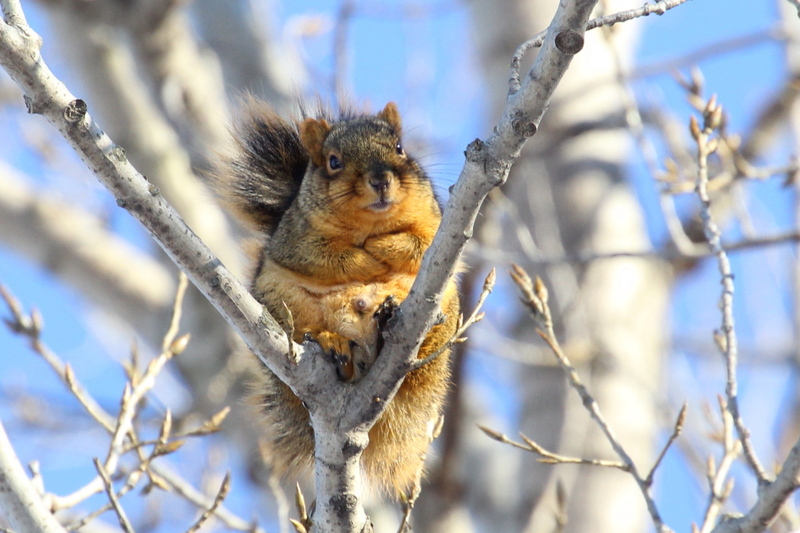 The species is often found in hilly and mountainous regions in the northeastern United States and southeastern Canada. 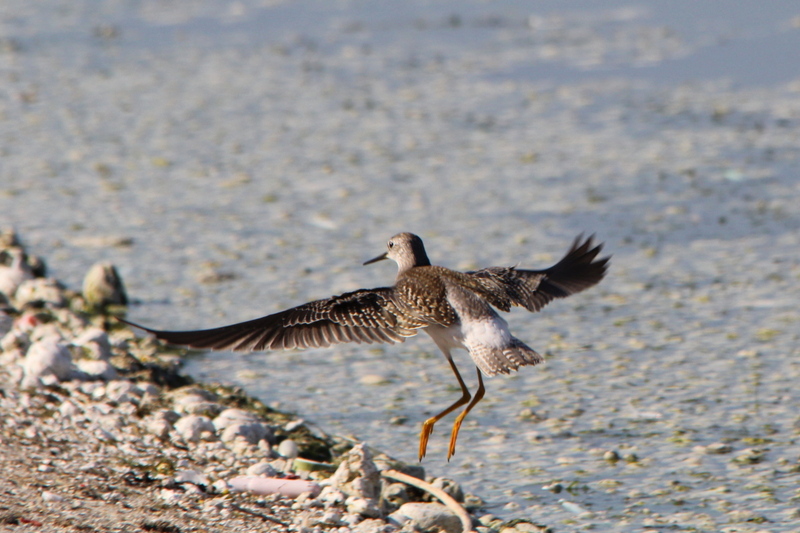 In late summer, it migrates to the tropical wooded and scrub habitats in the Greater Antilles for wintering. 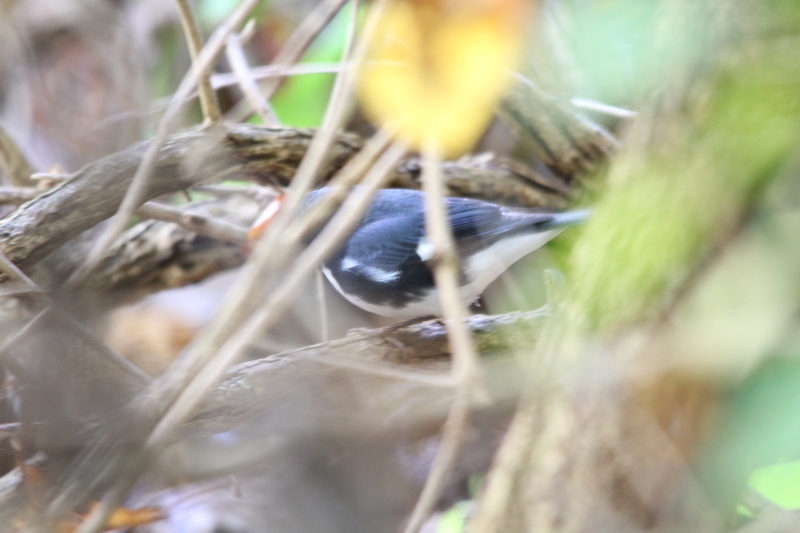 Along the migration route, the Black-throated Blue Warbler can be observed in habitats such as parks and gardens. 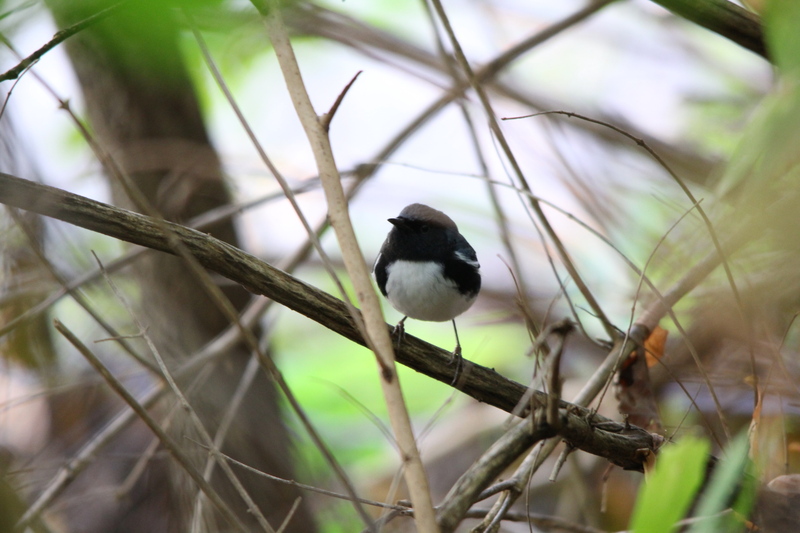 Its nesting site is more important than its foraging site in playing a role in determining the habitat of the Black-throated Blue Warbler. Black-throated Blue Warbler is an open-nesting species, that nests very close to the ground so it has to choose a protected nesting site where the risk of predation is relatively low. 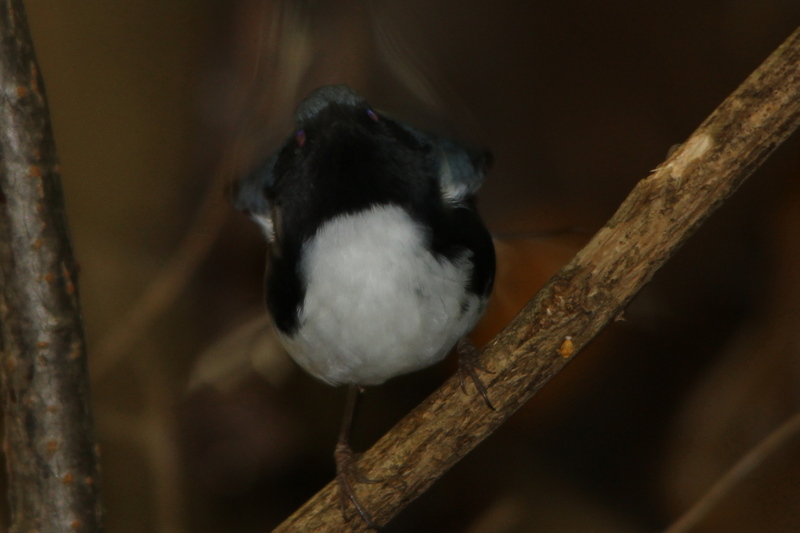 The Black-throated Blue Warbler forages actively in low vegetation, sometimes hovering or catching insects in flight. 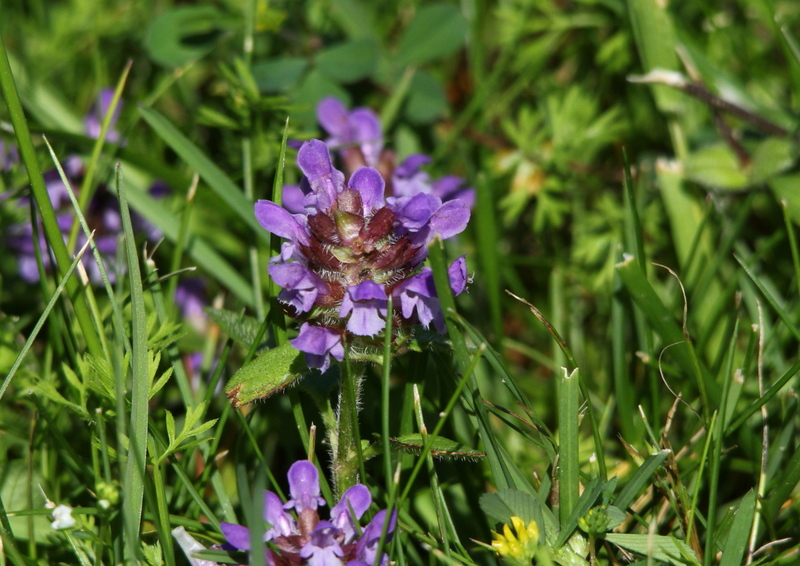 It often forages in one area for a while before moving on to the next. It mainly eats insects such as caterpillars, crane flies, and spiders. 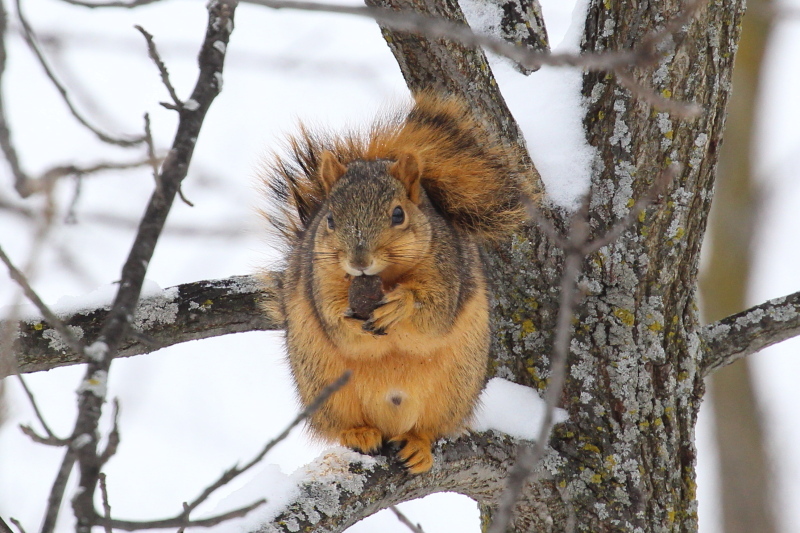 It may supplement its diet with seeds, berries, and fruit in the winter. 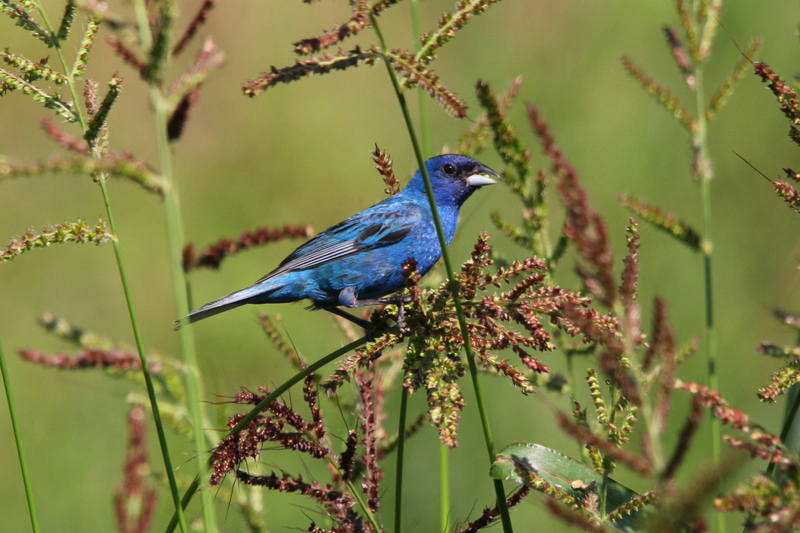 Males and females prefer different foraging sites. While males usually hover among the higher shrub foliage between 3 and 9 m (10–30 ft), females tend to forage at lower strata. The time within a breeding season influences where the males forage. When it is time to feed the fledglings, males come down to the same foraging strata as females. 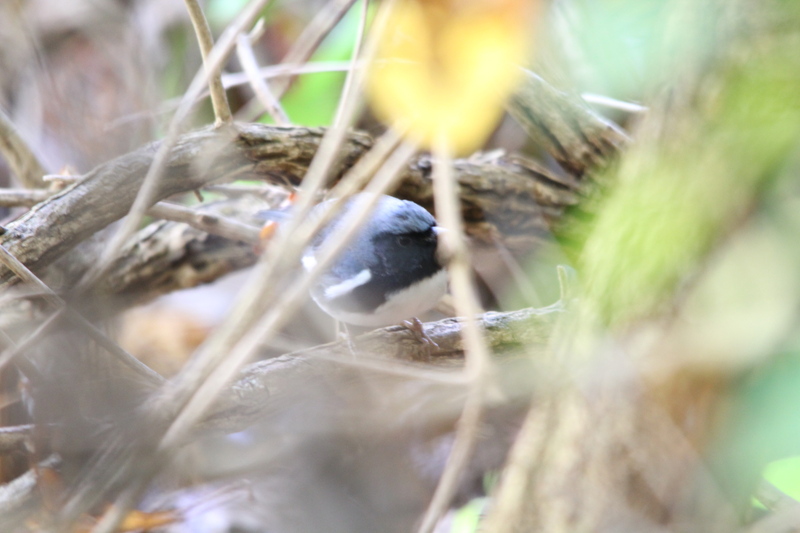 The black-throated blue warbler mostly forages in the understory instead of the canopy. The large leaves and long branches in the understory affect its foraging behaviors. Black-throated blue warbler more often hovers rather than gleans its prey because it is more difficult to glean among thick understory foliage. I only have photos of a male of this species right now, and this series of photos isn’t very good. 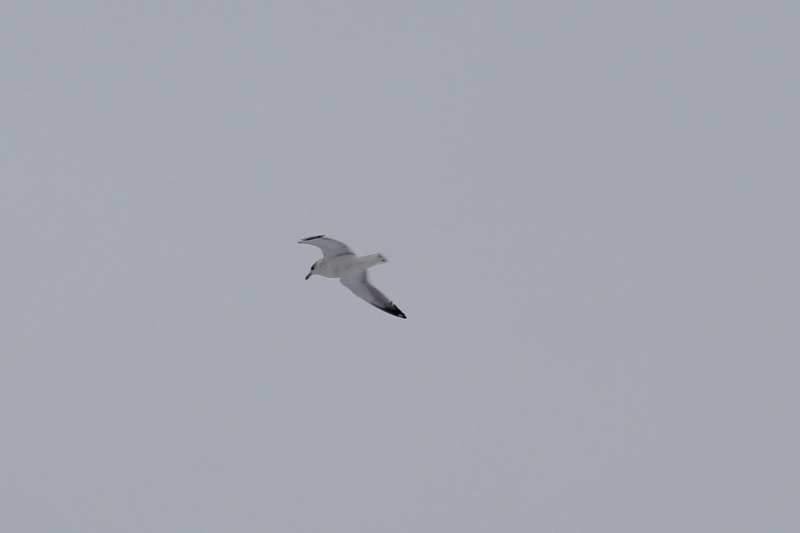 But, it does show my determination to get a good photo of a new species. 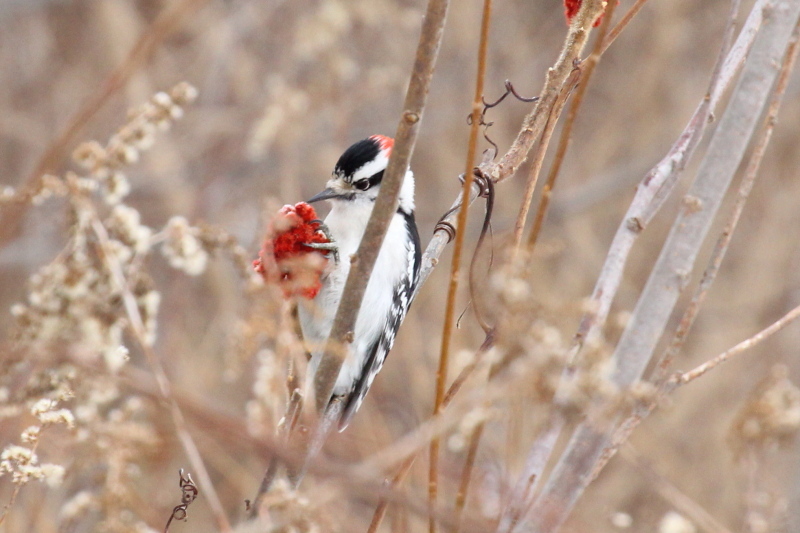 I followed this male around for some time, but it was in very thick brush, so it was hard to get a clear shot of him. He moved deeper into the shade where it was so dark that I could hardly see him. Out of desperation, I removed the hood from my lens and used the flash on my camera for a few of these photos. This is number 140 in my photo life list, only 210 to go! Well, it’s the start of a new week, and in a few days, a new year. I should probably do a post looking back at 2013, and what lies ahead for 2014, but I’ll throw that stuff into these weekly posts as I go. I have a tendency to do that anyway. I was up just before 6 AM this morning, hoping that there would be a little of yesterday’s sunshine left over before the next storm hits, but no luck there. Yesterday was so great, we had 100% of possible sunshine here for the first time since October 14th, two and half months ago. I’d say that it will be another two and a half months before we see another sunny day like yesterday, but as cold as the long-range forecast is looking, Lake Michigan may come close to freezing over. If that happens, we’ll lose the lake effect clouds and snow. It would also mean that the temperature around here would drop as well. Lake Michigan keeps West Michigan 10 to 15 degrees warmer on average than areas directly across the lake from us in Wisconsin. Anyway, there’s a cold front headed this way, and the forecast for the rest of the week is very cold, and of course, lake effect snow on most days. If you’re a regular reader of my blog, you know that last week I purchased a Tokina 100 mm macro lens. There will be a steep learning curve for me as I figure out how to use it well, but one thought has crossed my mind this morning. The Tokina lens is of an older design, the lens extends out as it focuses. Canon’s newer macro lens are internal focusing, they remain the same length as the lens focuses. At first, I saw that as a drawback to purchasing the Tokina, not any longer. The one thing that has really hit home is that for good macro photos, the camera has to be mounted on a tripod. In the few times that I have used the macro lens on a tripod, one difficulty I’ve had is getting close enough to the subject without interference between the tripod and logs, rocks, or something. I’m sure that some one makes an attachment to go on top of a tripod to extend the camera out so that you can get close to a subject, but I don’t have anything like that right now. 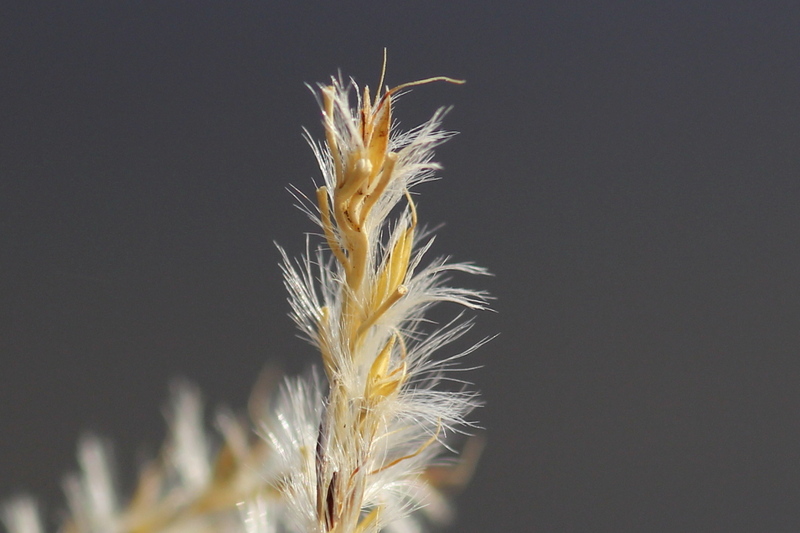 The macro lens won’t get much use until the weather warms up, I knew that when I bought it. This will give me time to play with it and learn how to use it correctly in time for spring, when I think that I’ll be using it a lot. It’s beginning to get light outside, and I can’t believe how much snow melted yesterday! The lawn in front of my apartment is bare of snow, but I’m sure that’s not the norm. I’ve already eaten breakfast, so even though it’s still not completely light out yet, I think that I’ll go for my walk early to try to beat the front coming this way. I did beat the front, barely, but since I wasn’t sure, I took only the L series lens today. 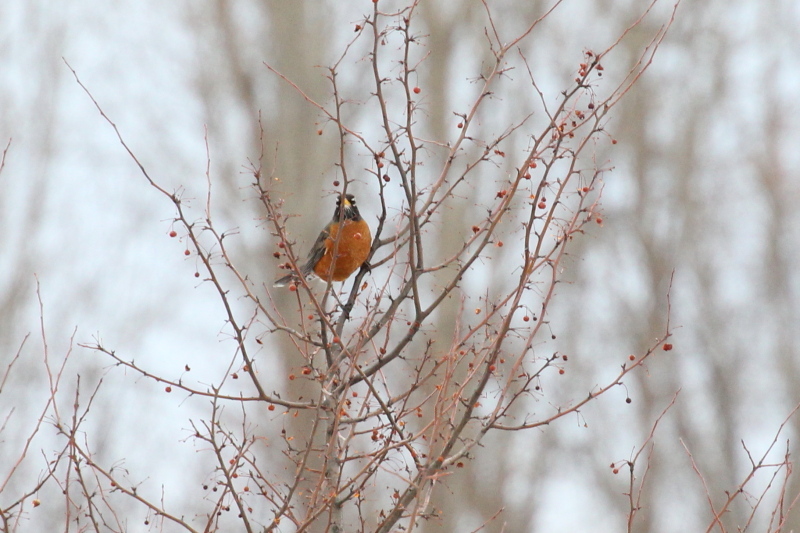 I saw a few birds, including some robins, but other than a few crows, I didn’t try for any photos. I have a few errands to run this afternoon, so this may be it for today, it depends on how I feel when I get back home. The cold and clouds have returned big time! It’s 25 degrees Farenheit colder this morning than yesterday. It looks like the Beast (Sigma 150-500 mm lens) is on vacation for another week, as I’ll be taking just the L series lens with me when it’s this cold and snowing. Since we’re approaching New Years day, time for a little reflection. Of course the big news in my life this past year has been the purchase of my new camera gear. It’s been both an eye-opening experience, and a total blast learning to use the new Canon 60 D bodies that I bought. They’ve made photography fun again. Every photo I shot with the old Nikon was a battle in a way, I never knew for sure what I was going to get when I pressed the shutter release. I can remember spending months fiddling with the settings trying to get it to work correctly, I finally gave up, and would shoot dozens of shots to get a few to post here. It’s been just the opposite with the 60 D, it’s been a joy to use, and it reacts to adjustments just as it should. I’ve been taking a slow, methodical approach to learning the new camera, and I hate to brag, but I think that I am well on my way to getting some seriously good photos from it on a regular basis. It dawned on me yesterday that I haven’t gone much more than scratching the surface of what the Canon is capable of. For example, I have never shot any photos at an ISO of over 1600, and that I probably should, just to see how much sensor noise that I do get from it. I should try that today, as with the clouds, it would be a good day for it. I’ve also added four very good lenses to my kit, the Beast (Sigma 150-500 mm) has gotten the most use so far, because it is such an excellent lens for birding. Matched to the 60 D, it has pulled off some photos that would have been impossible with my old gear, there are many examples that come to mind. I can remember the horrid photos of a barred owl taken with the old Nikon that I posted, you could barely tell that the bird was an owl, and all the branches surrounding it were off-color due to the chromatic aberration in the Nikkor lens that I had. Then I contrast that to both the peregrine falcon and golden eagle photos that I got on recent trips to Muskegon, and the difference is astounding, even though the weather conditions were very similar, cloudy with occasional rain and snow. The EF 70-200 mm is even better than the Beast as far the quality of photos that it produces, with one caveat, it does not auto-focus precisely as I get down towards the limits of its ability to focus on subject at the close end of its range. I’ve found that I have to mount the camera and that lens on my tripod and use live view to get the incredibly sharp photos the lens is capable of. The EF S 15-85 mm lens has been the most fun for me to learn so far, it comes very close to matching the L series lens as far as photo quality, I need to find excuses to use that lens more often, hopefully this spring while I’m on vacation again. All my lenses except for the new Tokina macro lens are zoom lenses, but I find that I tend to use the Beast and the L series lenses at either full zoom in or out, seldom in between. Not so with this lens, I use its full range of focal length, and it does well through its entire range. This is the lens that I have used for many of my close-ups up until now, as its auto-focus works better at close range than the L series lens. The jury is still out on the new Tokina Macro lens. I have shot about two dozen photos with it so far, not enough for a true picture of what this lens can do. I do love the way it functions so far, and that’s a big step towards good photos. Well, I’m back from my rather boring walk today. I shot only a few photos, and most of them were testing the Canon body at higher ISO settings. I’ll get to the photos from today in a minute. But, since it is a time to look back at the old year, and forward to the new year, I think that I’ll go back and use a good photo now and then for this post. I’m going to start with this one from early May, right after I purchased my new camera gear. I didn’t go looking for that photo, or any particular photo, I went back into my archives to early May, and picked one that I liked. I think that I will continue to go back in time to get some of my older photos, as my options for current photos are extremely limited due to the weather. With that one out of the way, here’s the test photo from today at ISO 3200. That’s far better than I had expected it to be, I think that further testing is in order. When I bought the Canon 60 D, I had been used to the Nikon D50 that I had been using. With it, photo quality began to degrade at ISO 400, by ISO 1600, the photos had so much sensor noise that I never shot with the ISO set that high. So, when I did buy the Canon, I set it to go up to ISO 1600, and that’s where the setting had stayed until today. I don’t see that much noise in the photo above, if I have to, I think that I can easily go that high. But, like I said, further testing would be a good thing. Here are the rest of the photos from yesterday and today. As you can see, nothing special at all. I may have to fall back on older photos quite a bit this winter. As cold as it was today, the forecast is for even colder for the rest of the week, with slightly warmer temperatures for the weekend, and lake effect snow for everyday. It’s going to be a long cold winter! Cloudy, very cold, with light snow falling, what a wonderful way to end a year, not. I’m in no hurry to face the weather today, so I’ll take a short look back at one of the other big things as far as my blog this past year. 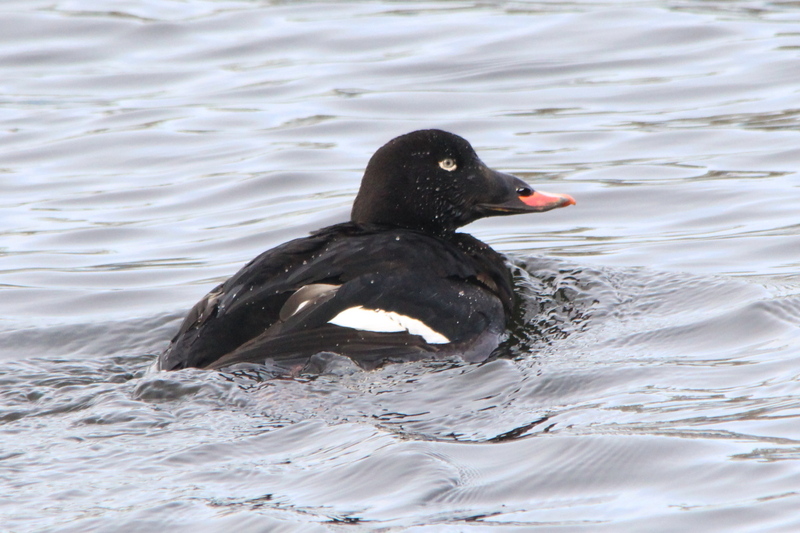 I just posted the 139th species to the My Photo Life List project that I undertook about this time last year. With the photos that I have saved, I can make it to 170 species, just short of halfway through the list from the Audubon Society that I am working from. One good day at Muskegon could put me over the halfway mark, but it doesn’t look as if that’s going to happen any time soon. I knew that trying to get a photo of every species of bird frequently seen in Michigan was going to be a very big challenge, that’s one of the reasons that I decided to try it. But what I didn’t know was how much I would learn in the process. Trying to get usable photos for the project in all-weather conditions has taught me to be a better photographer, but that’s just the beginning. 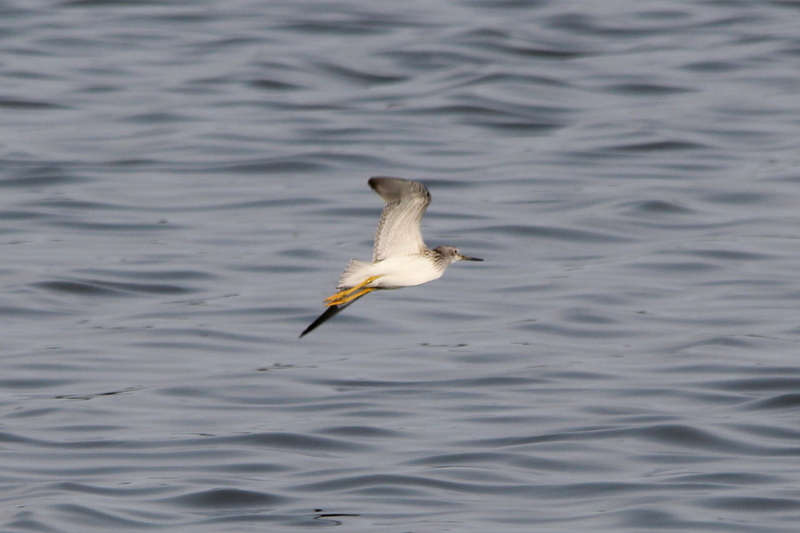 I never knew that there were such species as phalaropes, as just one example. With every species that I post, I learn new things about even the more common species that I’ve watched my entire life. I learn from both the information that I post with each species, and by watching the species closer while I am photographing them. Along with that, I am learning habitat, plants, and the way that species interact. I know that many people find the posts that I do in the project boring, as well as when I ramble on about it here, sorry, it has become a huge part of my life right now. I’m paying even more attention to everything in nature, even if my posts don’t reflect that right now. There will come a time when this blog will expand its horizon’s again, trust me on that. On a somewhat related note, I received the year-end stats for my blog from WordPress, and the posts from my blog that have been viewed most often are the older ones that I have done on places to hike and kayak. I will get back to doing more of those in the future, maybe even this year, I hope. But, that’s for tomorrow and the rest of the week, when I’ll switch from looking back to looking forward. In fact, one of the things that I am going to do in the next week is to start making plans for the coming year. I have two weeks of vacation to use up, I think that I’ll take one in May, the other in October. Then there are the extended holiday weekends as well. I have the new tent/cot to use, I think that it will be just the thing for quick trips once the weather gets better. I’m back from my walk, and it was another of those days where I asked myself what was I doing out there. Unlike a couple of weeks ago, today I had two answers. One was to keep my pathway somewhat cleared to make walking easier. That’s not just for me either, I see that the critters use my path when they can to get around without having to go through the deeper snow. The other reason is to keep my legs in shape for when the weather gets better. Although, I am beginning to wonder if a day off now and then may not be a good thing for my legs. Anyway, there could have been flocks of flamingos or herds of elephants not far off from the trail today, and I may not have seen them. Much of the time I was pulling the hood of my parka down over my face as far I could and still see where I was going, to keep the wind-blown snow out of my eyes. How cold was it out there today? So cold that the bottle of water that I carried in the pocket of my parka turned to slush, that’s never happened before. 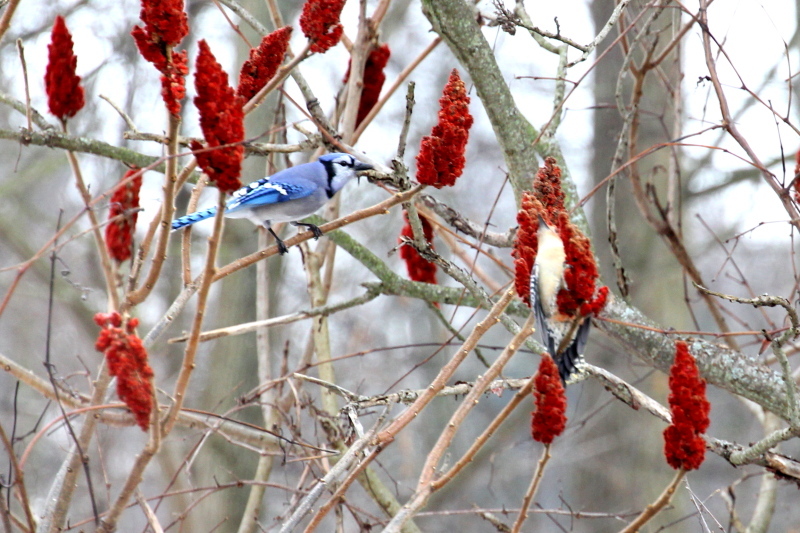 I did see a few birds, very few actually, a couple of blue jays and cardinals, I think that most of the birds were either hunkered down somewhere, or raiding neighborhood bird feeders. I did find one subject willing to have its picture taken. 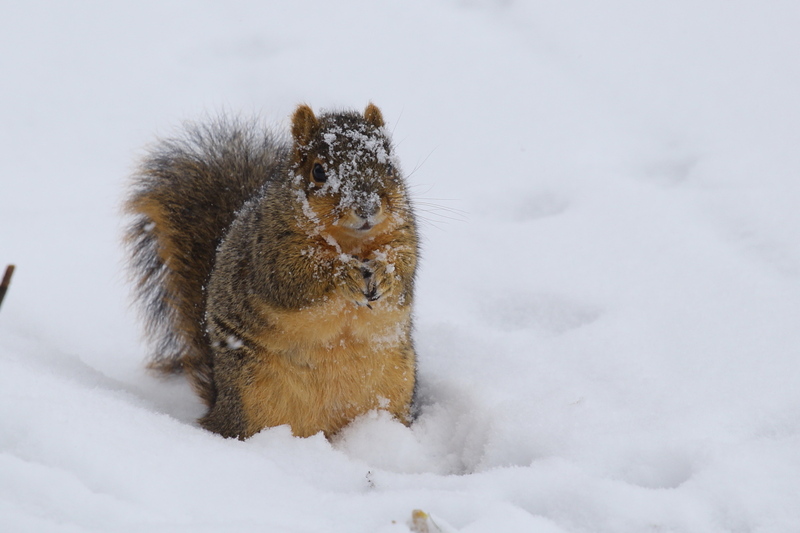 Seeing a squirrel covered in snow struck me as funny, until I noticed that I was as covered in the white stuff as the squirrel was. The difference between us was that my beard hasn’t had a chance to get long enough to keep all the snow in it from melting yet. Well, that’s about it for my walk. I had to work late last night and didn’t get home until almost 3 AM, so I need a nap. Once I have finished my deep relaxation as Mr. Tootlepedal calls it, I’m going to start working on plans for the coming year. I’ll start with going back through my blog to help me decide on when to go where. I knew that there was a reason I started this. But first, another look back at a photo from May. Photos like that are the reason that I purchased the macro lens. I had to crop that one more than I would have liked, with the new Tokina, that won’t be the case any longer. From our local meteorologist….In December, “There were 14 days with no sun, 21 days with less than 10% sun and only 4 days with more than 40% sunshine.” Just peachy. Well, it’s 2014, a new year, so it’s time to start looking ahead, although I’m still going to post a few older photos for at least the rest of this week. As far as looking ahead at the weather, they are using words like extreme and brutal to describe the cold air coming our way for next week. Of course those terms are relative, for while it will be very much below normal for West Michigan, the temperatures they are forecasting would be balmy to people living in Minnesota or the Dakotas. My plan to start planning trips for the new year did not go well yesterday, turns out that I had to work. You have to love working at a company where every one forgets that you even exist, and never tells you anything, not even the work schedule. I guess that I’m still looking back, aren’t I? Anyway, as far as looking forward when it comes to purchasing photo gear, I have one big-ticket item to go, a 400 mm L series prime telephoto lens. I hope to have saved enough money to make that purchase by the time that summer gets here. I should add a better tripod to the big-ticket items, but I can get by with the cheap tripod that I have for now. I also hope to add a teleconverter, or extender, to my kit soon, along with a light source for macro photos. I’m thinking of going with an LED panel rather than a flash, we’ll see when the time comes. But, the things I like about an LED panel is that you can see how the light plays on a subject before you shoot the photo. They are also adjustable, as far as how much light that they emit, which would be a good thing. Flash units can be adjusted, but they are much more difficult, and I’m into easy. Turn a knob as you look at a subject to judge the light is my way of doing things. Best of all, the LED panels are less expensive than a good flash unit. I’m back from my somewhat shortened walk today. It was cold, painfully cold, and since I had done my long walk yesterday, then worked last night, I decided to do the 4 1/2 mile version of my walk today. I know, I wimped out, what can I say. It was so cold that any exposed skin and my fingers ached in the cold, then ached even more when I stepped back inside into warm air. Looking at the photo of the leaping squirrel yesterday gave me an idea. 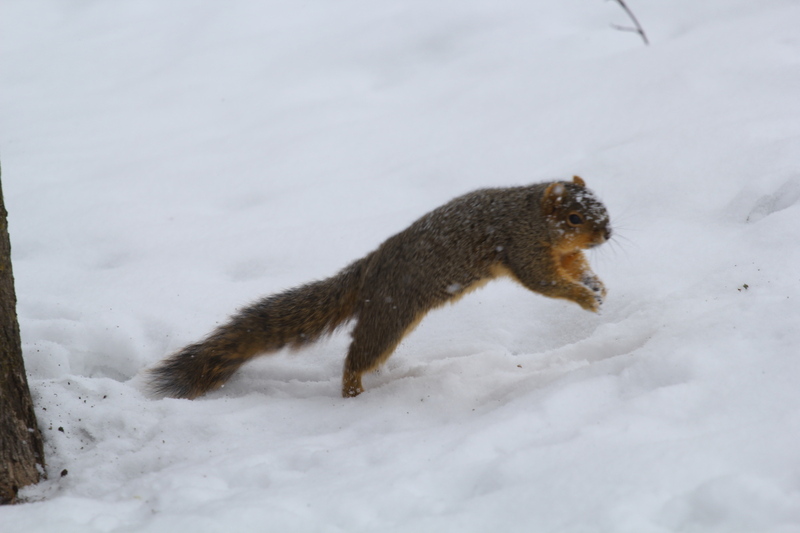 That photo is blurry because the shutter speed wasn’t high enough to stop the squirrel’s motion. Well, I’ve been wanting to check the performance of the Canon body at higher ISO settings, so today I set the ISO to 3200 and left it there, with mixed results. Under what were about the worst possible conditions, these are what I got. But with a little better light, the results surprised me again. Photography is a great way to learn about wildlife. 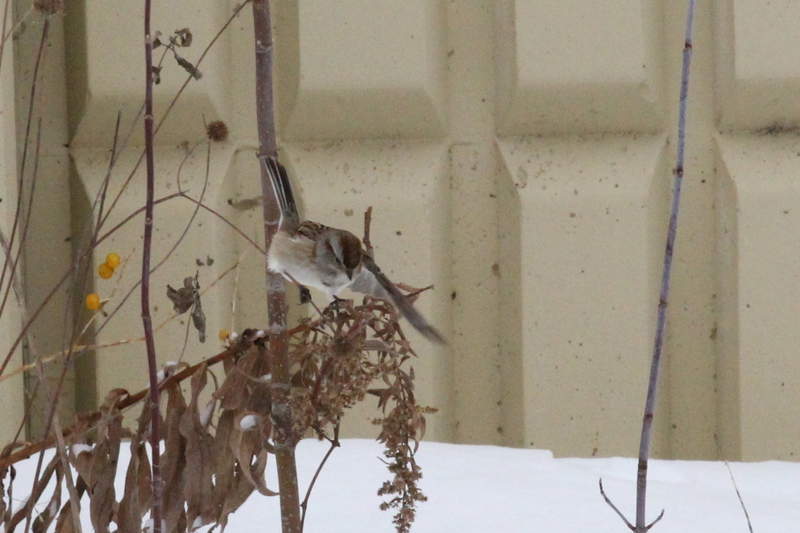 While I was shooting those photos, I noticed that the tree sparrows would land on weeds that couldn’t support their weight, and they would continue flapping their wings, as you can see in the last photo. Then the sparrows would drop to the ground to eat the seeds that they had dislodged from the weeds, as you can see in the middle photo. 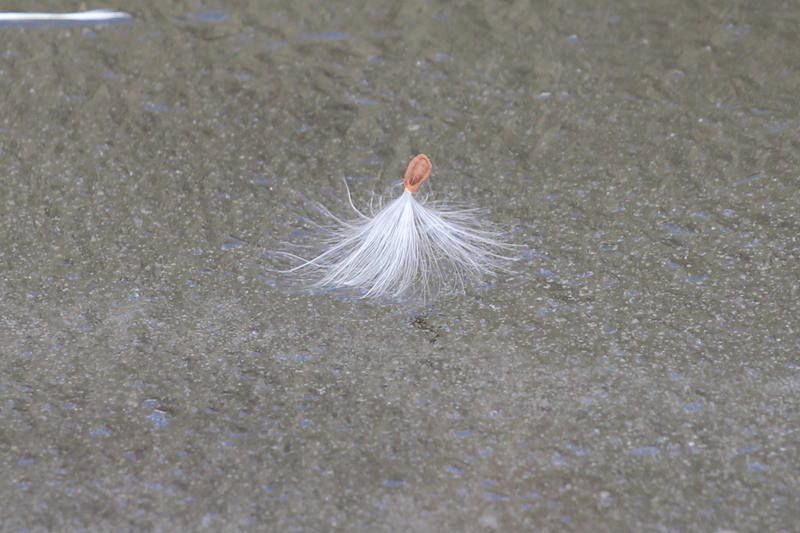 The seeds on the snow don’t show, but I witnessed the same behavior several times. 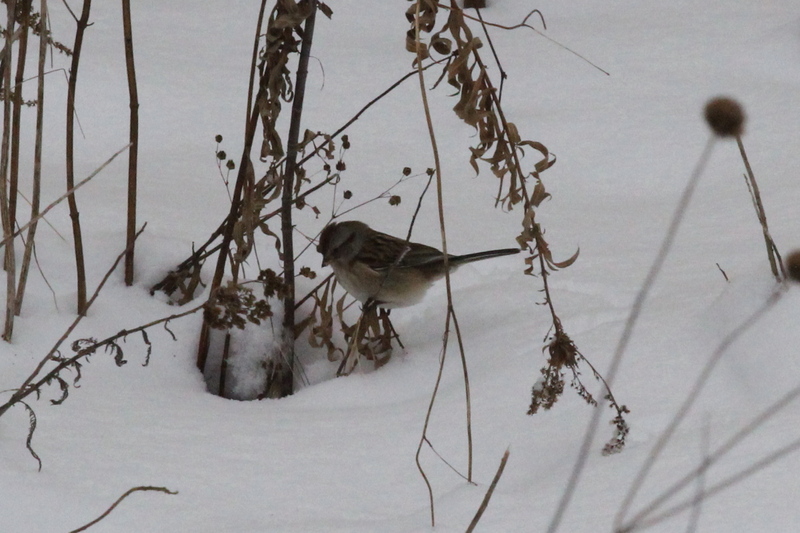 At first I thought that the sparrows were wasting a lot of energy, flapping around on plants that couldn’t hold their weight, until I saw every one of them drop to the snow to eat seeds from the weeds after they had flapped around near the top of the weeds. On my return past where the sparrows were feeding on my way out, I saw many of them near the creek that has a little open water left, getting a drink. Then they would find clumps of grass that the snow hasn’t completely covered, and they would “burrow” back into the grass, out of sight, and out of the wind. And we call them birdbrains. Here’s two more photos from the high ISO testing. Oh, the only noise reduction that I used for any of those photos is that which is built into the camera, no post processing was done to any of them, other than cropping. The amount of noise in these photos is about the same as what I used to get with the Nikon at ISO 800, and much less than at ISO 1600. The few photos that I tried at ISO 1600 with the Nikon were unusable because of the noise. So, I learned something else today, while I would like to keep the ISO set as low as I can for the best photo quality, in a pinch, ISO 3200 will produce good photos with the Canon. Now, for a little look back at two photos from June of 2013. I probably shouldn’t be posting these older photos, they make me wish that winter was over with! After the cold today, I think that I’ll not only be giving the Beast a vacation, but I’ll be giving all my new camera gear at least a few days off. There’s no reason to subject it to these temperatures just for a few lousy photos. I’ll take my Powershot camera with me, it fits into a pocket, and does a pretty good job for a compact digital. 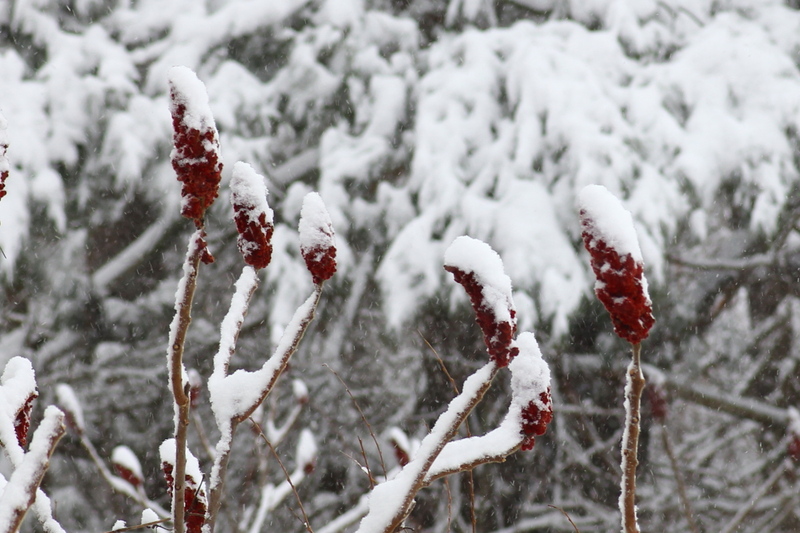 I slipped a few from it into both of my recent posts of photos from the snow and ice storm, and as they appear in my blog here, it’s hard to tell which ones they were. I didn’t write anything this morning before going for my walk today, for one thing, I’m tired of typing cold, cloudy, and windy. The other thing is that my Smart Wool brand hiking socks that have served me so well over the years are wearing out, so I took the time this morning to order some new hiking socks for the rest of the winter. I took just the Powershot compact digital camera with me today, and never got it out of my pocket, so no photos from today. That may be the case for some time to come, as not only do I have to worry about subjecting my camera gear to extreme weather, I’m more concerned for the wildlife than my camera. 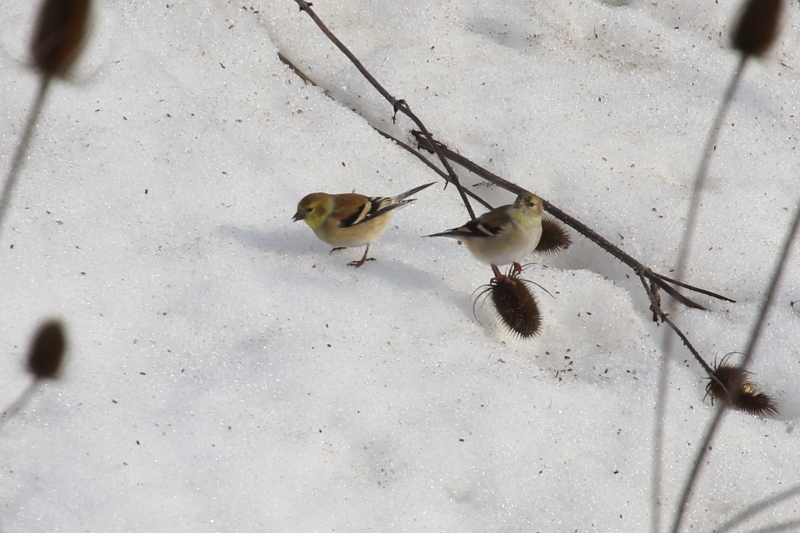 This has already been a hard winter for wildlife, and even though the ice that covered much of the food for critters melted last weekend, now they have to deal with deep snow and temperatures around 0 degrees Farenheit (-18 C), lower than that at night, slightly higher during the day. 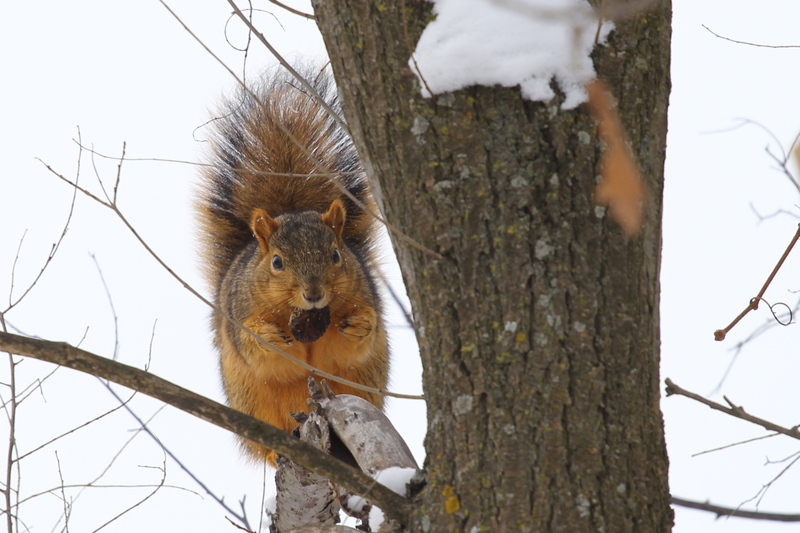 There’s no real relief from the frigid temps in sight, so I’m not going to stress any wildlife just to get a photo for my blog. This winter may turn out to be a blessing in disguise, as it gives me a little bit of a break from blogging. It’s not that I have come to dislike blogging, just the opposite, I love it more now than when I first began, but it does have a habit of getting in the way of other things that I should be doing. Since I don’t have much to write about right now, and the foreseeable future, these posts are going to become very short for a while. This will give me a chance to recharge and refresh as far as blogging when the weather improves. Speaking of the weather, it’s very cold, -7 degrees Fahrenheit (-22 C) when I got up this morning. The good news is that there’s not much wind, and it is sunny outside. The thought crossed my mind to bring the new Tokina macro lens with me this morning when I go for my walk, but I have rejected that idea. There’s no reason to subject my gear to this cold for a few photos and a little bit of practice. There will be plenty of time for that when the weather does get warmer. Besides, the Powershot does a good enough job if I do see something worth taking a photo of. The forecast calls for a slight warm up tomorrow, ahead of the next storm which will bring blizzard like conditions beginning on Sunday, followed by temperatures even colder than today for the first part of next week. I may take a day or two off from walking if it really does get as nasty as they are predicting. But, for the time being, I’ll bundle up and trudge through the snow another day, be back later. I’m back, and I even brought home a couple of photos taken with the Powershot. 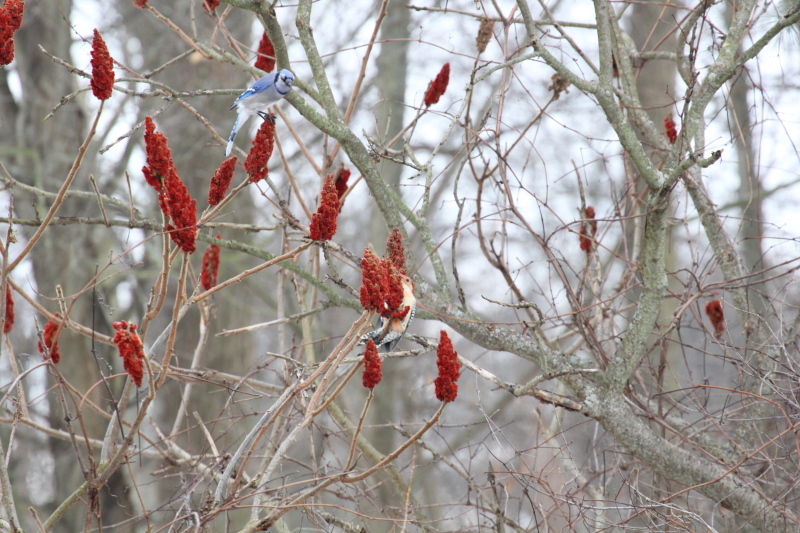 You can almost tell that the bird in this first photo is a blue jay. 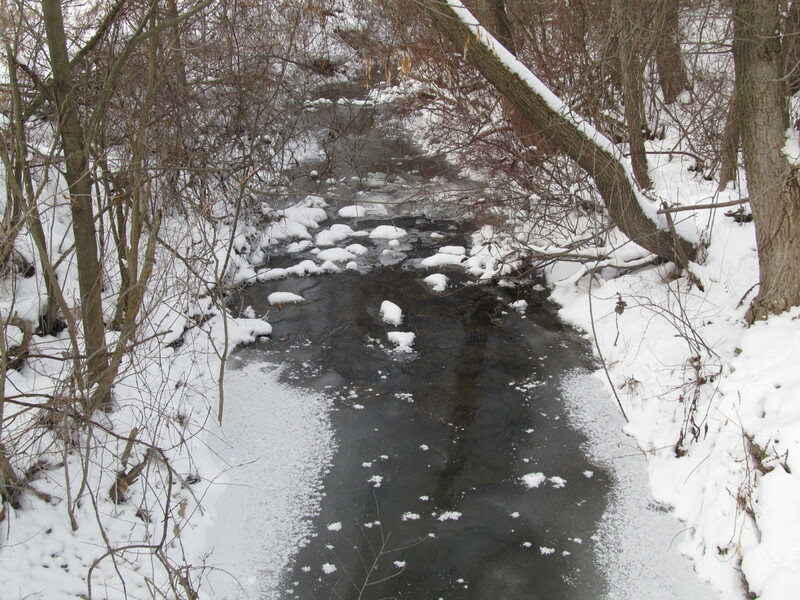 The creek is freezing over in this cold weather. 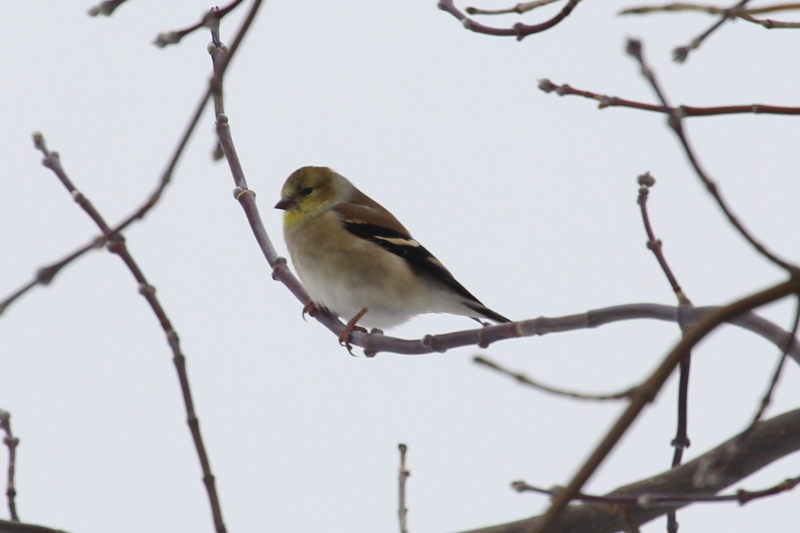 The most remarkable thing about my walk today was that as I stepped out of the door, I heard a goldfinch calling as if it were spring, now that was one confused bird! It’s amazing what a little sun around here will do, even though it was the coldest day in several years. As luck would have it, not long after I began my walk, the clouds rolled in, and the birds all disappeared. Just as I was coming home, the sun came out again, and so did the birds, but I didn’t chase them for photos. I managed to stay comfortable despite the cold temperatures, except for my toes. The New Balance boots I bought last month are very good, but they are lacking the insulation that the old pair that I wore out had. I think that I’ll be able to make it through this winter OK with them, the new socks I have on order will help. But, next year I’m going to spring for a pair of L L Bean pac-boots, no matter what. The only drawback to the Bean boots is that they are heavier than some of the newer boots, but I’ll live with that for warm, dry feet. In looking back to look forward, during both of the longer trips that I took in 2013, I ran myself into the ground trying to do too much, while eating too little. So this year, I am going to slow down, a little anyway, and bring enough food to fuel my body. Trying to hike 6 to 10 miles a day while shooting photos and only eating a little bit of junk food while on the go, and a sub sandwich for supper doesn’t cut it. But, I know me, and I’m not going to take the time to cook, then clean up after, not when I’m by myself anyway. Now if there were some one else along with me, then I would cook, since there would be some one else to handle the other chores while I did the cooking and cleaning. I have come up with a menu as far as food for my trips that I think I’ll be able to stick to, and won’t take up much time or space, we’ll see, but it has to be better than what I did last year. As for the trips, I’m going to take one week of vacation in May to go to the Pigeon River Country to do some trout fishing, and some birding on the side. I never went there at all last year, I miss that area, as I consider it my second home. I may spend a few nights on the Manistee River as well, and fish during all the days but one, as I’ll hike the Mason Tract one of those days. For the Memorial Day weekend, I’ll head up to Alpena to the Ossineke State Forest Campground, just as I did last year to do some serious birding for the entire weekend. Before May gets here though, I’m planning on at least one weekend at each Ludington State Park and the Shiawassee National Wildlife Refuge for birding, as early as the weather permits me to camp out, even if it is in the back of my Forester at Shiawassee. Yippee! I get to type something other than cloudy and cold this morning, it is sunny and very cold, so cold that the heating system in my apartment is not really keeping up very well. It seems to be holding at about 64 degrees F, which isn’t bad, yet, as long as it doesn’t get any worse. Part of the reason for that is because of the strong wind blowing outside, right at my apartment. It is forecast to get a little warmer today, and the wind will pick up in intensity, but swing around so that it’s coming from the opposite direction, which means my apartment will end up being somewhat sheltered from the wind. Of course they are also predicting over a foot of snow in total, starting this afternoon and continuing for several days. With the wind, today would be a good day to stay indoors, but it’s only going to get worse for a while. Temperatures are going to start falling when the snow arrives, and continue dropping until Monday, yuck! So, in a few minutes, I’ll bundle up with an extra layer, and head on out into the cold. Okay, that was weird. It was exactly as I described it before I left for my walk, cold, sunny, and with a stiff wind, but for some reason, it felt comfortable out there, for most of my walk. I did the full extended version that I do on weekends, and I even brought the good camera with the Tokina lens to play with it more. I was glad that I did, even though none of the photos that I got are anything special, other than they show me what a great purchase that lens was. Given that I shot that one handheld while trying to overcome the wind blowing the stalk of grass around, I think that one is pretty good. I tried birding, but 100 mm just doesn’t get me close enough to the birds. But the color rendition and sharpness of the Tokina lens is exceptional in my opinion, which was reinforced by these next two photos. 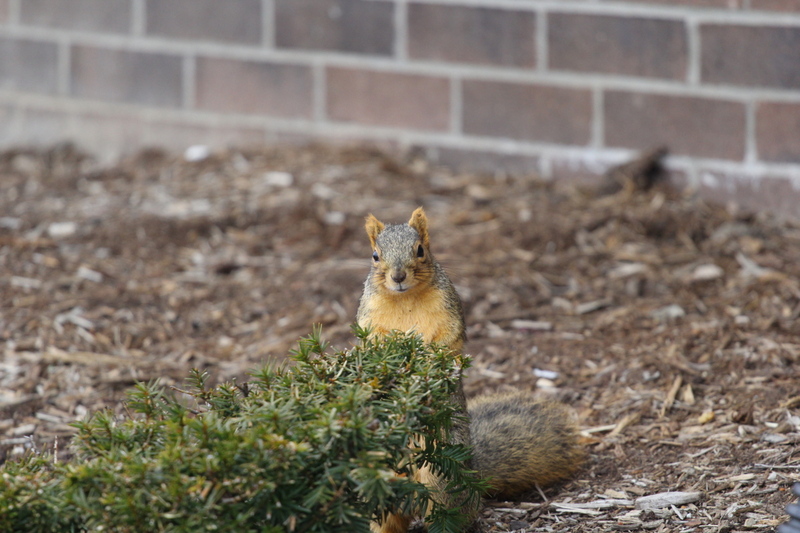 I had planned to crop down on the squirrel, but after seeing the full size versions, I have decided to post the photos that way. The only thing special about those two is how closely they match what I saw with my eyes before shooting the photos, they are as close to real life as I have ever gotten in photos before. The subject matter may not be special, but the sharpness and color are. I tried a few true macro shoots as well. Again, I shot those two hand-held, but I braced myself well against the tree for them. If I had been using a tripod, as I should have, and stopped the aperture down more, those would have been really good. Instead, I went back to birding again. Considering how much I had to crop that one, it is remarkably sharp. As you may be able to tell in that last photo, the clouds had rolled in by that time, and it had begun to snow at a moderate pace. It was as if some one had flipped a switch, or a quick-moving summer thunderstorm, the weather went from pleasant to miserable in less than 10 minutes. I was glad that I was already on my way home by the time that it happened. But, I still can’t get over how nice that it felt for most of my walk given the conditions being what they were. The wind was sustained out of the south at 22 MPH (35 K.P.H.) with higher gusts, and the temperature was at 20 degrees F (-7 C)., but I took my gloves and hood off to keep from overheating. Maybe I’m getting used to the cold, that couldn’t come at a better time considering the forecast! The temperature in my apartment has climbed a couple of degrees as well, and I’m going to see if I can help it out by doing a little baking. Some cornbread sounds really good, so I throw that in the oven right after I finish this. And this one is finished I suppose, unless I prattle on about camera gear for a little longer.